On Friday morning, May 8th, a conversation with marine weatherman extraordinaire, Chris Parker, reassures us that Tropical Storm Ana will exit Charleston prior to our arrival on Wednesday. Except for a few residual squalls, the weather is now calm in the Bahamas. However, traveling north of the Bahamas is out of the question for the next few days as Ana spins her way, ever so slowly, towards the Carolina coast. Under sunny skies, Cutter Loose is underway at 11 AM on a rising tide, exiting through the shallow channel to Black Sound. After a full week of waiting out Tropical Storm Ana at Leeward Yacht Club, it feels good to be underway again. 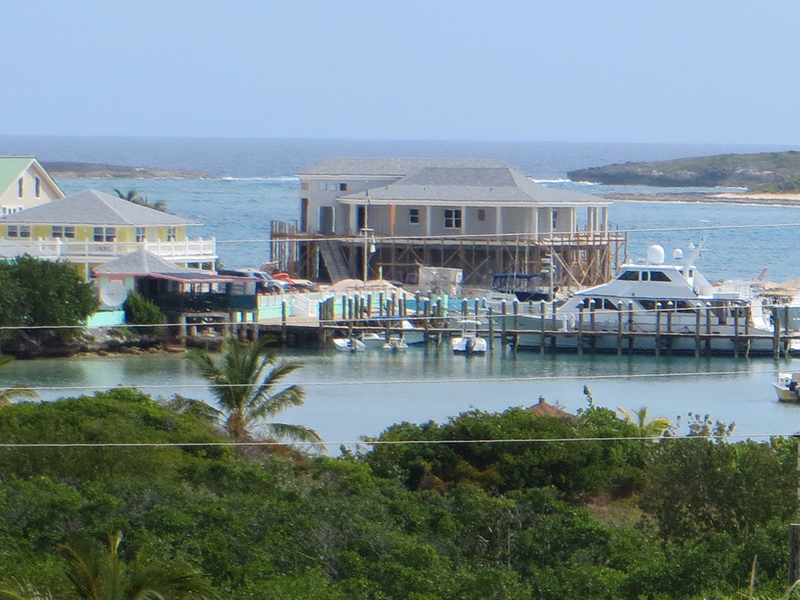 The wind today is from the southwest at 15 knots, which makes for a delightful beam reach towards Powell Cay. 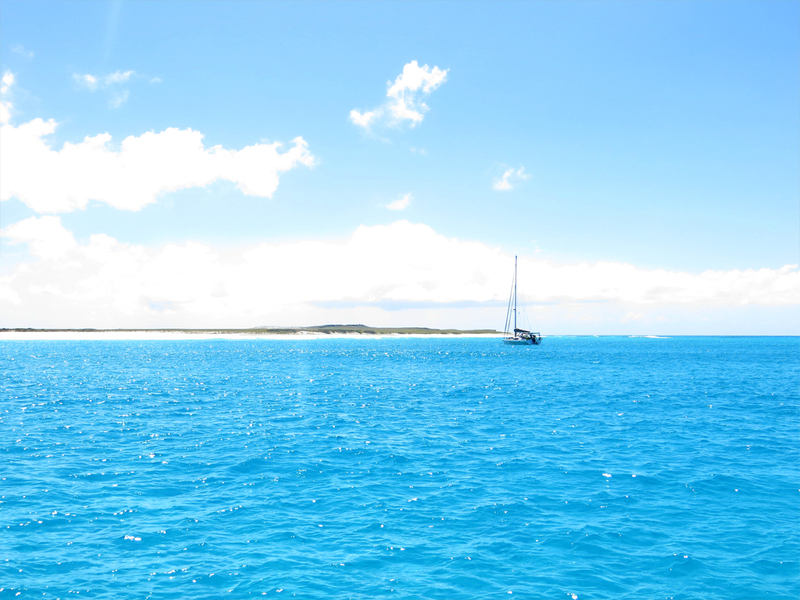 By mid-afternoon, near Crab Cay, our course shifts to the west, directly into the wind. Lightning, thunderstorms and an ominous-looking funnel cloud appear on the horizon…no doubt the outer-squall bands of Tropical Storm Ana. 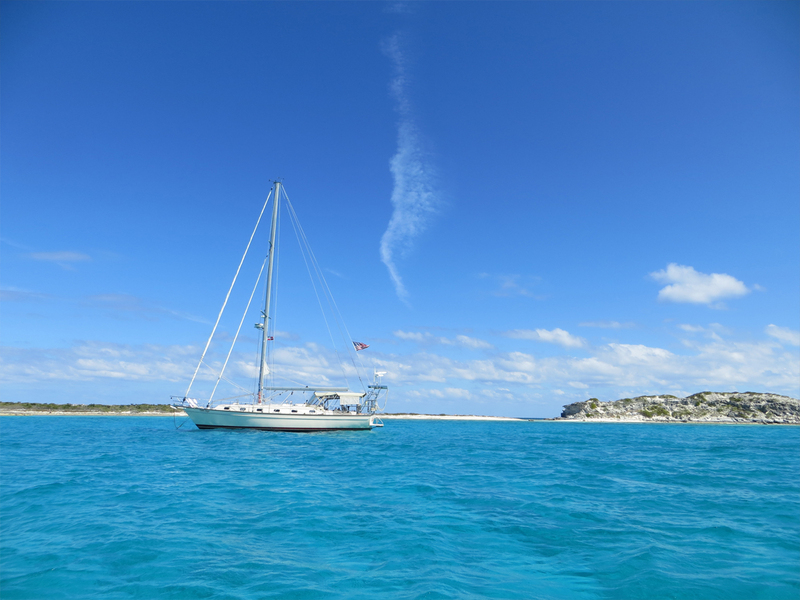 Rather than continuing on into the wind and waves, an overnight anchorage in the lee of Little Abaco Island near Angelfish Point is a logical resting place. 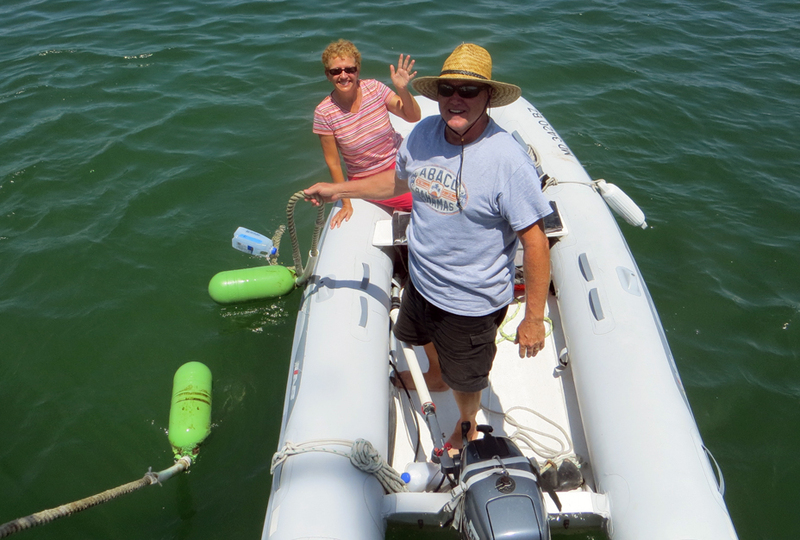 New friends Sharon and Greg aboard s/v Dream Catcher are anchored about a mile from Cutter Loose. Our common objective is to reach Charleston in the coming week. Friends Hayden and Radeen Cochran are also anchored nearby. Their goal is to sail to Fort Pierce, FL when weather permits. A dramatic late afternoon squall, complete with a funnel-shaped waterspout passes a few miles to the north of our anchorage. This serves as a not-so-subtle reminder that Tropical Storm Ana is still nearby. Our strategy for the next few days is to make incremental progress to the west in the relative protection of the Sea of Abaco, being careful to avoid too much northerly travel that will expose us to the residual, adverse-weather impacts of Ana. On Saturday, May 9th, the anchor is up at 8 AM for the 49-mile run to Grand Cay, a remote, fishing village on a barrier island. 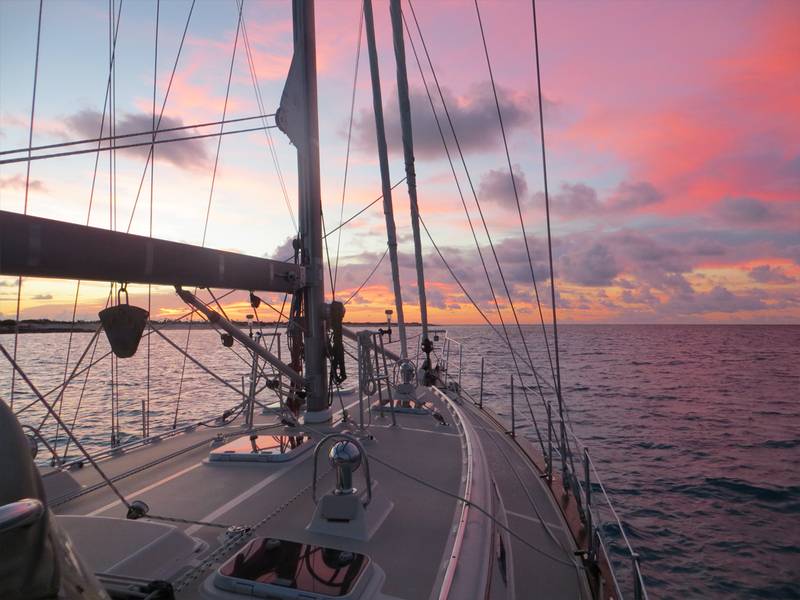 Our overnight anchorage here permits us to make one final check of the weather forecast before proceeding further west on the Little Bahama Bank. 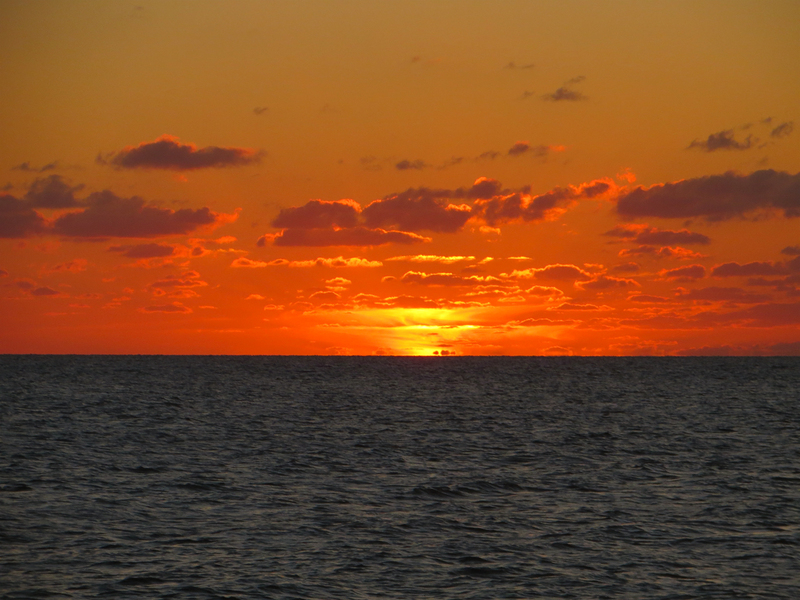 On Sunday, May 10th, the weather remains calm on the Bank and the forecast is a “go” for travel to the east coast of the U.S. Our objective today is to move another 50 miles west to Matanilla Shoal, a shallow sand bar on the extreme northwest corner of the Little Bahama Bank. 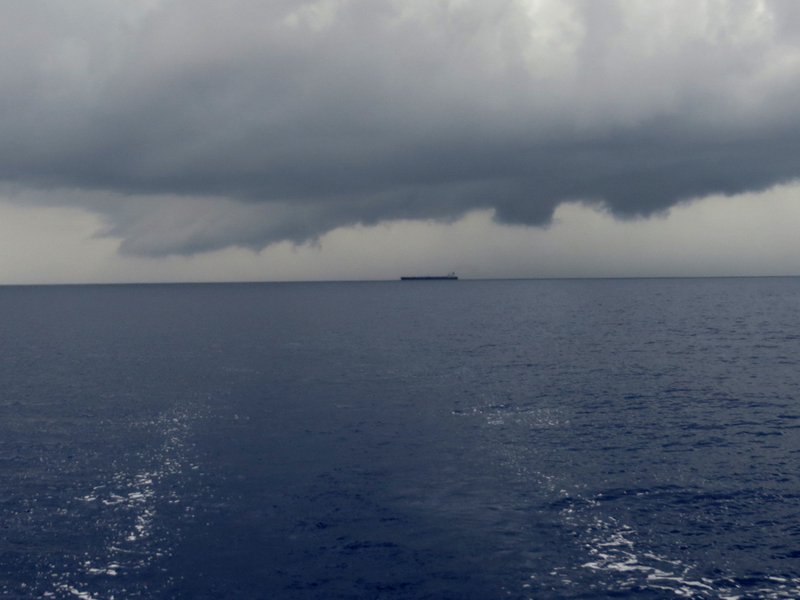 When we arrive at Matanilla Shoal, the wind speed has risen to 12 knots, which is sufficient to produce a nasty 2 to 3 feet of chop in the shallow, open waters of the Bank. This is not the wind and sea conditions we anticipated. The anchor is down at 5:30 PM. Cutter Loose is pitching wildly. Despite the bouncy conditions, we manage to enjoy a meal, a warm shower and several hours of rest before departing for Charleston. At 0100 on Monday, April 11th, Cutter Loose and Dream Catcher are underway. Our ETA in Charleston is Wednesday morning at 10 AM. The course to Charleston is due north, along 79 degrees West Latitude, motor sailing parallel to the coast of Florida with 15 knots of wind on the starboard quarter. Ten miles into our journey, our speed over ground increases slowly at first, then more dramatically upon entering the north-flowing river within the Atlantic Ocean known as the Gulf Stream. 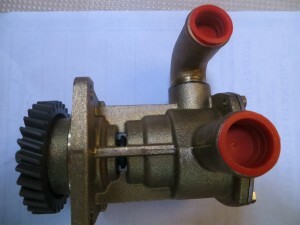 Our tactic at this juncture is to reduce engine speed to conserve fuel and go with the flow, aiming for the center line of the Stream where the current is strongest. Soon, Cutter Loose is speeding along towards Charleston at 9.3 knots of speed over ground…a 3.5 knot favorable current. The Gulf Stream can be a formidable foe when opposed by wind. But today, it is our ally. Seas are running 2 to 3 feet with long-interval waves, making for a comfortable sail on a broad reach. Other than Cutter Loose and Dream Catcher, there is little traffic in the Gulf Stream today. Southbound vessels do not transit these waters given the adverse current of the Stream. Faster-moving, northbound vessels are required to alter course in order to avoid collision when overtaking slower sailboats. 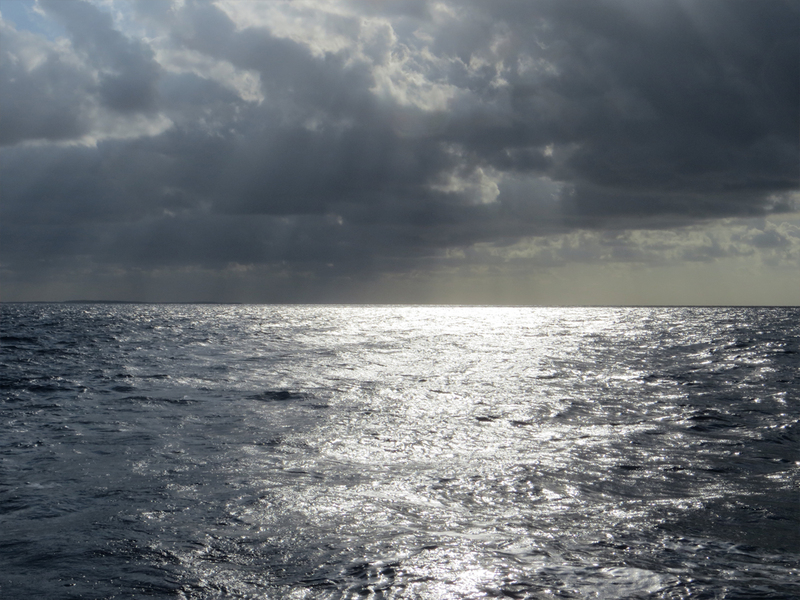 With settled weather, it is a stress-free day on the Ocean. The remote threat of collision today is from eastbound and westbound fishing vessels, cargo ships and passenger vessels headed to and from the coast of Florida. At 5 PM on Monday, our position is roughly 50 miles east of Daytona Beach. Each morning, we check in with our weather forecaster via SSB high-frequency radio. It now appears that a weak cold front will exit the coast near Charleston at 3 AM on Wednesday. This front will usher in adverse winds from the north. These winds will create a bumpy ride which is sure to impede our progress. The favorable boost from the Gulf Stream has exceeded our expectations. 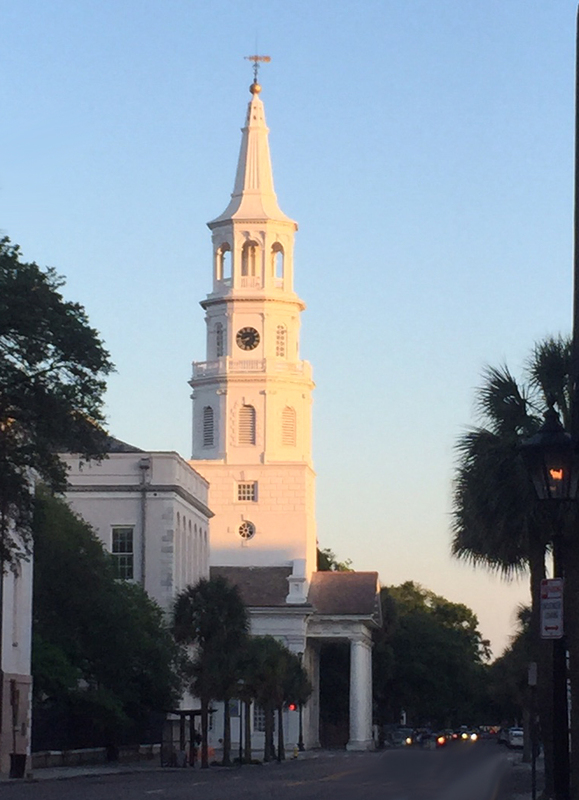 On Tuesday morning at 8 AM, the remaining distance to Charleston is less than 100 miles. From this waypoint, the center of the Gulf Stream meanders to the northeast towards Cape Hatteras while our course continues due north to Charleston. Gradually, the beneficial effect of the Stream will diminish as we approach our destination. With a little luck, it may be possible to reach Charleston on Tuesday evening, thereby avoiding the northerly winds associated with the forecasted, cold front. After conferring with Dream Catcher, the decision is reached to quicken the pace, in the interest of an early arrival in Charleston. Fortunately, the western edge of the Stream continues to provide a beneficial boost throughout the afternoon hours. By late afternoon, thickening clouds appear on the western horizon. The southeast wind freshens to 17 knots, increasing boat speed. Our ETA in Charleston is now 7 PM, one full hour before sunset. Breathing a premature sigh of relief, our arrival at the Charleston channel breakwater occurs just before 7 PM. To our dismay, the ebb has already begun. With three knots of adverse current on her bow and 5 miles to go, Cutter Loose struggles under full throttle to battle her way into the inner harbor under ominous skies and increasing wind. An overcast sunset rapidly gives way to complete darkness as Fort Sumpter passes to port. Entering the inner harbor, the dazzling array of flashing lights overwhelms the senses. Motoring to our anchorage is akin to navigating one’s way through a maze of Christmas trees adorned with hundreds of red and green lights. It is difficult to locate the next pair of flashing channel markers amidst the brighter range lights whose intensity command attention. Tired and disoriented, these final few miles will prove to be the most demanding segment of our passage from the Bahamas. Since the ebb is flowing, this is an opportune time of day for the floating behemoths (i.e., container ships, ROROs and bulk carriers) to head out to sea. First there is one outbound vessel, then another even larger than its predecessor. Soon there is a virtual parade of huge ships exiting the harbor. These giants rightfully own the Cooper River channel. We can barely make out their shapes in the darkness, but their oversize AIS imprint on the chart plotter is unmistakable. The VHF radio crackles with admonishment from the pilots, urging Cutter Loose to move outside of the red channel markers and into the shallower, peripheral water. Still fighting the tidal current, we inch our way inland just outside the red side of the channel. Transiting one set of channel markers at a time, Hog Island Marina eventually passes to starboard. Beyond the marina is the brightly illuminated tourist attraction, the carrier USS Yorktown, resting quietly on her moorings. Finally at 9:30 PM, the anchor is down in a small opening, just north of the USS Yorktown. In the past 45.5 hours, 300 miles have passed beneath the keel of Cutter Loose. It feels good to be back in the USA, safely at anchor, well ahead of the approaching cold front. Sleep comes exceptionally easy tonight. On the morning of Wednesday, May 13th, the wind is piping into the harbor from north as predicted. Slack-low tide occurs at 10:30 AM. The anchor is up for the short trip across the Cooper River to the Charleston Maritime Center where Cutter Loose will remain docked at the marina while we unwind and indulge in the delights of this vibrant and charming city. Over the next three days, we will attempt to make up for 160 days of absence from the commercial amenities and creature comforts that we enjoy here in the United States. With so many fine restaurants within a ten-minute walk from the marina, it just doesn’t make sense to prepare a single meal aboard Cutter Loose. 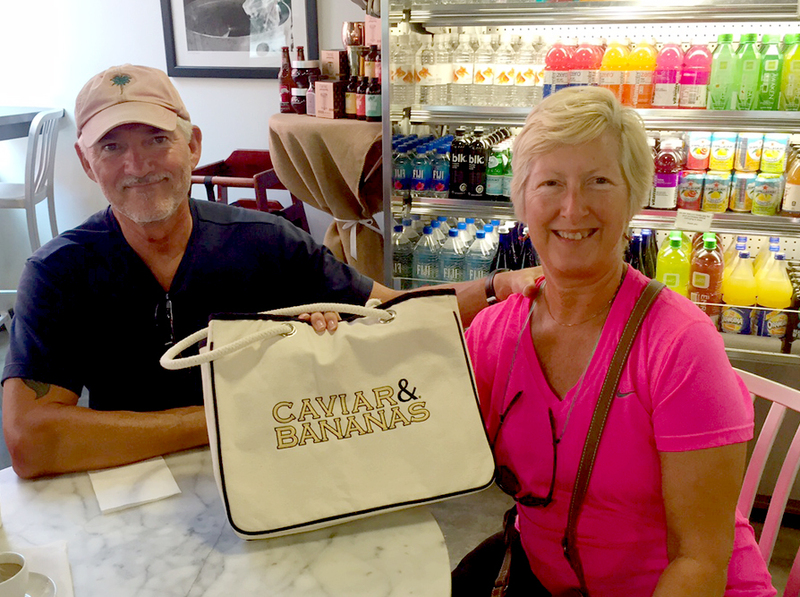 Our friends Greg and Sharon aboard Dream Catcher are full partners in this indulgence, exploring the wonderful little nooks and crannies of the historic district while re-familiarizing ourselves with the local food culture. It is still May, but we are already behaving like ravenous Alaskan brown bears, gorging ourselves with sufficient calories to survive the long, cold winter ahead. 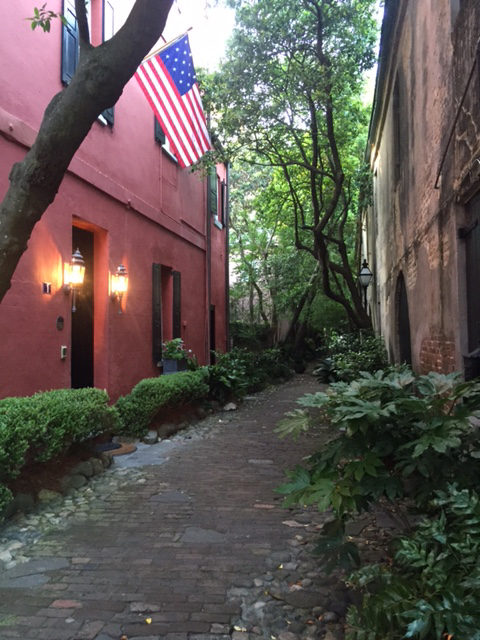 The City of Charleston is a delight to the senses, made even more so by the convivial companionship of Greg and Sharon. On Friday, May 15th, we welcome visitors aboard Cutter Loose. 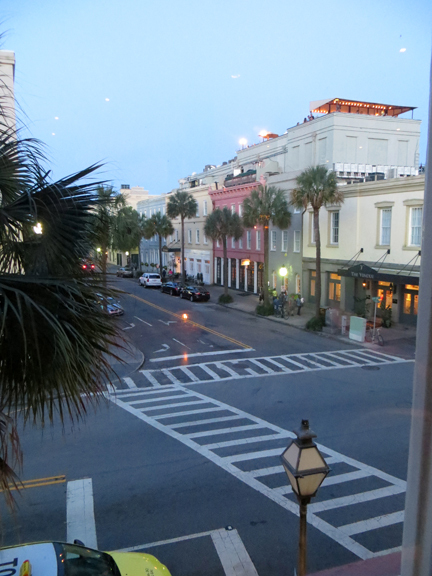 To our good fortune, niece Sandy and her friend Rosemary just happen to be spending a girls’ weekend in Charleston. We were treated to a delectable meal at FIG, which provided an opportunity to become acquainted with Rosemary while receiving an update on Sandy and her family. A fun evening was enjoyed by all. 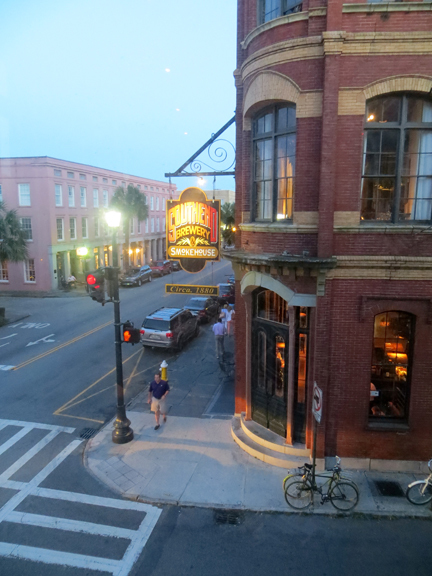 It would be so easy to remain in Charleston for a month. However, the time has come to bid a temporary farewell to this special place. On Saturday morning, May 16th, Cutter Loose will depart on the ebb for Beaufort, NC. On Friday, April 17th, we bid farewell to the Exuma Cays and set sail to Rock Sound Settlement on the Island of Eleuthera. There is a light breeze in the 13 to 15 knot range from the southeast this morning. Seas are a scant 3 to 4 feet. 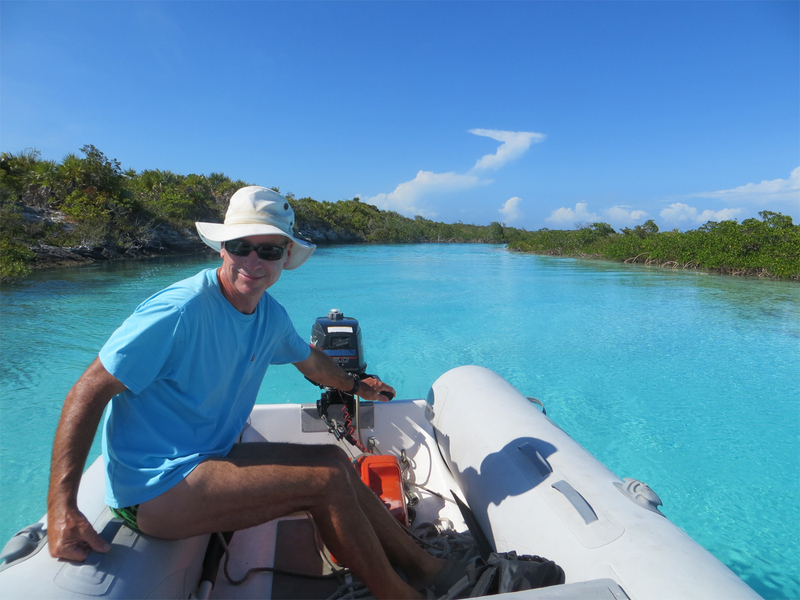 This places Cutter Loose on a mellow beam reach across Exuma Sound to Powell Point on the southwest coast of Eleuthera. There are few things in life that are more satisfying than an early morning departure on a sunny day, sails drawing perfectly and waves lapping lazily against the hull. Today’s schedule is relaxed. With 50 miles to our destination, there is no need to rush. At our current speed, we will arrive in Rock Sound by mid-afternoon. Other than our departure this morning through Warderick Cut, there are no tricky channels to navigate. Tide and current are not major considerations. Today is a day for the enjoyment of being outdoors and sailing silently to a new destination. From Powell Point, it is a short distance around Kemps Point to Rock Sound Harbor. The harbor is immense and quite shallow in spots. There are a four cruising boats at anchor upon our arrival. Rock Sound is slightly off the beaten path of cruisers. For Cutter Loose, it is a stepping stone to northern Eleuthera where we will stage for an eventual passage to the Abacos. There are a few amenities in Rock Sound Settlement of interest to cruisers including a laundromat, a coffee shop with free Wi-Fi, a few restaurants, a bank with an ATM machine and a reasonably well-stocked grocery store. Several buildings in the Settlement give the appearance of being storm-damaged. Since they lack roofs and windows, they appear to have been uninhabitable for decades. The major visitor attraction in Rock Sound is a blue hole located one-half mile inland from the harbor. The community has created a public park at this site. The blue hole is a salt water pond that connects through underground caverns to the sea that were formed 300,000 years ago. Salt water reef fish inhabit the blue hole. 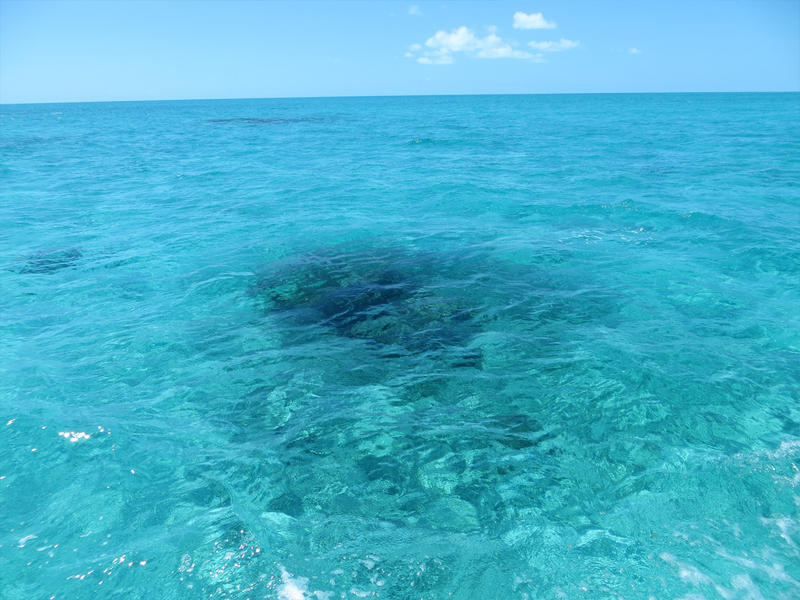 The depth of this blue hole is over 600 feet. 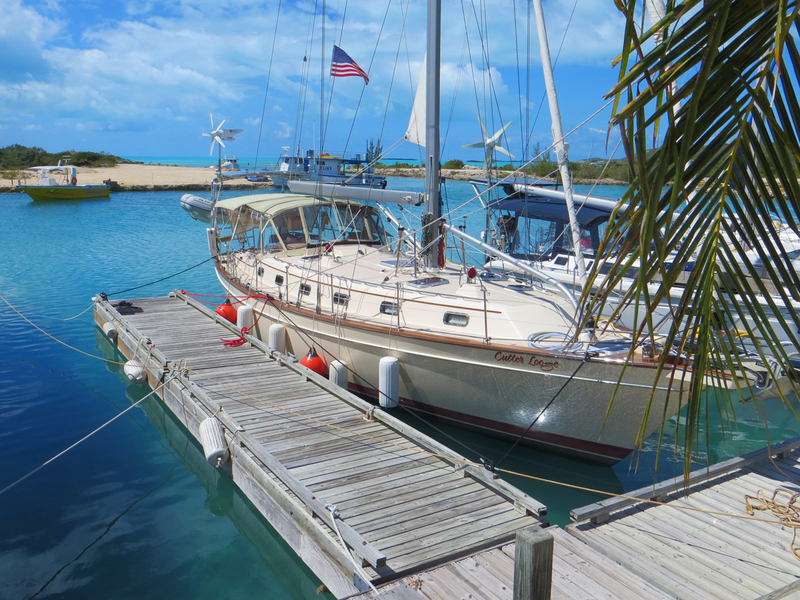 On Sunday, April 19th, the anchor is up at 7:45 AM for the long 70-nautical mile trip to Spanish Wells in northern Eleuthera. Due to the relative absence of wind, our journey today is a motorsail event. Our course today takes us through Current Cut, a narrow opening between the Island of Eleuthera and Current Island. Our 4:30 PM arrival at Current Cut coincides with the final hour of ebb tide which provides one knot of favorable current through the cut. 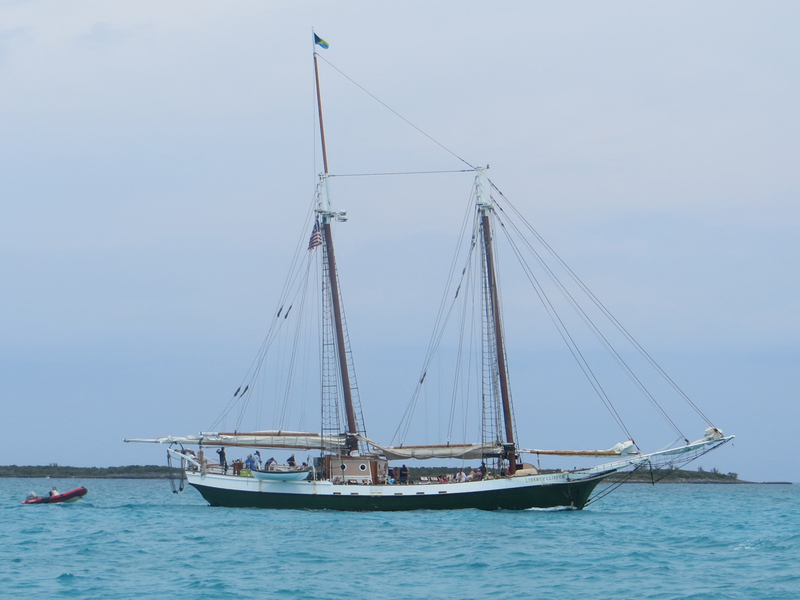 Finally at 6:15 PM, Cutter Loose is tied to a mooring ball on the east side of the busy harbor at Spanish Cay. 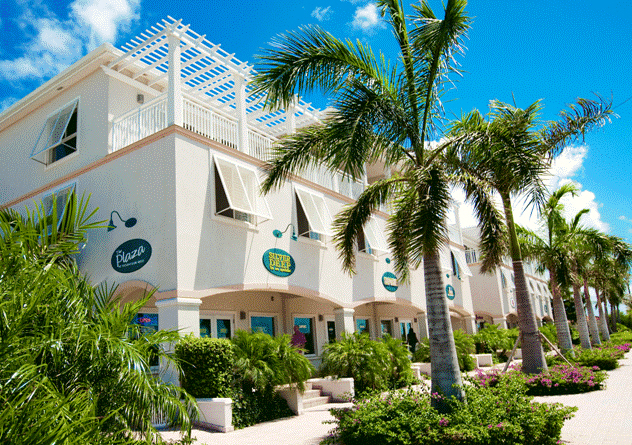 A day excursion to the nearby resort destination of Harbour Island has been organized for Monday, April 20th. This is an opportunity to meet our fellow cruisers in the mooring field who coincidentally will be making the trip to Harbour Island. The fast ferry from Nassau makes a stop at Spanish Cay en route to Harbour Island. From here, it is a 30-minute ride at 18 knots through a reef-strewn body of water known ominously as the Devil’s Backbone. The cruising guides strongly suggest hiring a local pilot when transiting these waters for the first time. It is unclear whether this passage is as treacherous as the cruising guide suggests. Not wishing to tempt fate, we rationalize our decision by concluding that it is cheaper and faster to ride in the air conditioned comfort of the ferry and leave the navigation to the professionals. Given the short duration of our visit, Harbour Island is best experienced by golf cart. 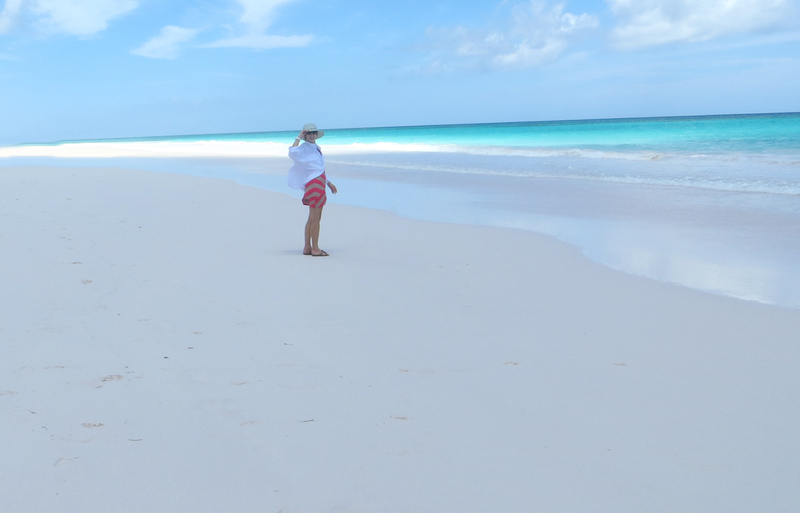 After the mandatory visit to Arthur’s Bakery, we steer the golf cart directly to Harbour Island’s primary attraction…a three-mile stretch of wide beach with silky, smooth sand. It is referred to as “Pink Sand Beach” because the sand is comprised of tiny grains of coral and shell. This is a world-class beach that rivals the magnificent pink sand beach on the Island of Barbuda. 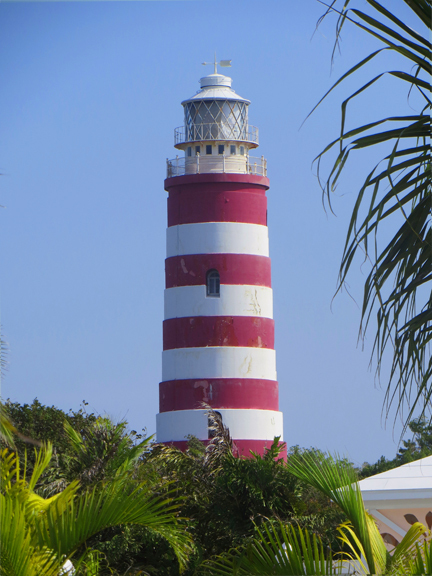 It is well worth the visit to Harbour Island just to witness this famous local landmark. 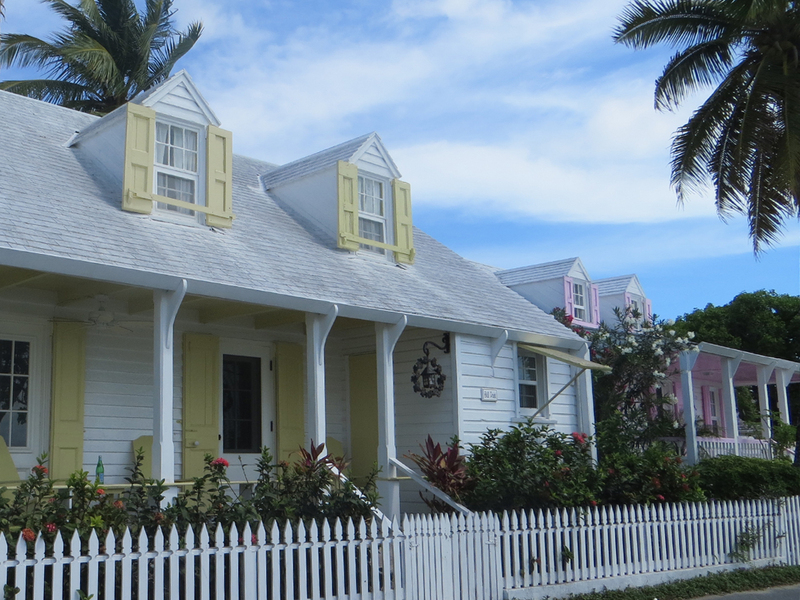 Accommodations on the island consist of several small hotels and a larger number of rental cottages. 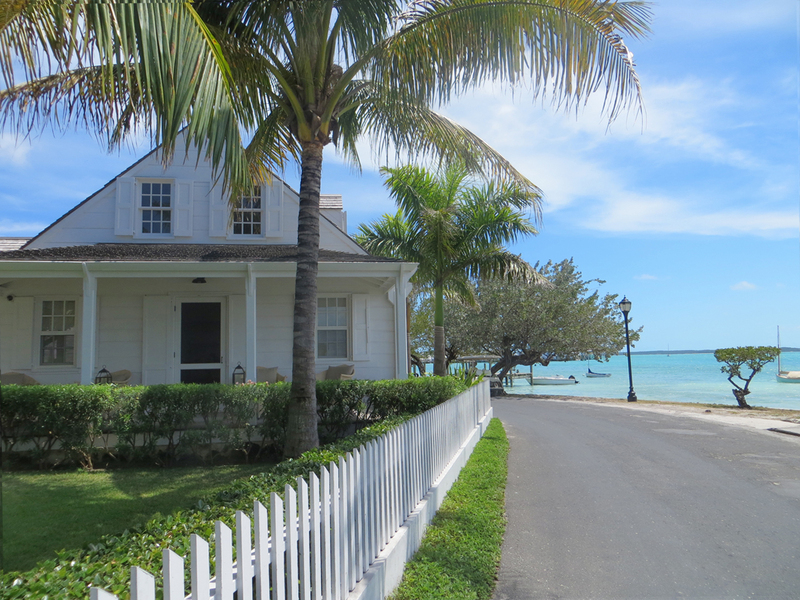 Many of these bungalows date back to the shipbuilding era of Harbor Island in the late 1700s. 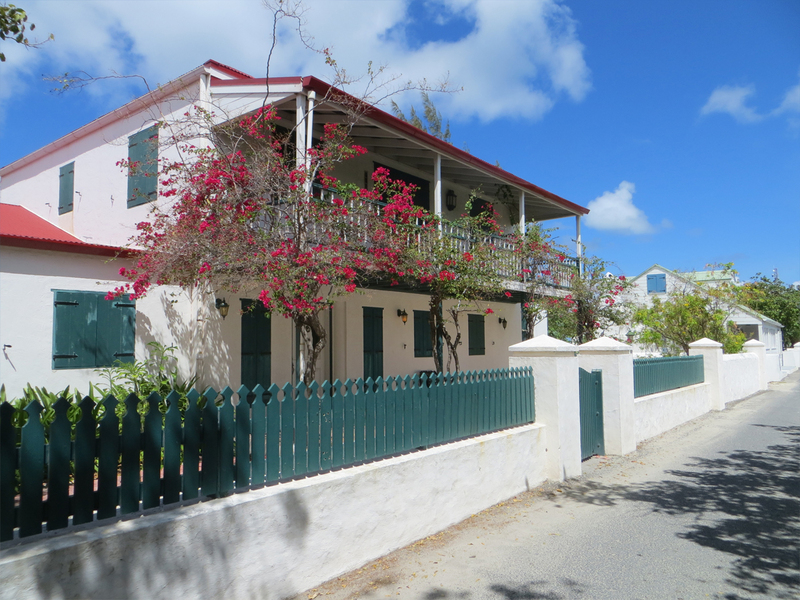 Some of these cottages are located on the bluff overlooking the Pink Beach while others are located along the streets of Dunmore Town near the government dock and marinas. 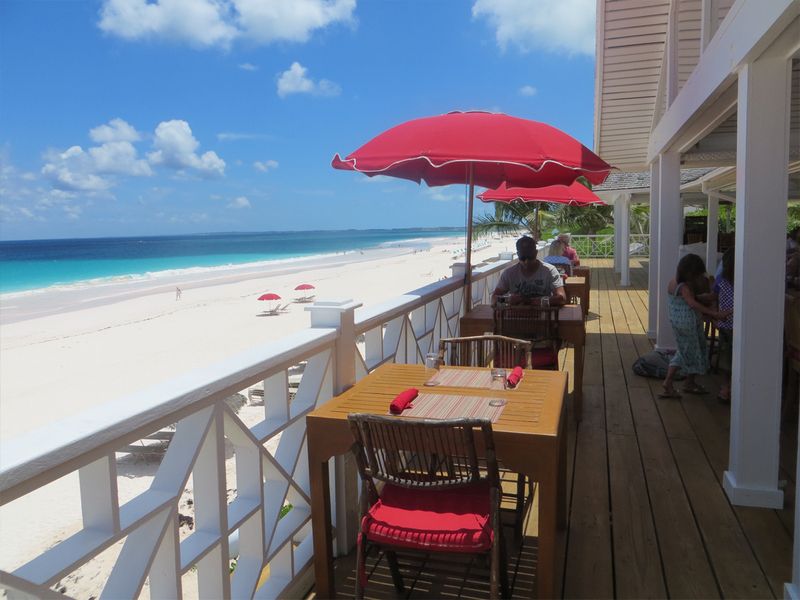 Lunch today is on the terrace at the lovely Coral Sands Hotel overlooking Pink Sand Beach. 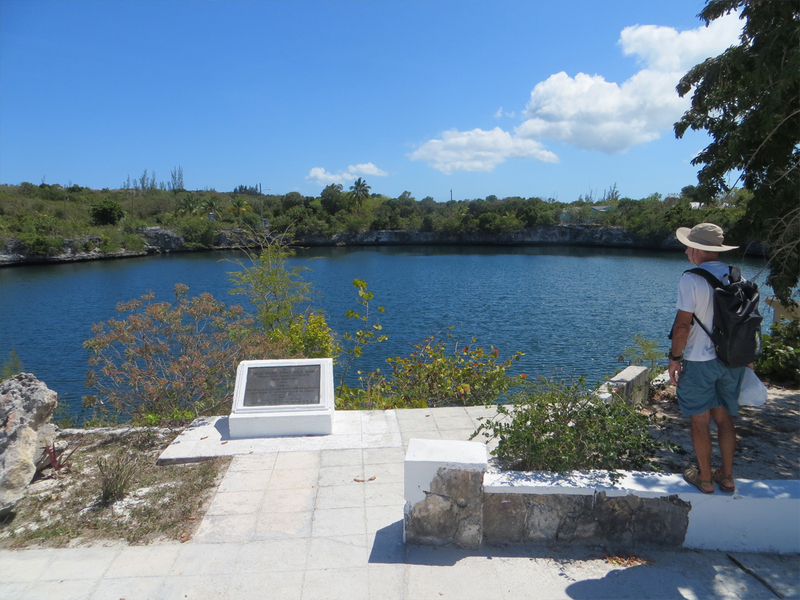 Tuesday, April 21st is devoted to exploring the Spanish Wells Settlement. 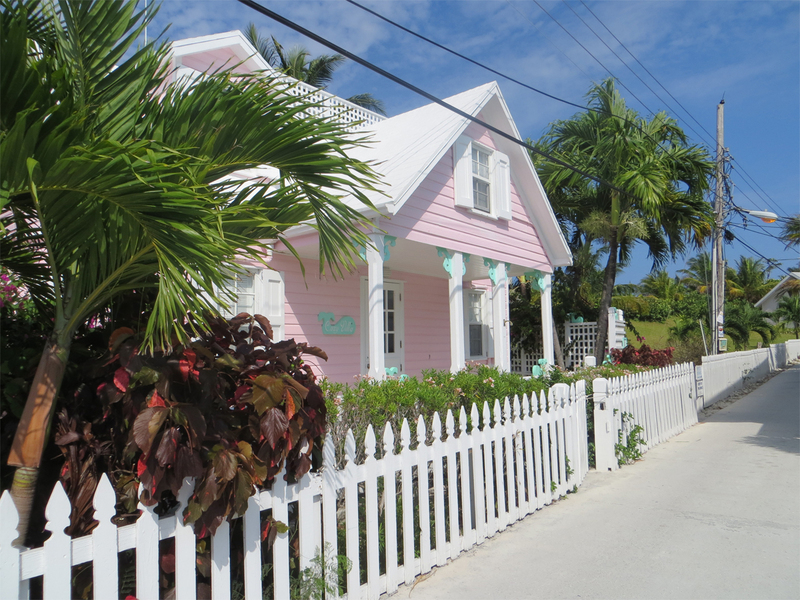 Of all the settlements we have visited in the Bahamas, Spanish Wells gives the appearance of being the most prosperous. This town dates back to the 17th century when the Eleutheran Adventurers departed England in search of religious freedom. Today, this working harbor is home to a fleet of large fishing trawlers. 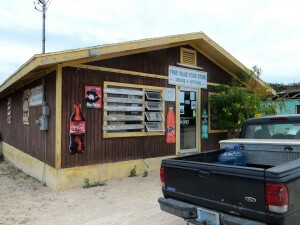 The fishermen of Spanish Wells provide the vast majority of seafood consumed in the Bahamas. 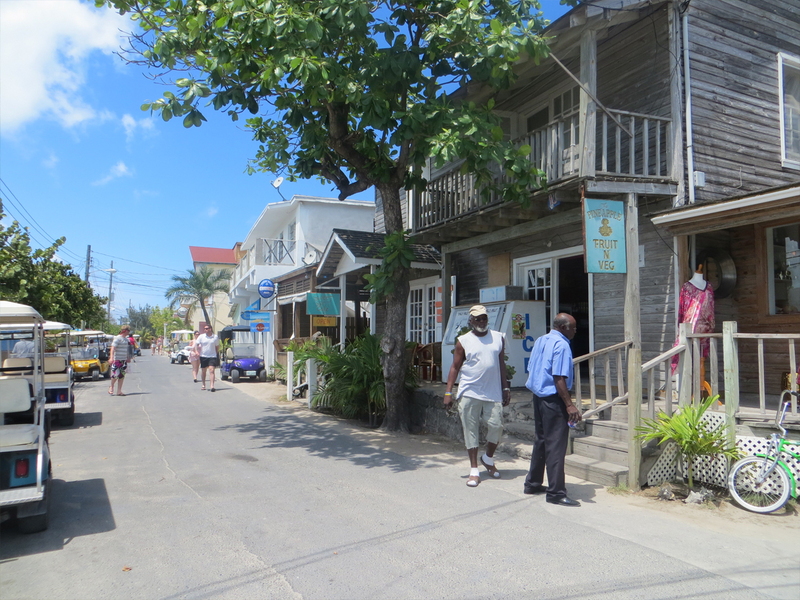 The local shops, restaurants and housing stock reflect the relative affluence of Spanish Wells compared to that of other settlements in the Bahamas. 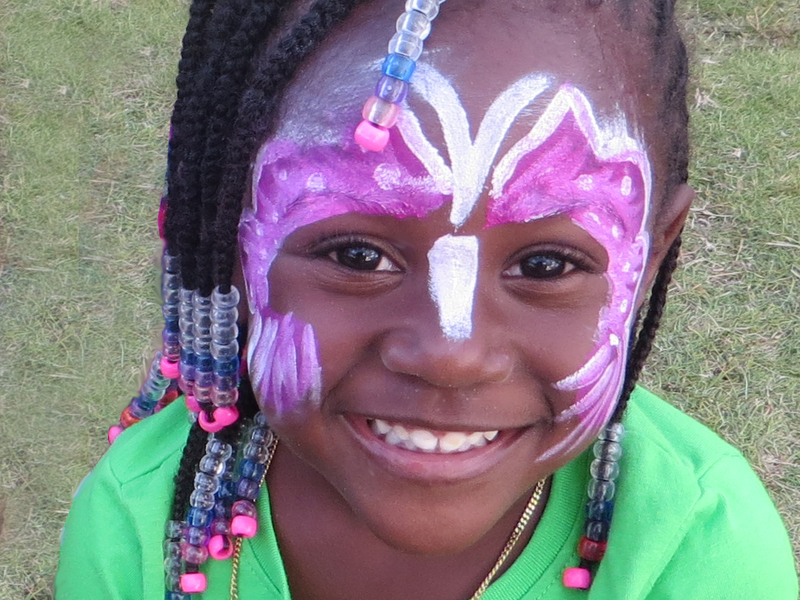 The population here is a mix of black and white Bahamians. On Tuesday afternoon, Cutter Loose is bound for Royal Island, about 7 miles west of Spanish Wells. The natural harbor at Royal Island is a refuge during periods of heavy weather. 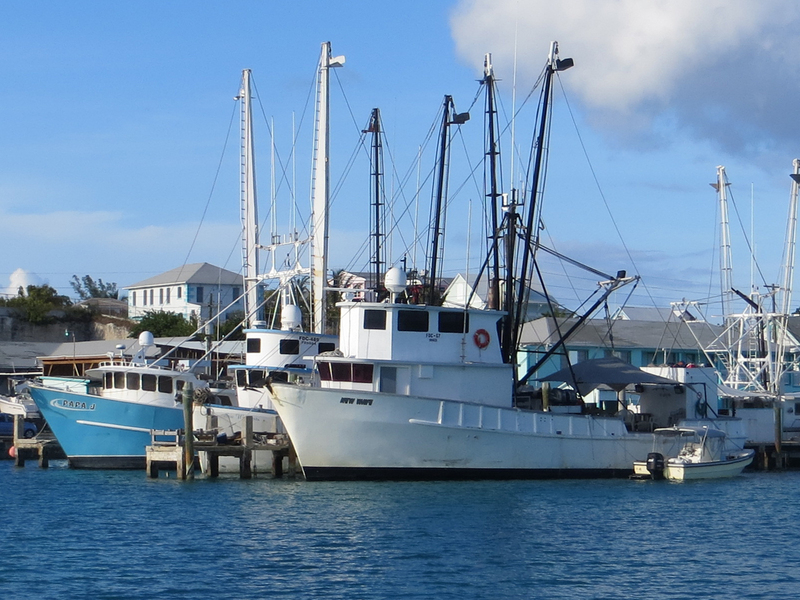 Today, it serves as an overnight staging area for tomorrow’s early morning departure for Little Harbour on Great Abaco Island. 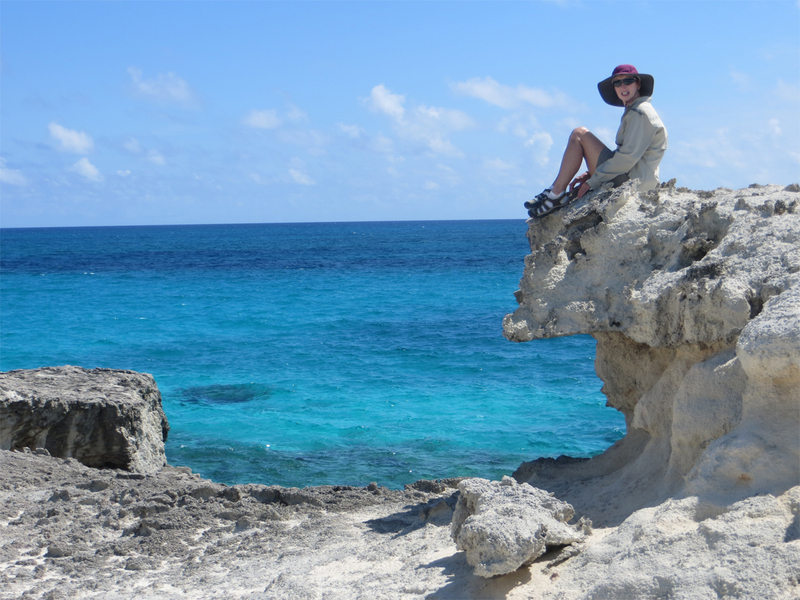 In terms of Exumas cruising, we have saved the best for last. 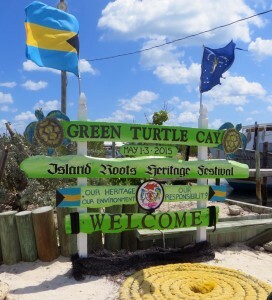 On Wednesday, April 15th, the anchor is up at Shroud Cay for the 20-mile journey to the island of Warderick Wells, headquarters of the Exuma Cays Land and Sea Park. 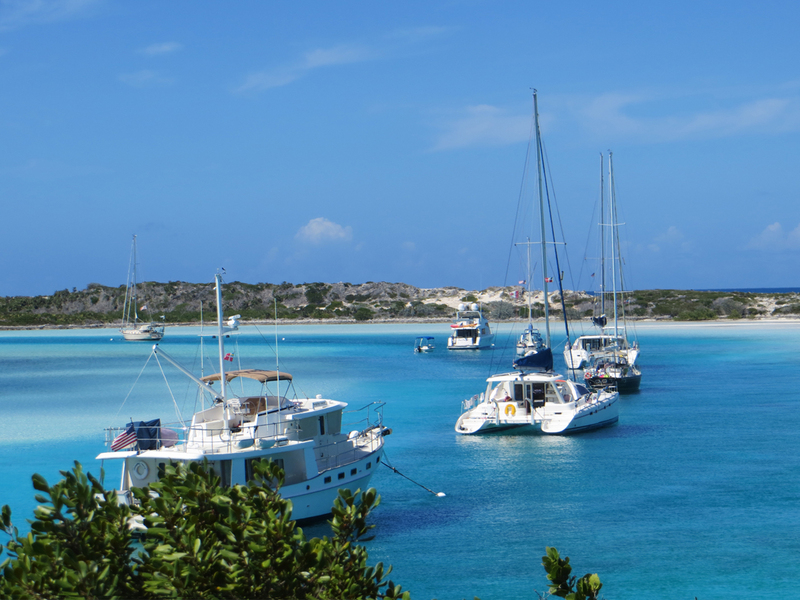 Most cruisers opt for the picturesque and popular North Mooring Field, which is a narrow ribbon of deeper blue water that arcs through the center of shallower water over white sand that is nearly dry at low tide. The picture that unfolds as one enters the mooring field is shocking in its natural beauty…a ribbon of color gradations ranging from deep blue to turquoise to pastel green to white. The Park maintains 22 yacht moorings in the North Mooring Field on a first come – first served basis. For a fee of $30 per night, cruisers have the privilege of being surrounded by the scenic beauty of the island and its environs. Fees are payable at the park office located nearby where the Warden is kept busy coordinating the comings and goings of visiting yachts. The Bahamas National Trust created the Exuma Cays Land and Sea Park in 1958. At the time, it was the first such marine national park and nature preserve ever created. Through the efforts of volunteers, the Park Headquarters was constructed during the period 1988 to 1989. The purpose of the Park is to preserve the delicate reef ecosystem as a habitat for marine life. Fishing is prohibited within the Park. The boundary of the Park is sizeable, comprised of 15 major cays covering 176 square miles. The North Mooring Field, however, is the centerpiece of the Park. 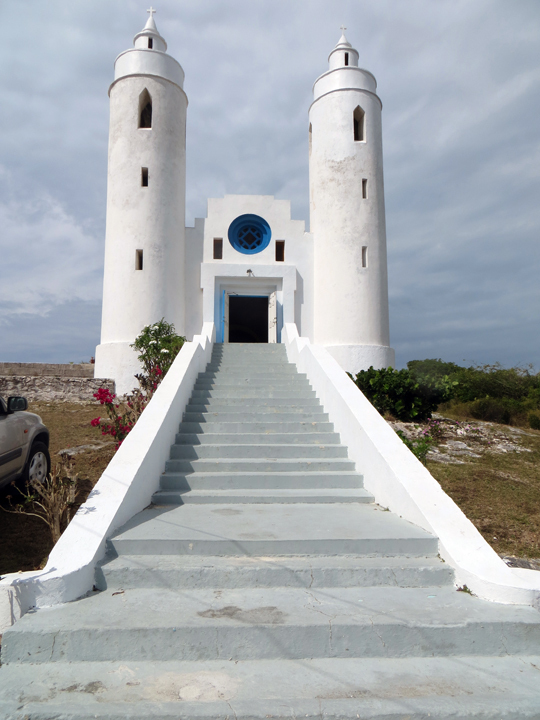 A visit here is the highlight of an Exuma cruise. 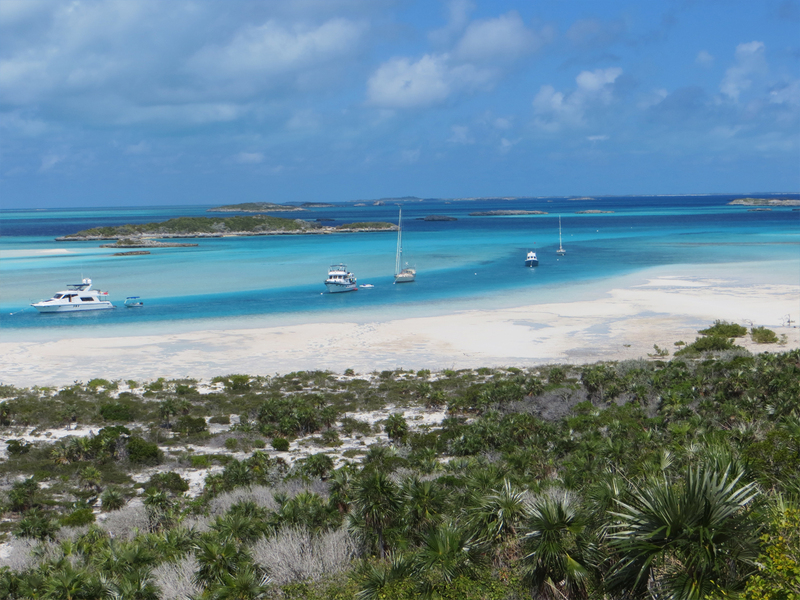 Since the Warderick Cut entrance to Exuma Sound is less than a mile away, the mooring field is affected by tidal current. Each day, the synchronous swinging of boats to the tide is a choreographed minuet in one of the most exquisite settings in the Bahamas. For about an hour at slack tide, the moored boats lie perpendicular to the dark blue channel, riding to wind rather than the lackluster current. Ever so gradually, the wind loses its influence on the dancefloor as boats pivot simultaneously towards the flow of the strengthening current. This power play repeats itself four times every day, imposing a natural sensation of order and rhythm to life in the mooring field. Witnessing this perpetual dance is one of the pleasures of living close to nature. Ashore, a network of hiking trails with interpretive signage connects to a series of beaches on the Sound side as well as the Banks side of Warderick Wells. 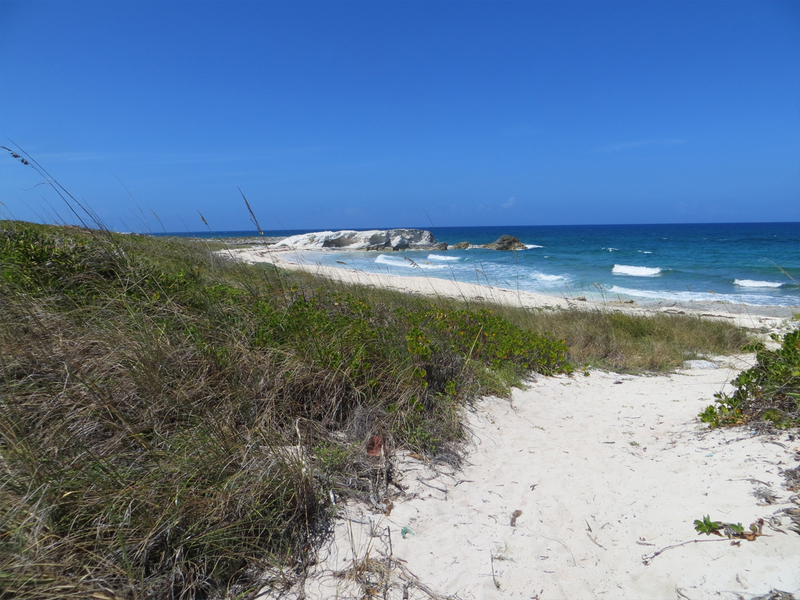 It is possible to hike the entire length of Warderick Wells via its beaches and footpaths. 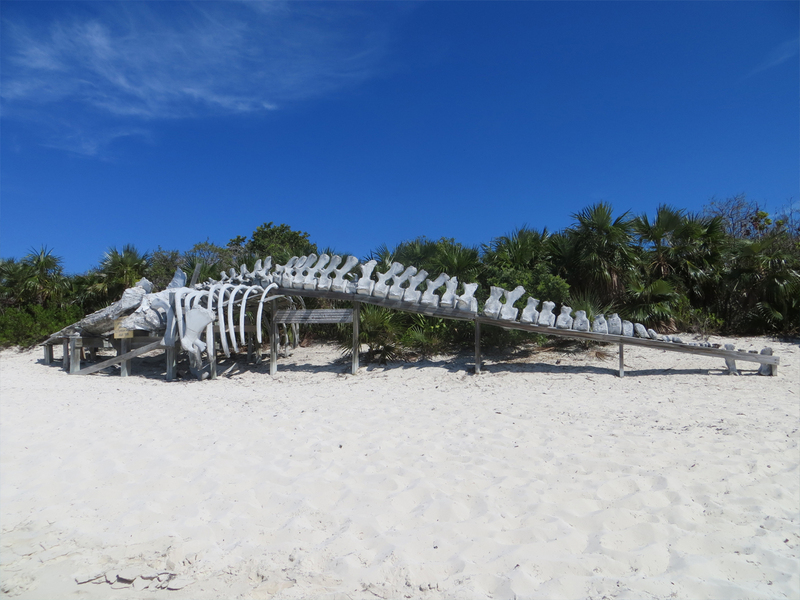 Skeletal remains of beached whales have been reconstructed for display. Words cannot describe the beauty of this place. Pictures are worth thousands of words. 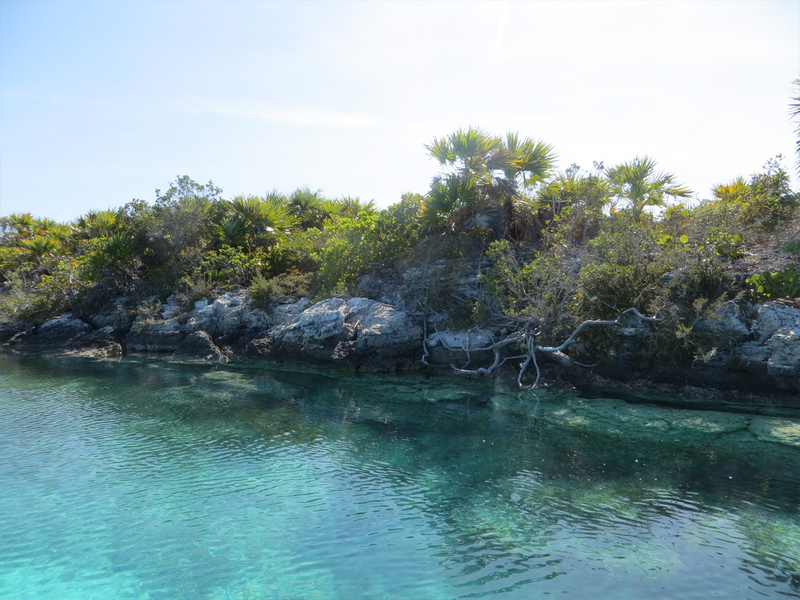 During our limited exploration of the Exuma Cays, we have merely scratched the surface of interesting places this magnificent cruising area has to offer. There are literally dozens of islands and hundreds of secluded, white-beach anchorages yet to be explored. The color and clarity of the shallow water here in the Bahamas is unique to this area and breathtakingly beautiful. 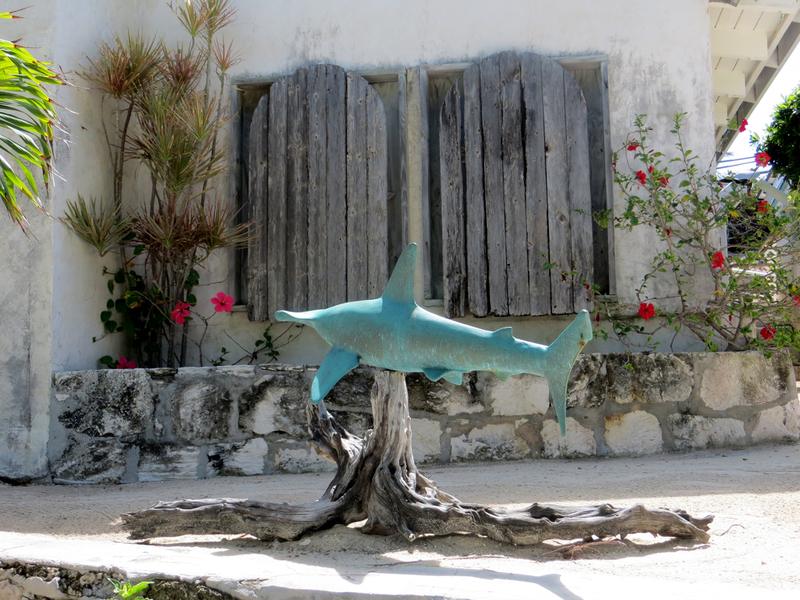 Although our visit to the Exumas has been brief, it has been most enjoyable. We are already prioritizing a list of anchorages and snorkeling spots to visit upon our return. On Friday morning, Cutter Loose will depart the Exumas through Warderick Cut, bound for Rock Sound Settlement on the island of Eleuthera. The anchor is up in Elizabeth Harbor at 7:20 AM on Friday, April 10th. After five days at anchor in George Town, it feels good to be underway again. 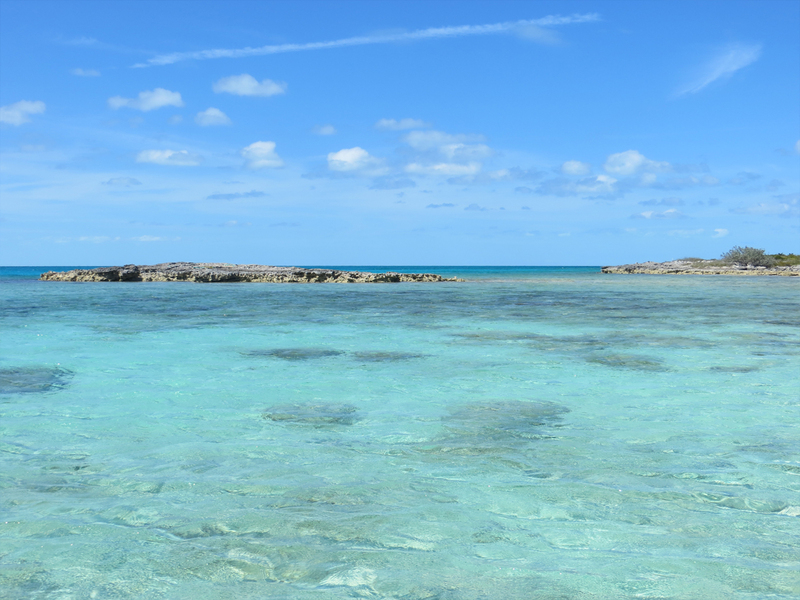 During the next leg of our journey, we will pass through the central and northern sections of the Exuma Cays, one of the premier cruising grounds on the planet. 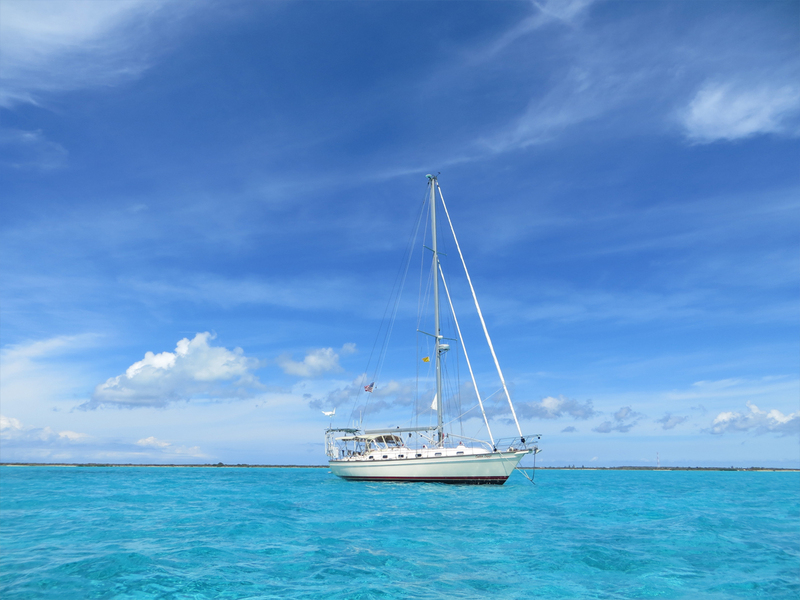 The Exumas are a chain of islands stretching roughly 120 nautical miles from Hog Cay in the southeast to Sail Rocks in the northwest. 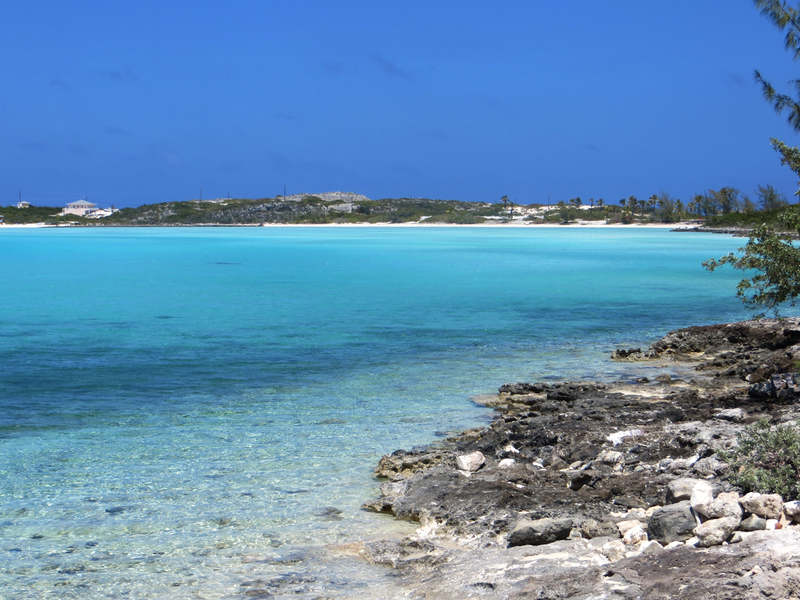 To the east of the island chain is Exuma Sound, a deep body of water with Atlantic exposure. 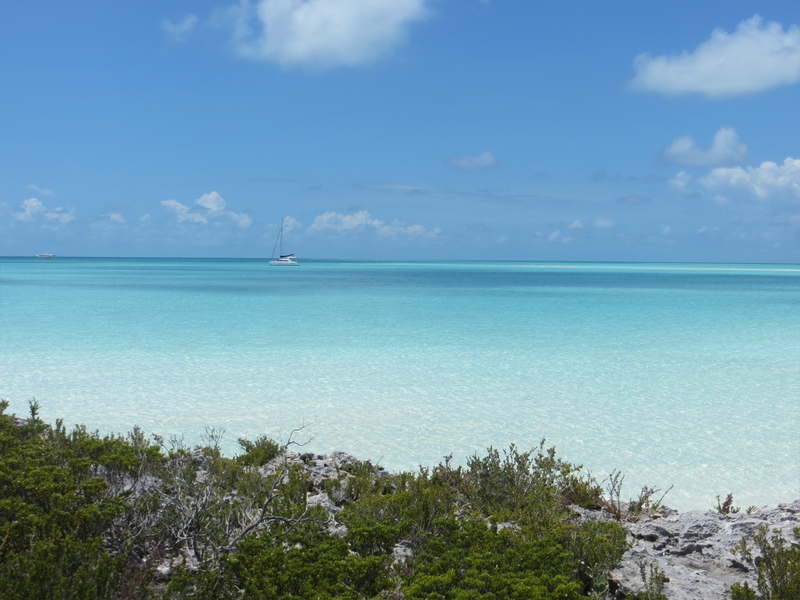 To the west of the chain is Exuma Bank, a shallow body of water with depths ranging from less than a foot to about 25 feet, depending on location and the state of the tide. 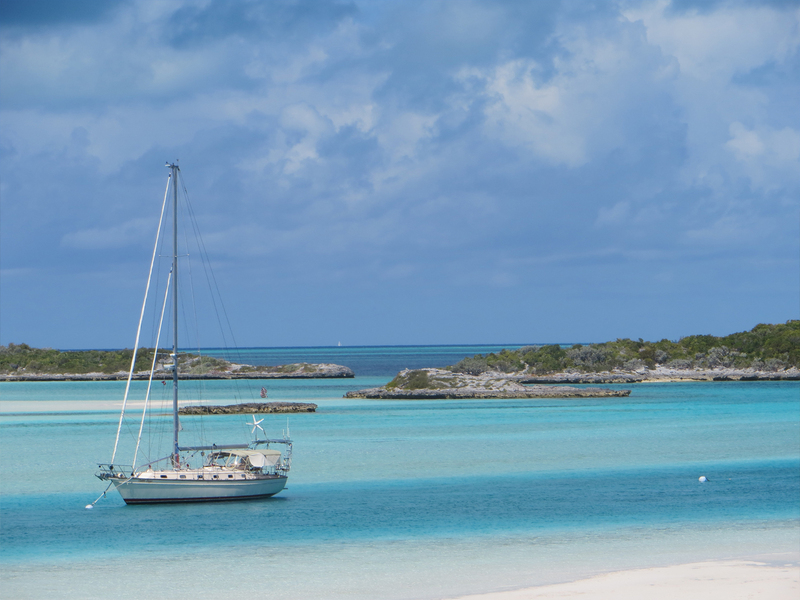 Because Exuma Bank is ultra-shallow in the vicinity of George Town, the path of least resistance for northbound vessels is to sail on the outside (i.e., the Exuma Sound side) of the island chain from Elizabeth Harbor. 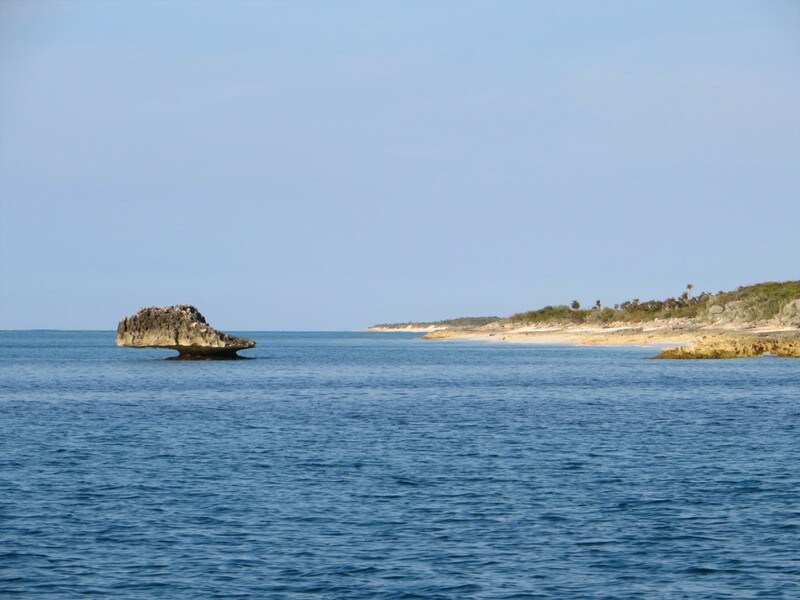 The first deep water opportunity to pass from Exuma Sound to the inside (i.e., the Exuma Bank side) of the island chain is through an opening called Galliot Cut located about 38 miles north of George Town. 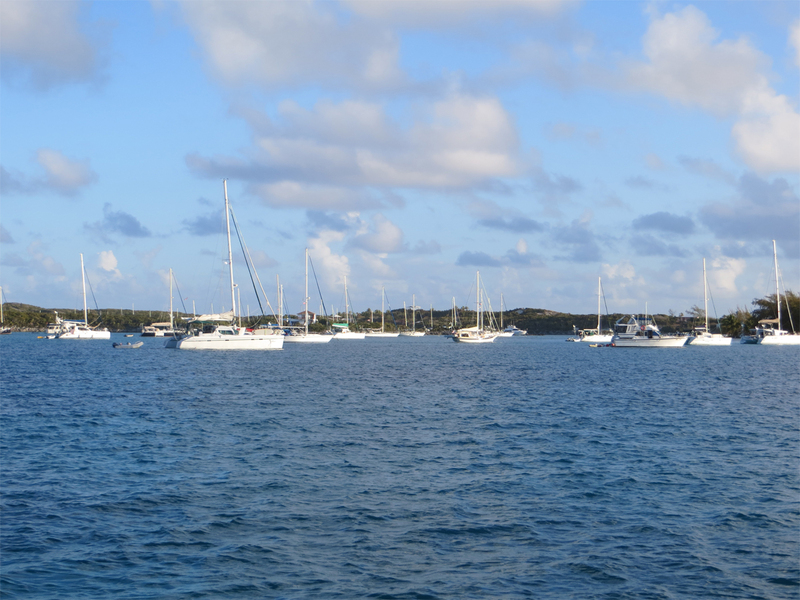 Departing Elizabeth Harbor, we enter Exuma Sound at Conch Cay Cut. Conditions in the cut are rather benign given the calm winds this morning. 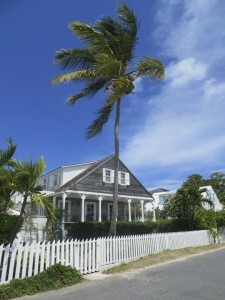 Once in Exuma Sound, a building breeze from the east places Cutter Loose on a pleasant broad reach. The swell today is in the 3 to 5 foot range. 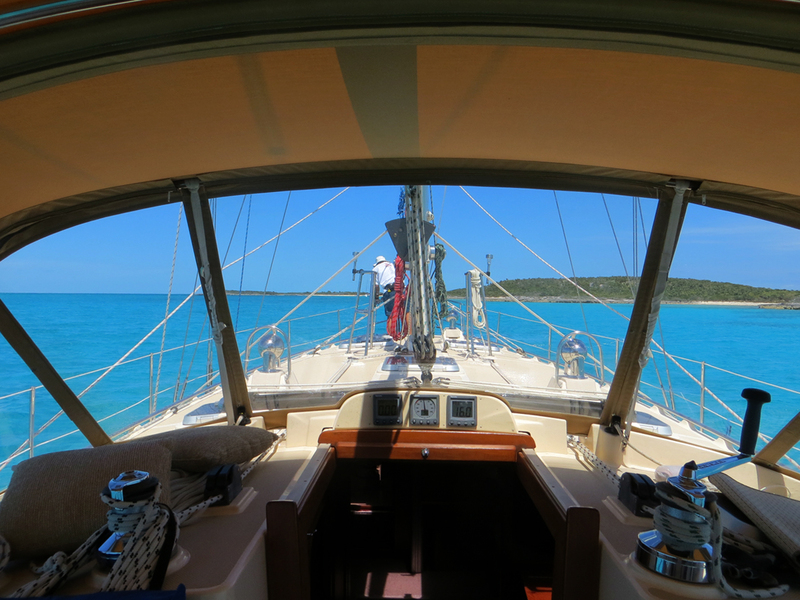 Our course parallels the east coast of Great Exuma Island. Along the way, Rat Cay, Lee Stocking Island and Cave Cay pass to port. Today’s goal is to arrive at Galliot Cut at slack high tide. Conditions in the cuts are calmest just before, during and just after slack tide. When the ebb begins, sea water that has been accumulating in the Exuma Bank rushes with a vengeance towards Exuma Sound. This tidal flow finds its way from the Banks to the Sound through the numerous openings between islands in the chain. As these tidal rivers become compressed into narrow cuts, swift currents are created. When an eastbound tidal current confronts an opposing prevailing easterlywind, the result is short, choppy, breaking seas that run in a straight, narrow line through the cut and a mile or so into the Sound. With the knowledge that slack high tide at Galliot Cut occurs around 12:45 PM, we increase the throttle in the interest of a timely transit through the cut. Our arrival at Galliot Cut occurs at 1:30 PM. Already, the ebb has begun, pushing against our bow at 2 knots. Fortunately, it is early enough in the tidal cycle that Cutter Loose is able to power her way without incident through the chop. Within ten minutes we are through the cut, rounding Galliot Cay and passing Big Farmers Cay and Little Farmers Cay to starboard. 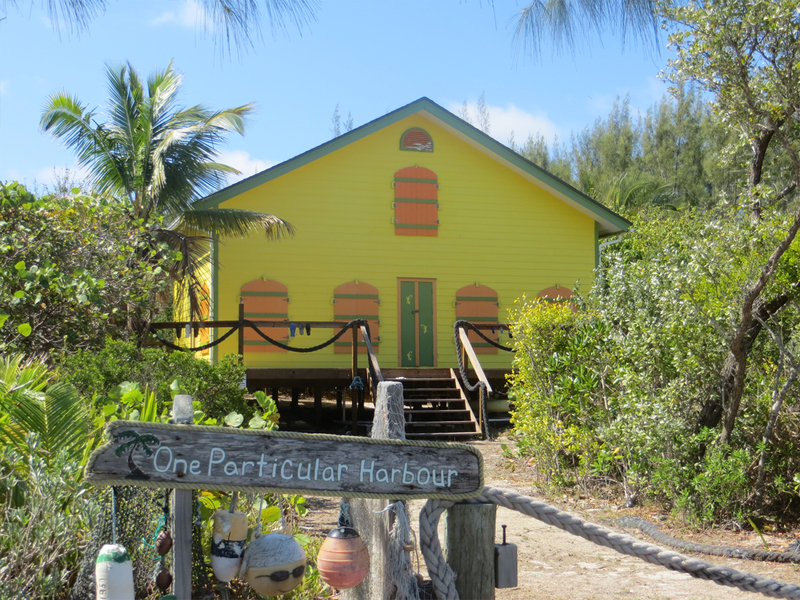 Our destination today is Black Point Settlement near the northern tip of Great Guana Cay. 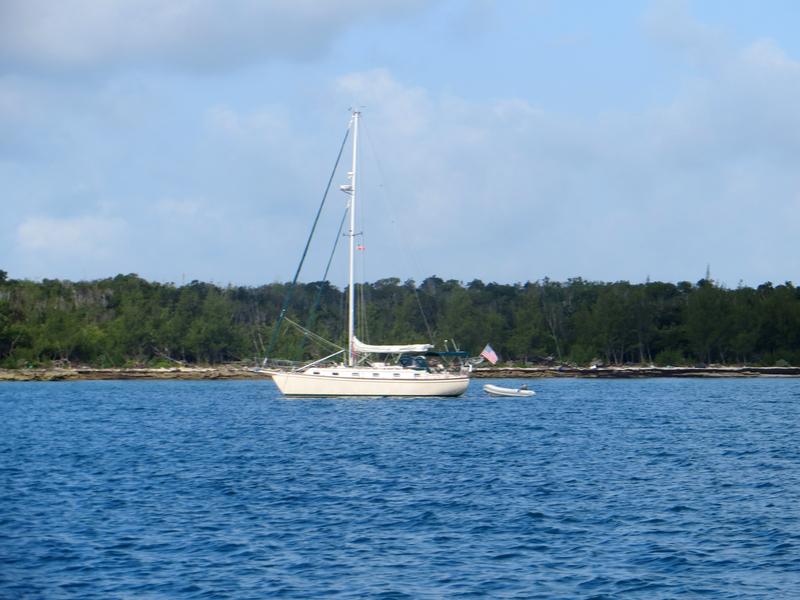 At 4:15 PM, the anchor is down in the huge aquamarine bay at Black Point, having logged another 58 miles for the day. Since the ship’s dirty laundry has been accumulating for nearly three weeks, our highest priority on Saturday morning is a visit to Rockside Laundromat. The size and cleanliness of this facility exceeds our expectations. 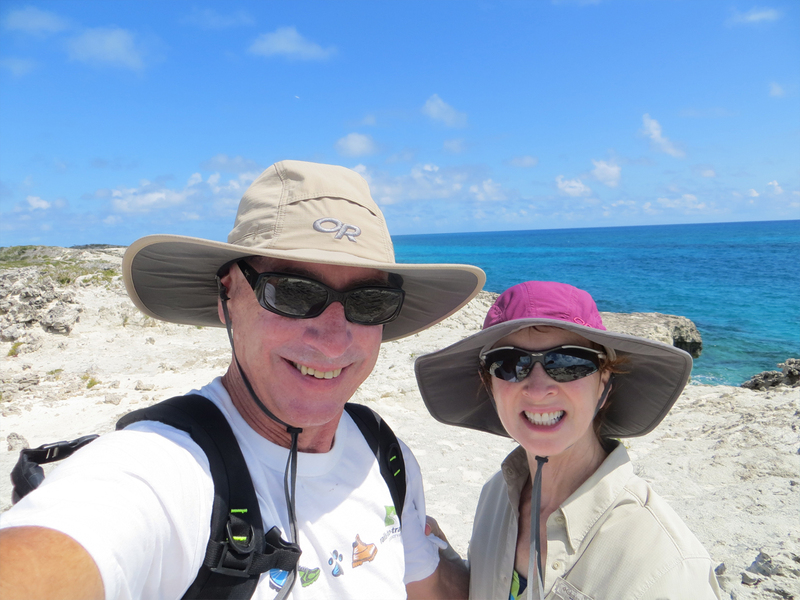 With chores completed, an afternoon walk through the Settlement and a hike to the beaches on Exuma Sound and the bluff overlooking Dotham Cut provide a much needed source of exercise. 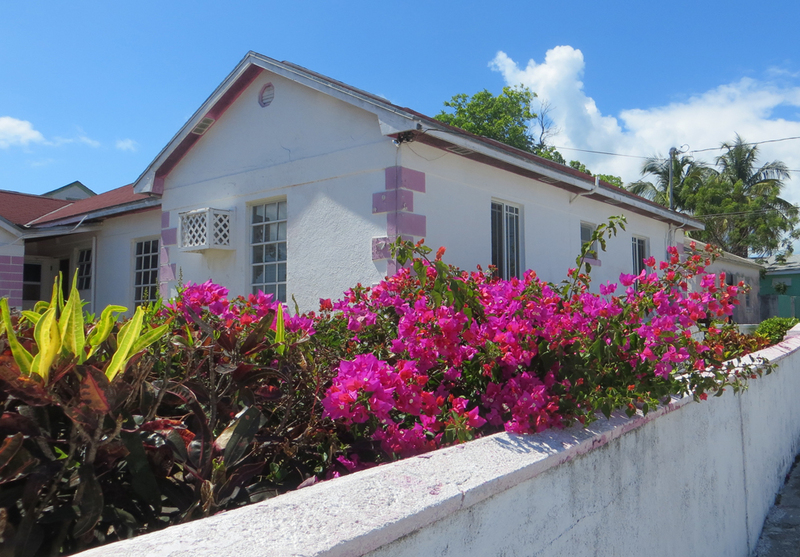 Black Point Settlement is very welcoming to visitors. 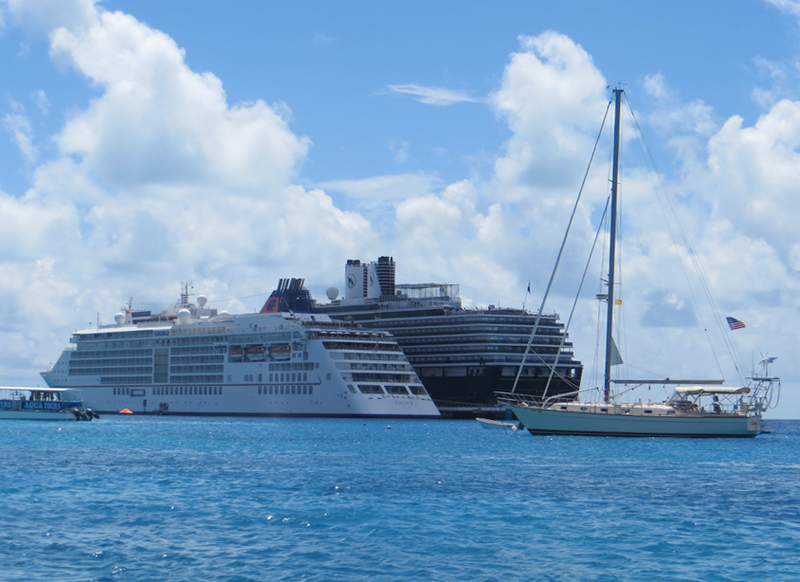 In terms of amenities for cruisers, it offers three restaurants, three churches and a small grocery store. A cluster of rental cottages on the north side of the harbor overlooks the expansive bay. Golf carts are the preferred form of transportation in the Settlement. 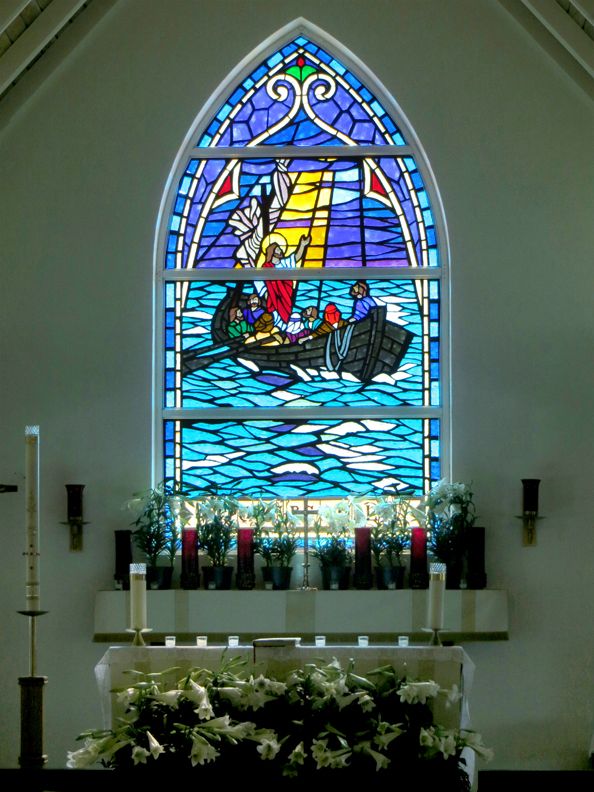 During our visit, we learn that mail boat service from Nassau to Black Point has been suspended indefinitely due to a funeral in the family that operates this service. 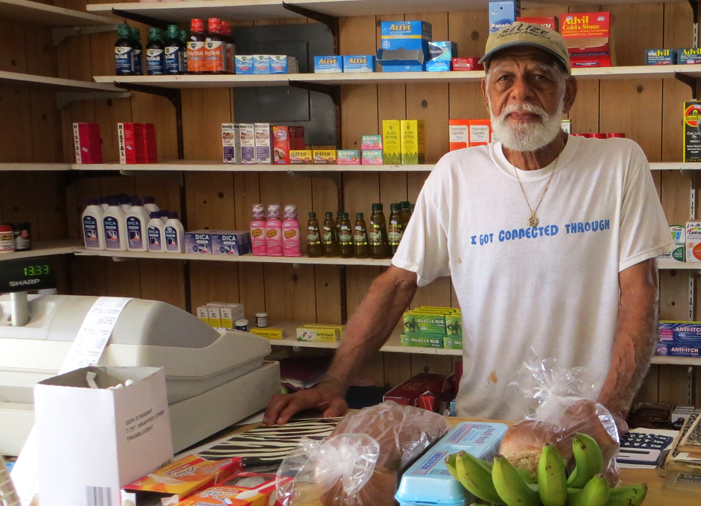 Residents and restaurants in Black Point and other settlements in the Bahamas rely exclusively on mail boat deliveries for everything, including fruit, vegetables and other supplies. 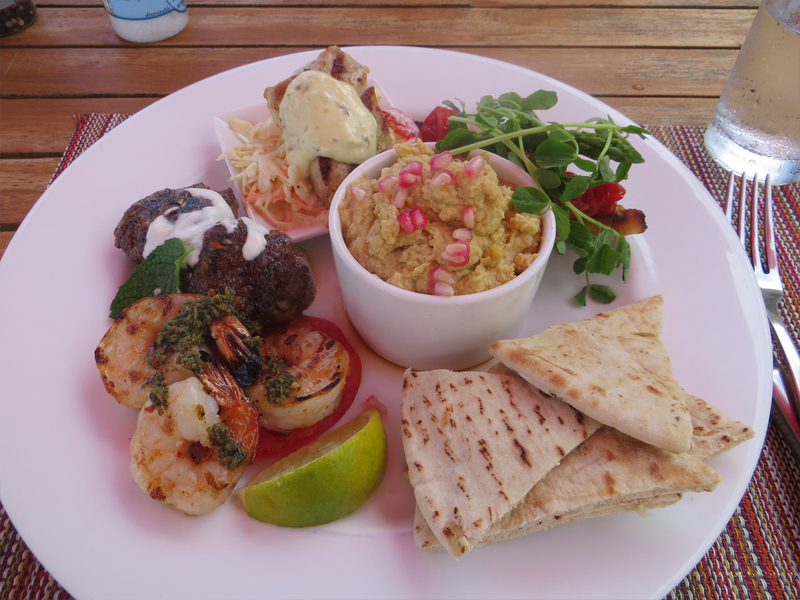 As a result, the restaurants now offer limited menu choices…mostly seafood that is sourced locally. 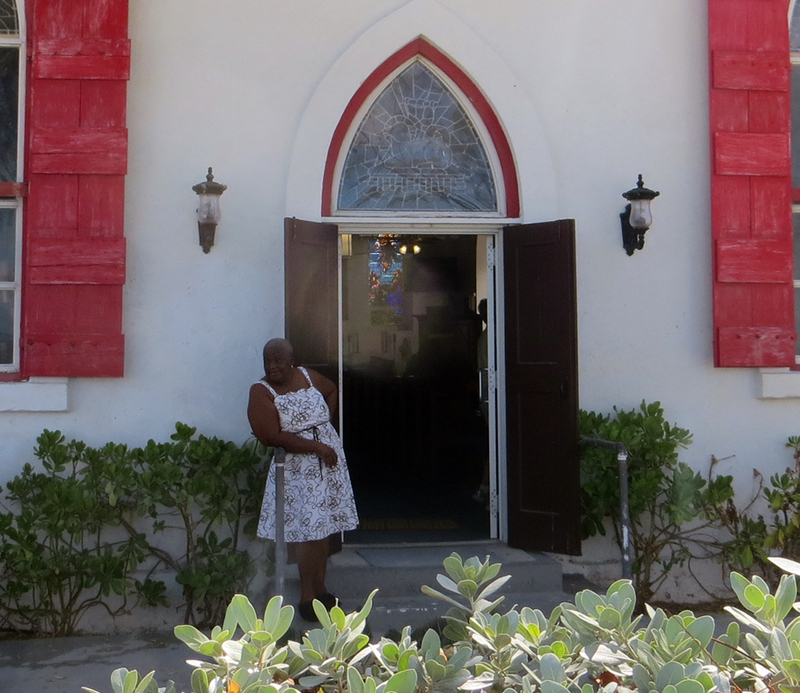 This is not a hardship, but it underscores the fragile nature of the economy in coastal villages throughout the Bahamas. For a town that is diminutive in size, the nearby airstrip is quite active with several commuter flights landing and taking off each hour. 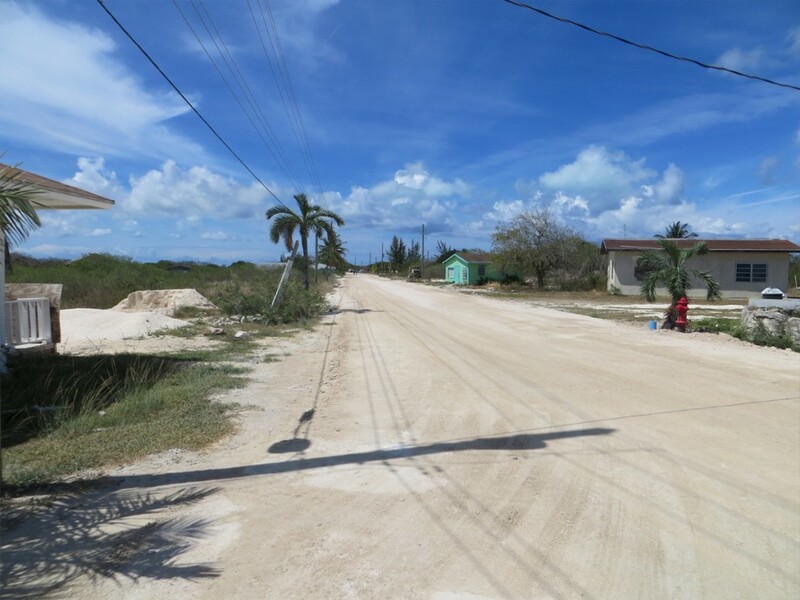 We later learn that the airstrip at nearby Staniel Cay has been closed for runway repairs. All air traffic has been diverted to the Black Point airport during construction. This also helps to explain the steady stream of go-fast boats with passengers entering and departing the town dock at Black Point. 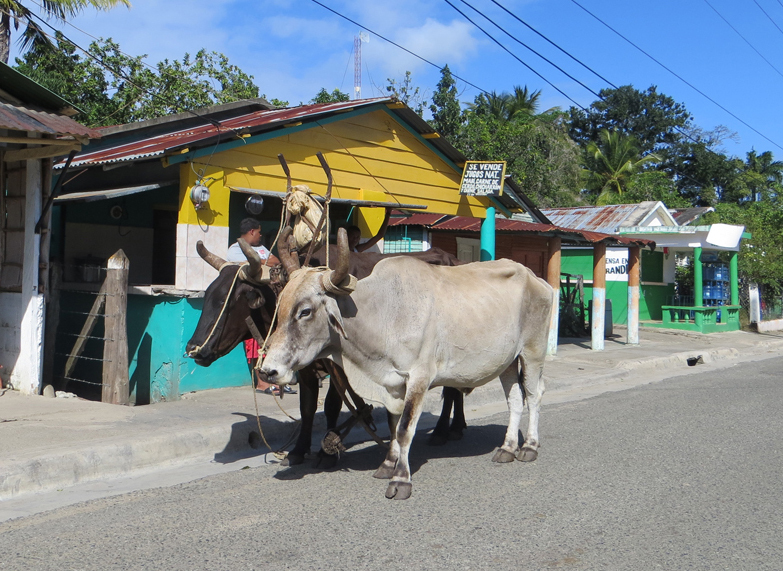 They are shuttling passengers to and from Staniel Cay. Any local resident that owns a fast boat is capitalizing on the shuttle business this weekend. 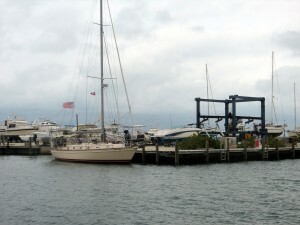 On Sunday, April 12th, the anchor is up at 11 AM after a lazy morning in Black Point. 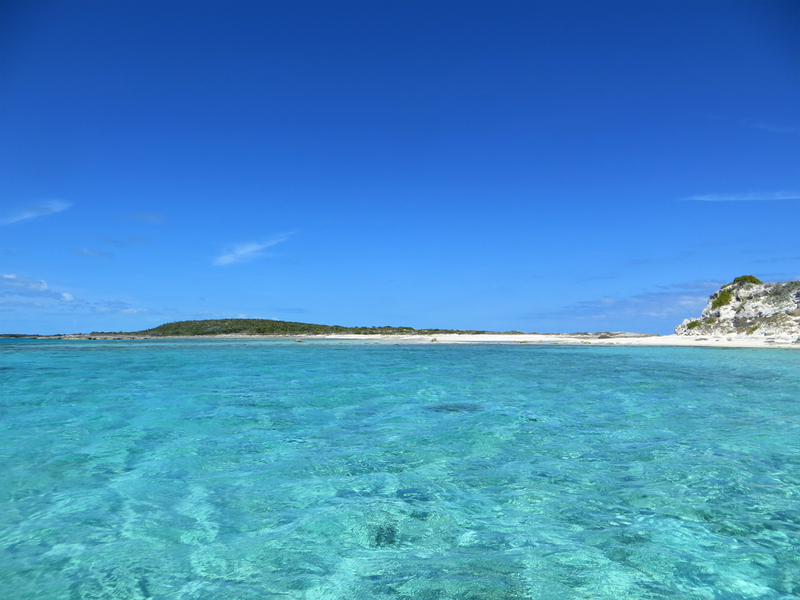 Our destination today is Staniel Cay, just 10 miles to the northwest. Cutter Loose is anchored in the lee of Big Majors Spot, an uninhabited island. 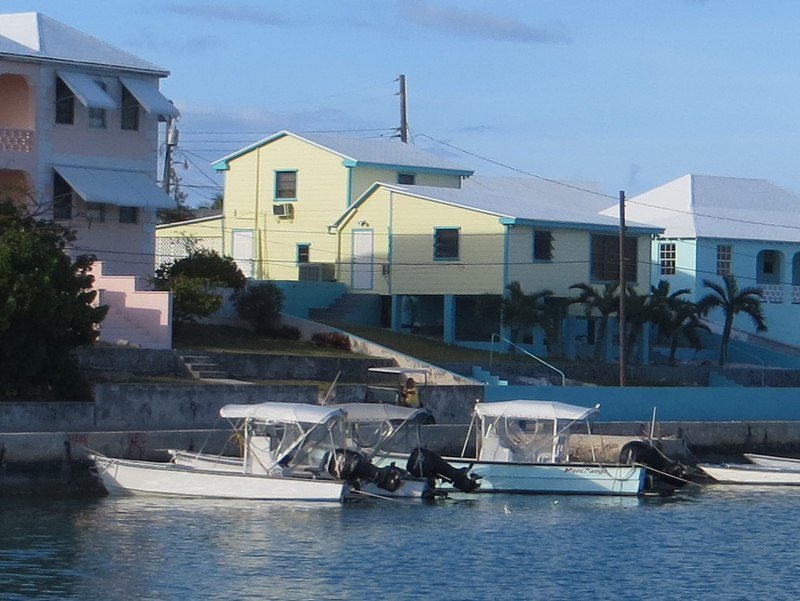 From all appearances, this is the major yachting center in the central Exumas. In the anchorage today, there are no fewer than 7 professionally crewed mega yachts in excess of 100 feet. Each yacht trails a nearly identical string of water toys from its stern, consisting of the requisite 450 HP 30 foot center console T top runabout, a trio of jet skis, several 70-HP dinghies, stand-up paddle boards and windsurfers. Each day at sunset, the crew collects the water toys and places them in the yacht’s garage for overnight storage. In addition to the dutifully equipped mega yachts, there are 10 cruising trawlers and 22 cruising sailboats at anchor in the harbor today. What is the attraction? 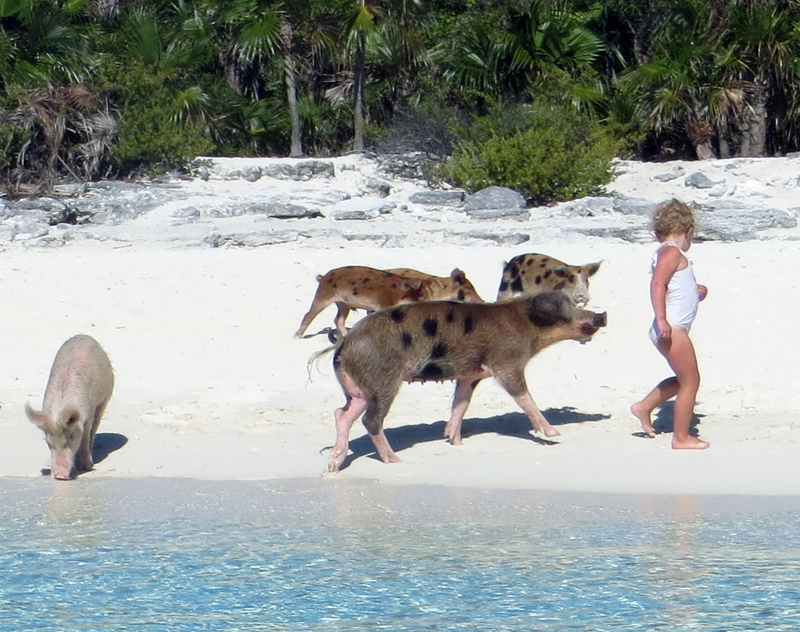 On the beach a short distance away, a dozen or more spotted, feral pigs roam the beach in search of handouts from visiting cruisers. These porkers are obsessed in their quest for food. Snouts aimed skyward, they cheerfully swim out to a visiting dinghy to collect contributions. Could it be the oinkers that have attracted a harbor full of boats? 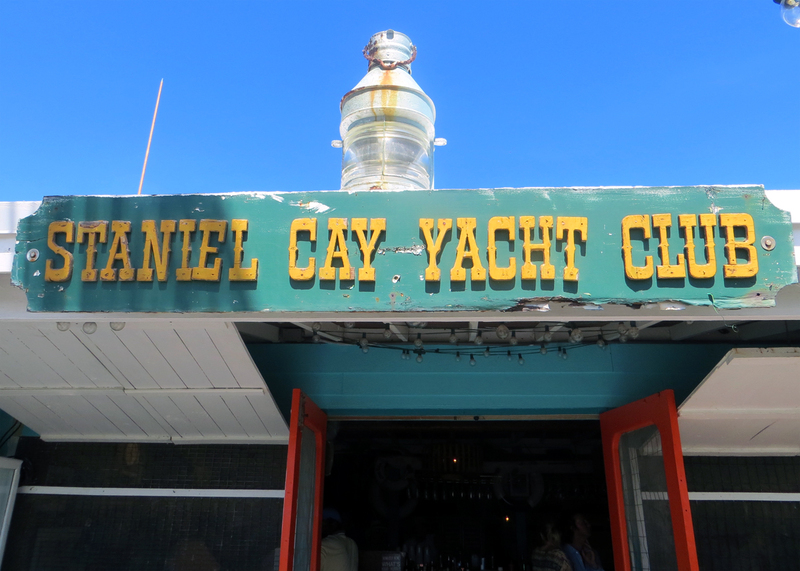 From the Big Majors anchorage, it is a one-mile dinghy ride across the channel to the Staniel Cay Yacht Club, the island’s entertainment center. This afternoon, the bar is filled with cruisers watching the live broadcast of the final round of the Masters Golf Tournament on the big screen TV. In the adjacent upscale air-conditioned dining room overlooking the harbor, the Sunday brunch crowd is staring into their electronic devices, pausing occasionally for a bite of food or a quick exchange with the person seated across the table. Quick…check the GPS. Are we still in the Bahamas? Or is this the United States? This semblance of Americana helps to explain the abundance of boats in the harbor. Staniel Cay serves as a convenient staging area where professional crew awaits the arrival of their owners and guests at the nearby airstrip. With daily direct flights from Fort Lauderdale, yacht owners are only an hour or so away from Staniel Cay where they can enjoy all the comforts of home. 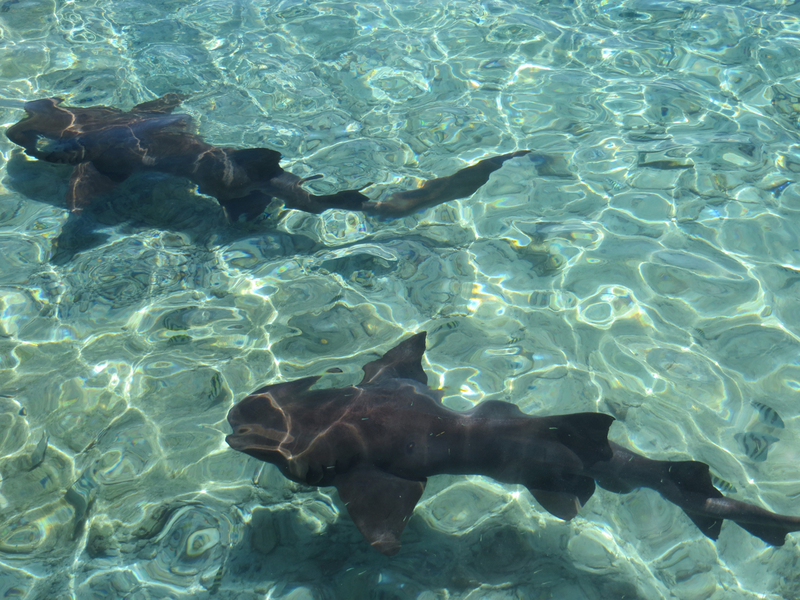 In the afternoon as the catch of the day is cleaned and filleted, a group of nurse sharks gather at the Yacht Club for happy hour snacks. 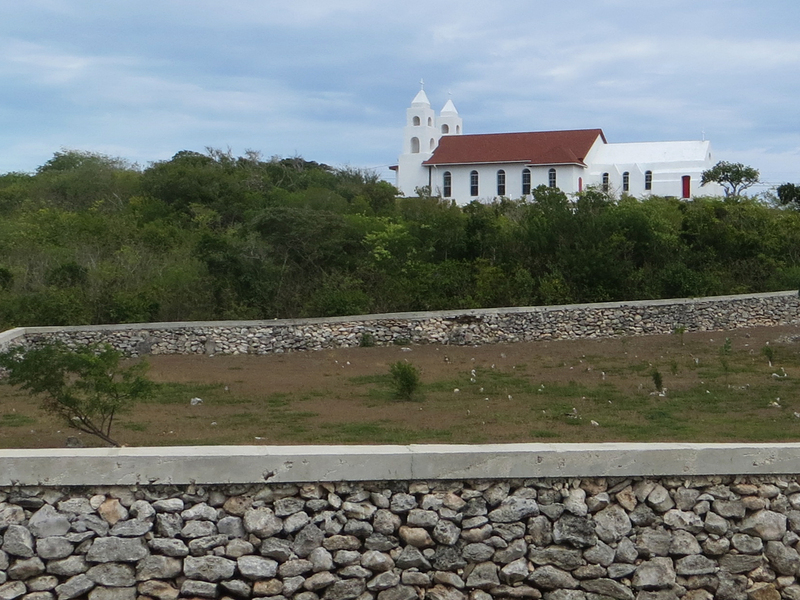 Beyond the Yacht Club, there are a handful of shops and churches in the Settlement that extend towards the airstrip. 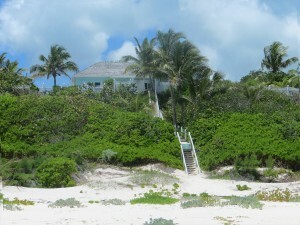 The remainder of the island is sporadically dotted with rental cottages and private homes. Most residents and visitors use golf carts to move around the island. On Monday morning, we board the dinghy for a snorkeling expedition. A short distance from the eastern shore of Big Majors Spot is a small cay with an inconspicuous cave-like indentation. This is the entrance to the famous Thunderball Grotto. Several movies have been filmed here, including Thunderball, Never Say Never Again, Into the Blue and Splash. At low slack tide, one can enter the Grotto without SCUBA gear. Once inside, the Grotto opens into a dome-shaped, hollowed-out, rock formation with a natural skylight in the ceiling. Beams of sunlight enter this cathedral, illuminating the water like a precious jewel. 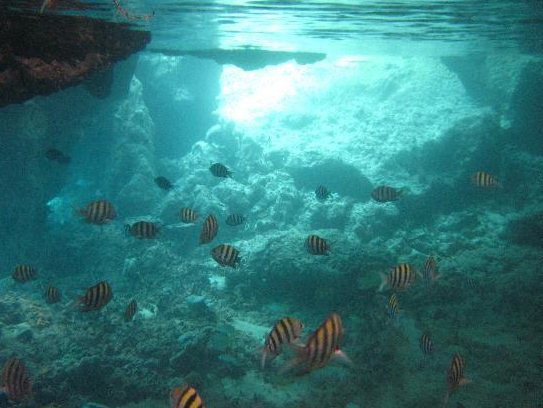 The cave is a sanctuary for angelfish, Sergeant Majors and other colorful aquatic creatures. Many visitors bring bread crumbs to feed the fish. The fish dart in front of one’s mask, begging for a handout. 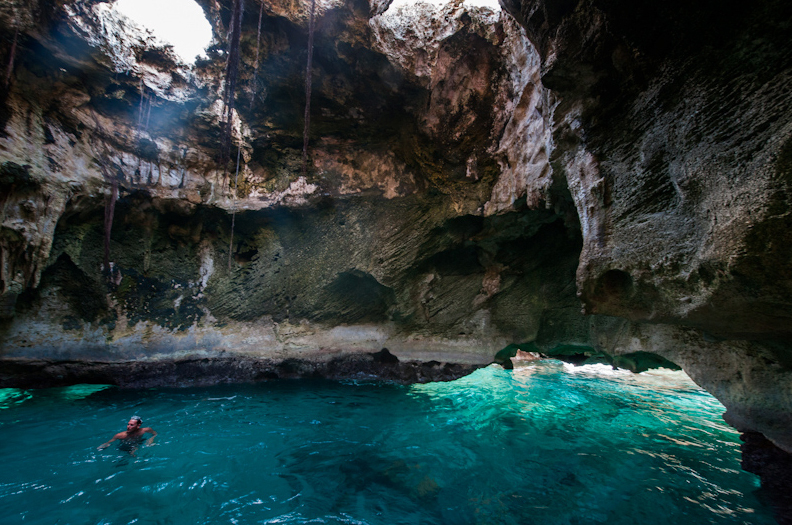 Thunderball Grotto is the snorkeling experience of a lifetime. On Tuesday, April 14th, the anchor is up at Big Majors Spot at 8 AM. Cutter Loose is bound for Shroud Cay, a small island 30 miles to the northwest that is part of the Exuma Cays Land and Sea Park. Our course takes us past the gorgeous white beach at Hawksbill Cay which is also located within the Park boundary. Shroud Cay features several creeks that meander for more than a mile through a tidal swamp that features a mangrove forest. 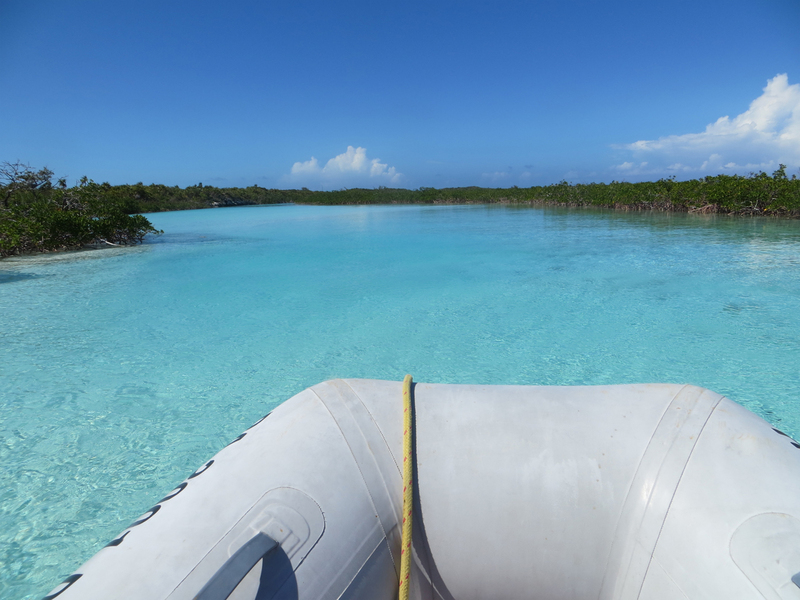 These creeks extend all the way from Exuma Sound to Exuma Bank and are navigable by dinghy, but only at high tide. 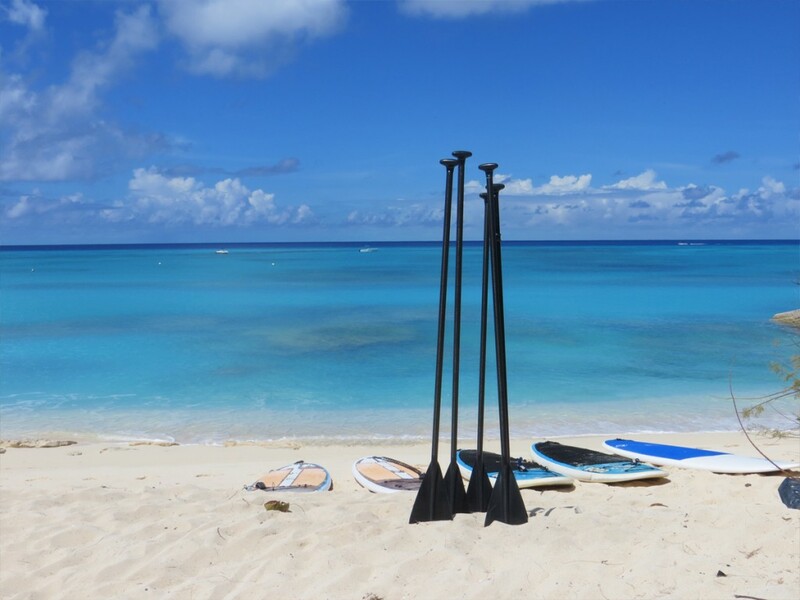 A kayak is the preferred mode of transportation, especially near the Exuma Sound side of the island where water depths reach roughly one foot. The massive network of mangrove roots in the creek provides an important habitat for fish and shorebirds. 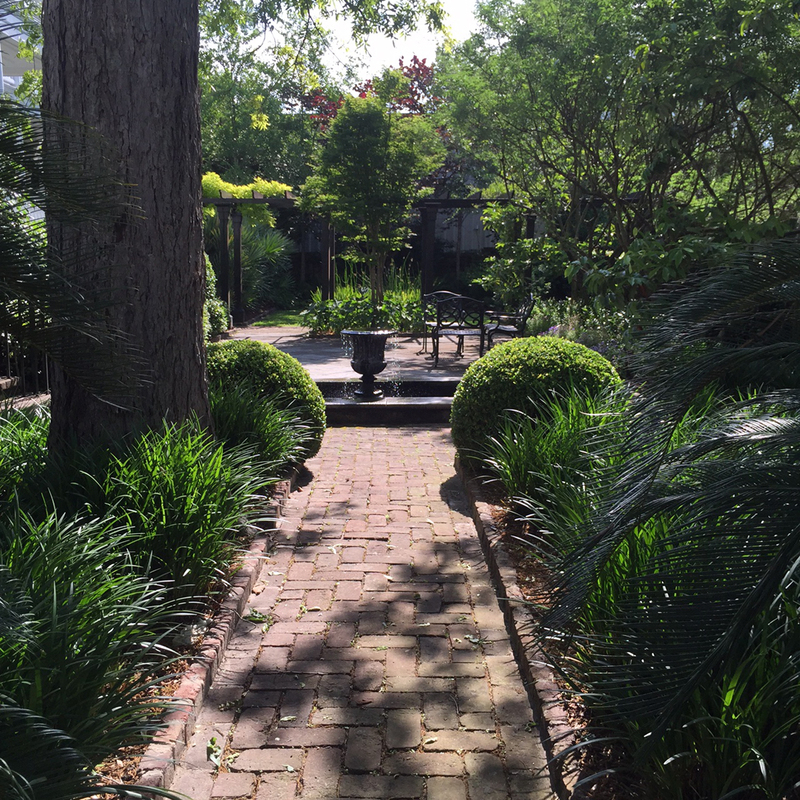 The peaceful beauty of this place inspires a leisurely visit. Turning off the outboard motor and drifting with the current amongst the tangled root network of the mangroves allows us to absorb this colorful symphony of sight and sound. At the first telltale sign of the falling tide, a hasty departure is required to insure adequate water depth for our return to the mother ship. 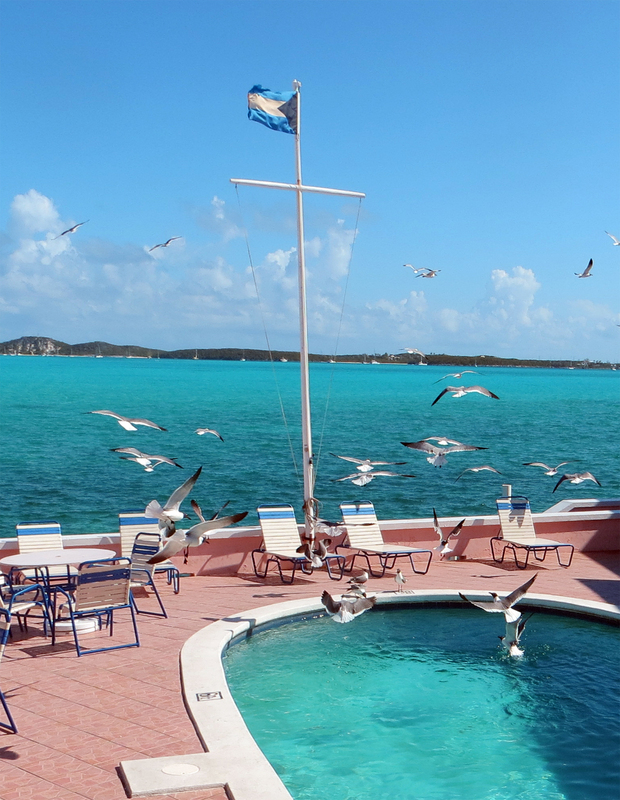 Tomorrow, we will set sail for the island of Warderick Wells, the crown jewel of the Exuma Cays Land and Sea Park. Certain objectives in life require more time than others to come to fruition. In October of 1986, Pat and I had the good fortune of a chance encounter with Island Packet sailors Vince and Legare Kane aboard IP 31, Good News. At the time, we were delivering a sister ship (Chuck Berrington’s IP 31, Relationship) from the Chesapeake Bay to Oriental, NC via the Atlantic Intracoastal Waterway. We were hopeful of securing a slip at the city dock in Oriental, but it was already late in the afternoon and there wasn’t an empty space to be found. Seemingly out of nowhere, a cruiser appeared alongside in a dinghy asking if he could be of help. In a generous gesture of Island Packethood, Vince invited us to raft off their IP for the night. Inevitably, the cockpit conversation that night drifted towards cruising ambitions and destinations. 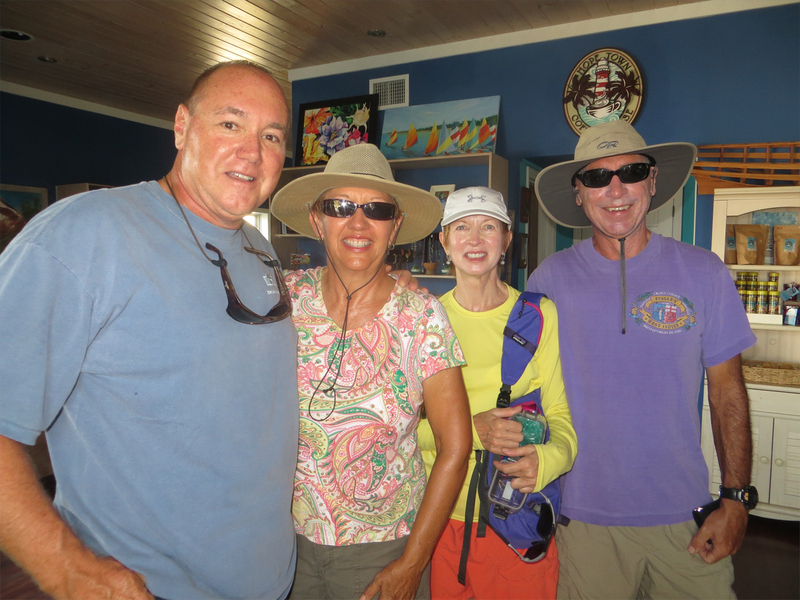 The Kanes spoke eloquently about the delights of cruising in the Exumas. They urged us to cruise the Bahamas in the spring, not winter. 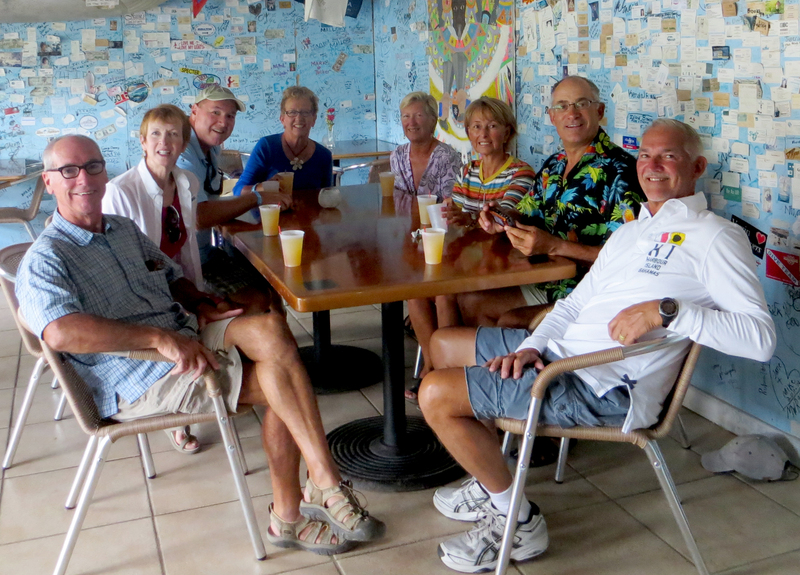 Their advice was to enjoy life “down George Town way” in April, when cold fronts are less frequent and the cruising is easy. 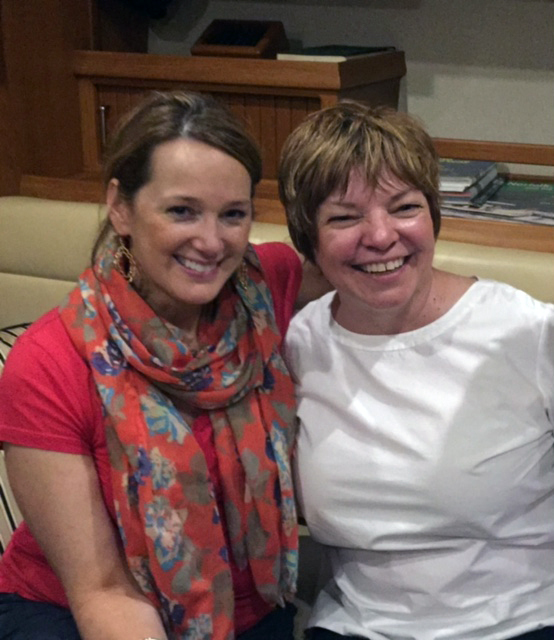 That night, this experienced cruising couple planted a motivational seed. 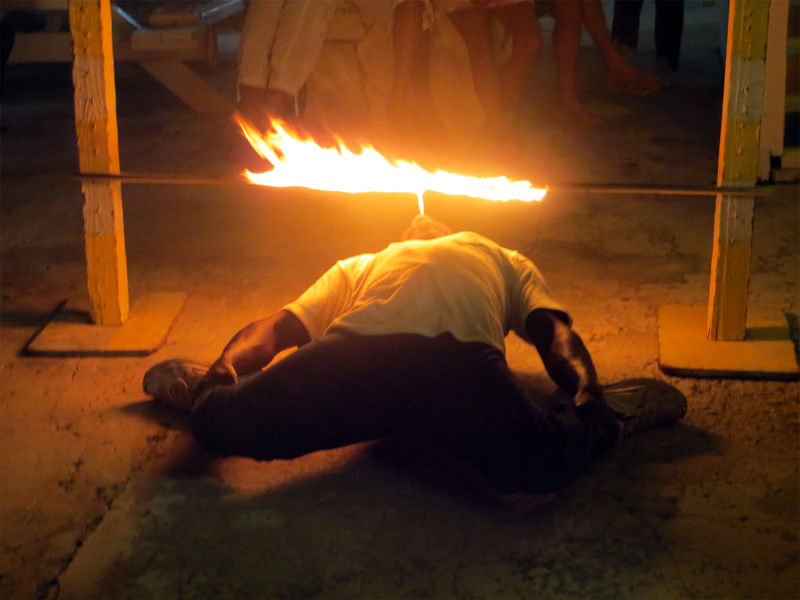 At that very moment in time, I knew with absolute certainty that one day we would eventually visit George Town. It was just a matter of time. Well, it is now April and here we are in George Town. The seed planted by Vince and Legare is finally bearing fruit. Perhaps deferred gratification makes the experience all that more satisfying after nearly thirty years of germination. 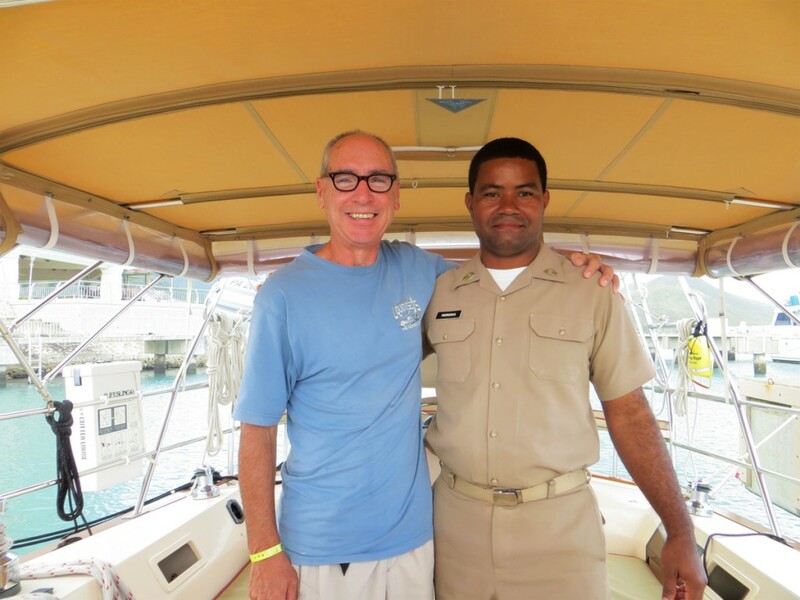 George Town is a mecca for cruising sailors. 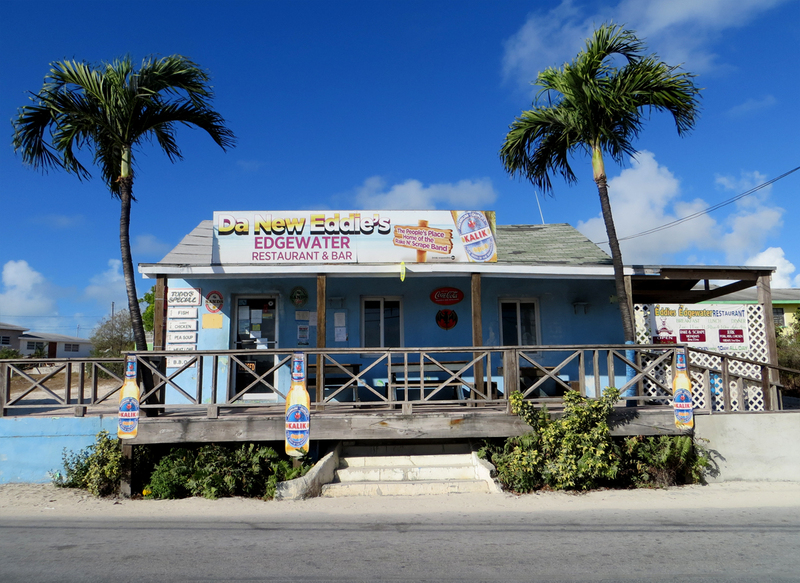 It is the yachting center of the Exumas. 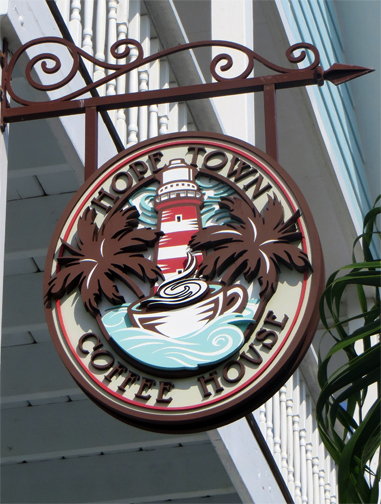 For boats headed to and from the Caribbean, George Town is a convenient stopover. For others, it is a winter destination unto itself. In the yachting community, George Town is sarcastically known as “Chicken Harbor” because many boats with Caribbean aspirations arrive in George Town and never leave. 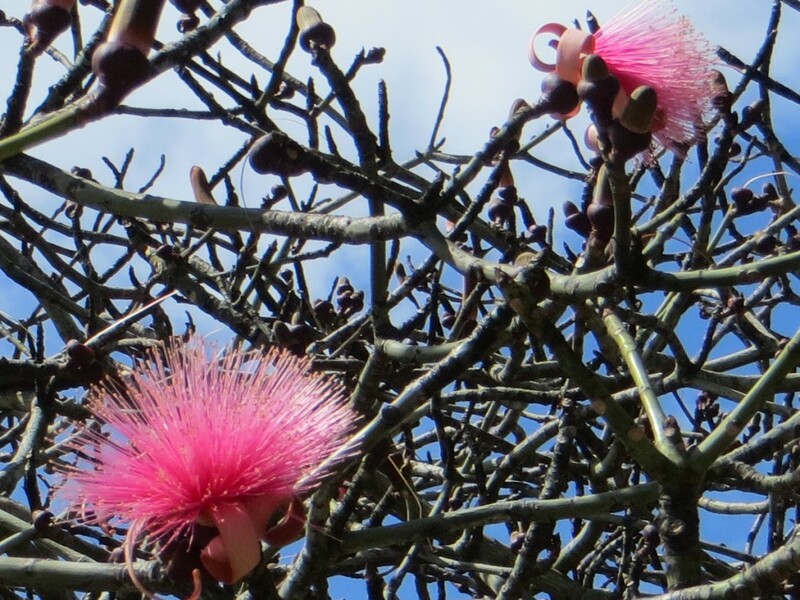 One reason to remain in George Town is because the “thorny path” southward to the Caribbean is a challenging journey into the prevailing easterly trade winds that requires considerable patience and perseverance. Another reason to stay is because life is simple here. Everything that a cruiser might need in the way of provisions, services and eating and drinking establishments is a short dinghy ride away. With several dinghy docks from which to choose, the town is exceptionally cruiser-friendly. Townsfolk are generally warm and conversational. These amenities have not gone unnoticed by the boating public. A recent count revealed almost 400 cruising boats in the harbor at the peak of the season. The cruising community is quite active and organized. 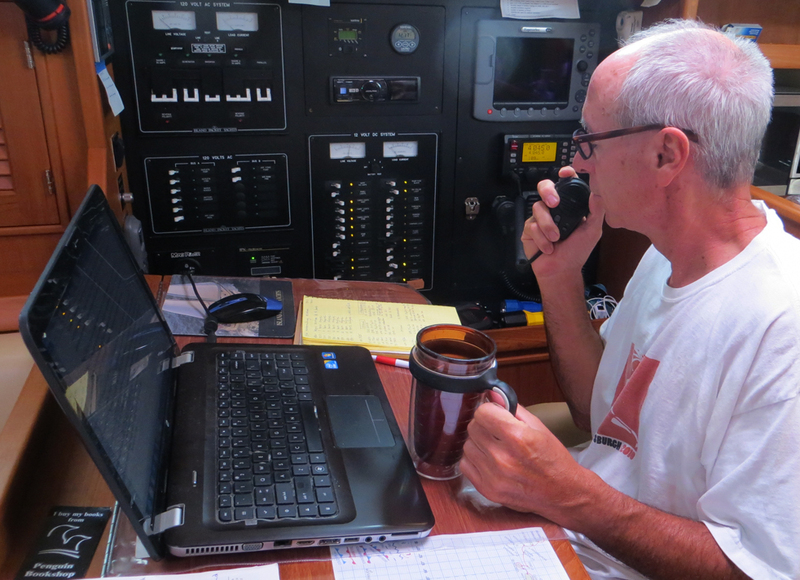 From early morning to late afternoon, the VHF radio is buzzing with cruiser chit-chat and water taxi communication. Every morning at 8AM, the cruiser’s net on the VHF radio provides a rundown on the day’s activities which typically include morning yoga and water aerobics followed by volleyball, softball, art-on-the-beach classes, dominoes, Scrabble and Texas hold ‘em poker games in the afternoons. 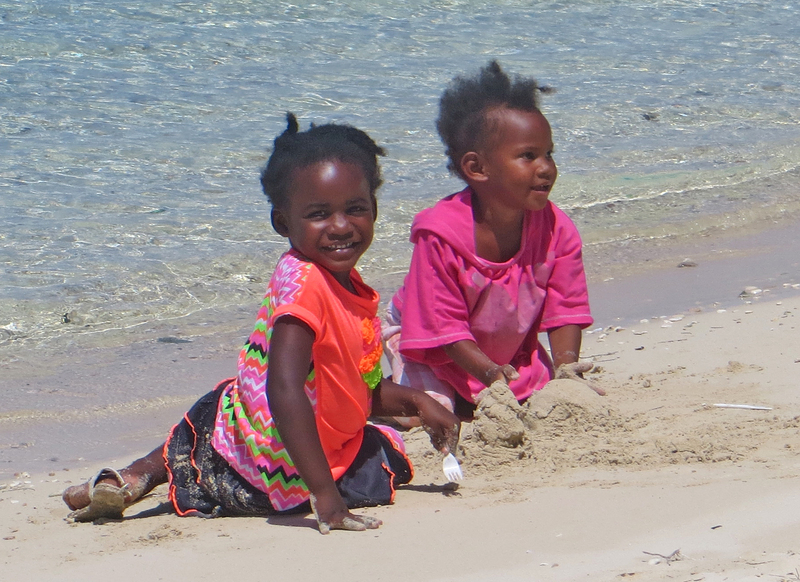 Most of the cruiser activities take place on the lovely beach at Stocking Island. 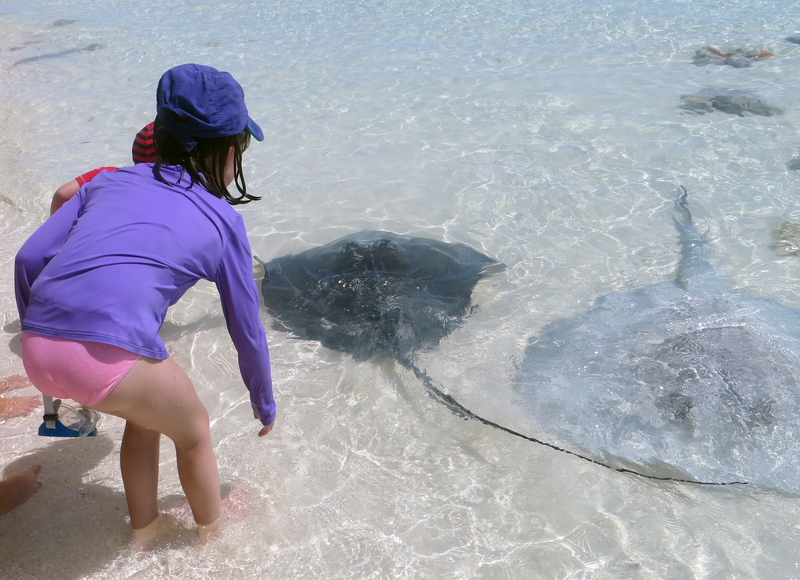 Rays swim right up to where the water meets the beach to interact playfully with the children. Watch out for the barb at the end of that tail! One area of the beach is reserved for dinghies and water taxis. 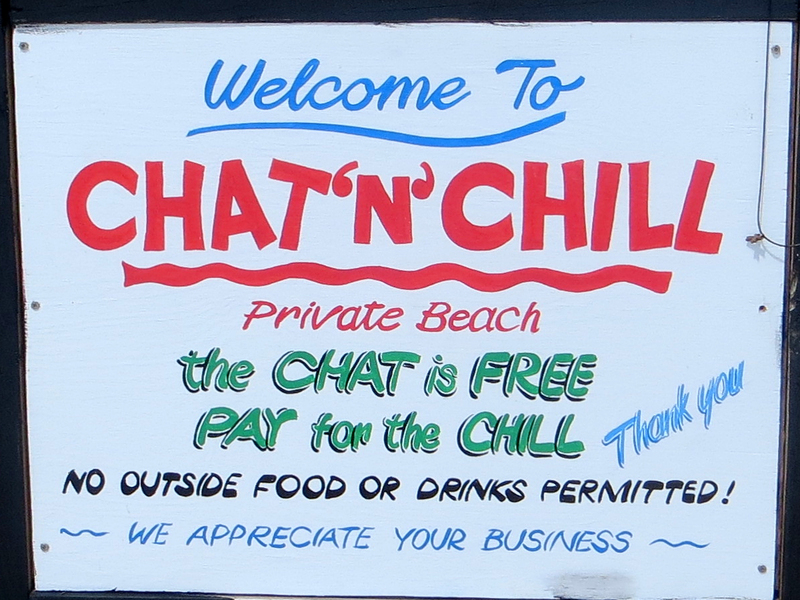 The venue for most activities is an iconic beach bar called Chat ‘n Chill. 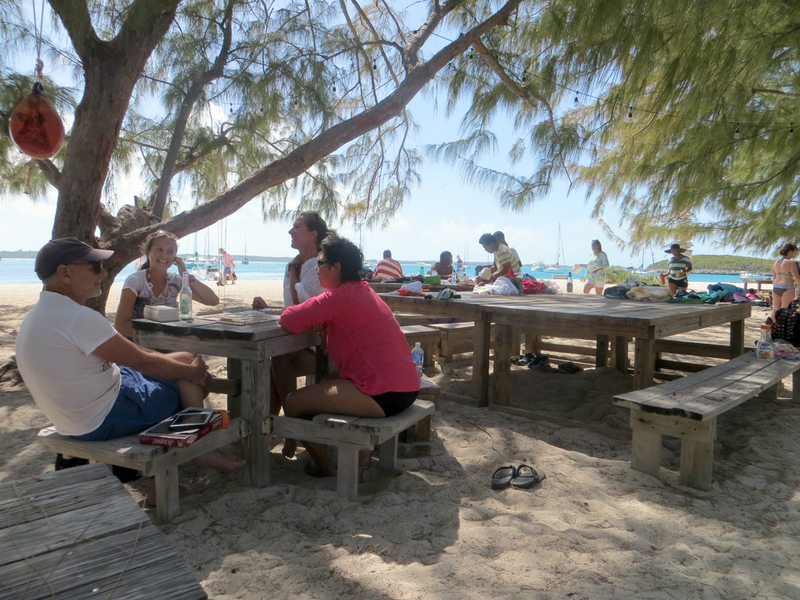 A cluster of pines provides protective shade for the picnic tables located near the volleyball courts. 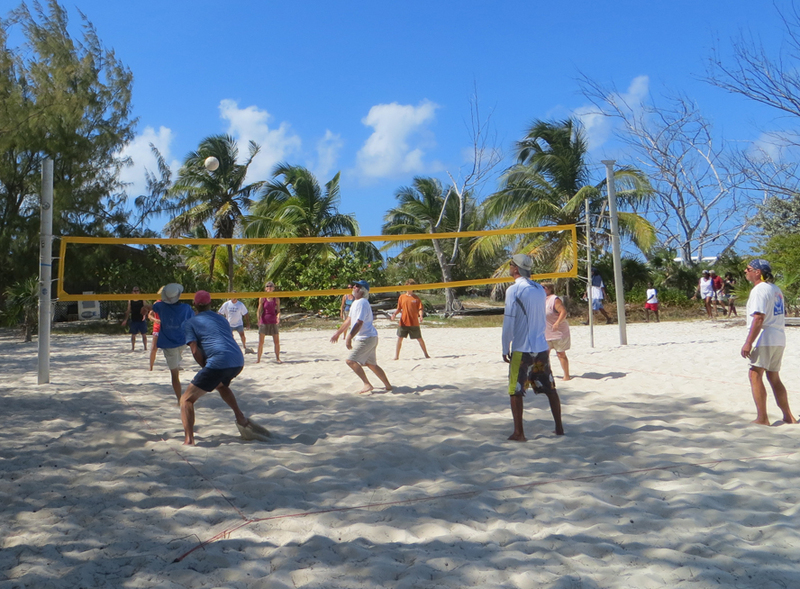 Here, locals and cruisers alike engage in conversation, play table games and watch the volleyball action. Elizabeth Harbor provides a variety of anchorages for every wind direction. Most boats anchor near Volleyball Beach on Stocking Island in order to be close to cruiser activities and for protection from prevailing easterlies. From here, it is a one-mile dinghy ride across Elizabeth Harbor, under the diminutive Main Street Bridge and into Lake Victoria. 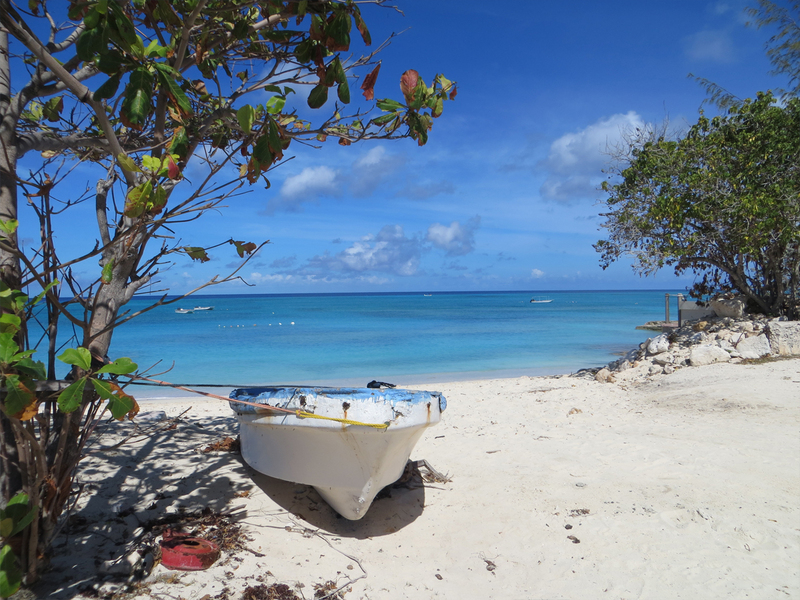 On Sunday, April 5th, we are off in the dinghy for an early breakfast at the Peace and Plenty Hotel followed by the 11 AM Easter service at Saint Andrew’s Anglican Church. The sanctuary is packed this morning. Not only is today Resurrection Sunday, but a baptism celebration as well. Four infants are baptized today. The extended family of each child is seated together in the front of the sanctuary. They are attired in matching shirts, ties and dresses. There is no problem associating the family members that correspond with each infant. The personable Bahamian Rector delivers an inspiring message, frequently interjecting subtle humor to the obvious delight of parishioners. This service is an interesting blend of traditional liturgy, soulful gospel music and lively interaction between the Pastor and his flock. At 1:30 PM, we discreetly depart through a side exit along with a handful of other cruisers. For all we know, this service may still be in progress. Since Easter Monday is a national holiday, all of the shops in town are closed. On Tuesday morning, George Town is buzzing with activity. The stores are filled with customers and there is a lineup of 20 some vehicles waiting to buy petrol at the Shell station. 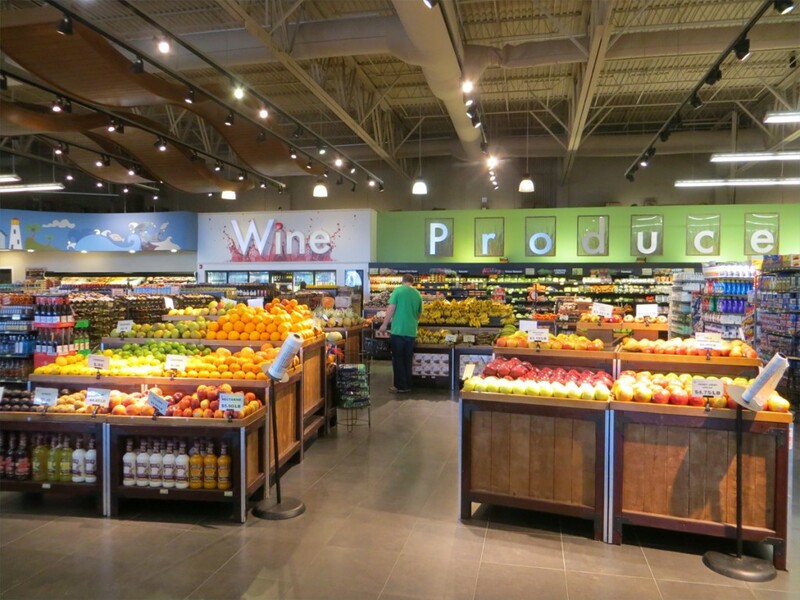 The inter-island mail boat has obviously arrived because the shelves in the grocery stores are filled with fresh produce and customers. This is good news because the supply of fresh fruits and vegetables aboard Cutter Loose had become severely depleted during our trek north through the out islands of the Bahamas. 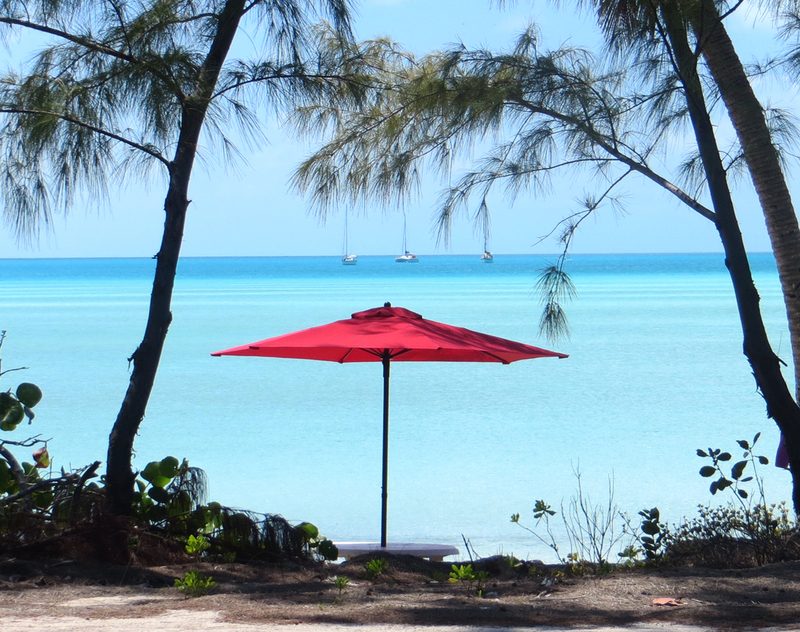 The galley has not been provisioned since Providenciales in the Turks and Caicos… nearly three weeks ago. As the wind velocity gradually builds, the trip into town via dinghy becomes more interesting each day. With over two miles of unobstructed fetch, the easterly trade winds funnel into the narrow tunnel that leads from Kidd’s Cove in towards the dinghy dock inside Lake Victoria. Since this water is only a few feet in depth, the waves are short and steep, causing the dinghy to surf through the tunnel. The return trip from town to our anchorage at Volleyball Beach is even more challenging. The wind is now on directly our nose, requiring the dinghy to plow its way through over a mile of steep, frothy whitecaps. Our belongings are covered in a giant plastic garbage bag, but our clothing is soaked with saltwater by the time we arrive at Cutter Loose. Our “go to town” outfits are used, dried in the sun and stored for reuse day after day. It makes little sense to break out clean clothing only to have it saturated within minutes after a minute or two in the dinghy. This is the infrequently admitted, funky side of cruising. 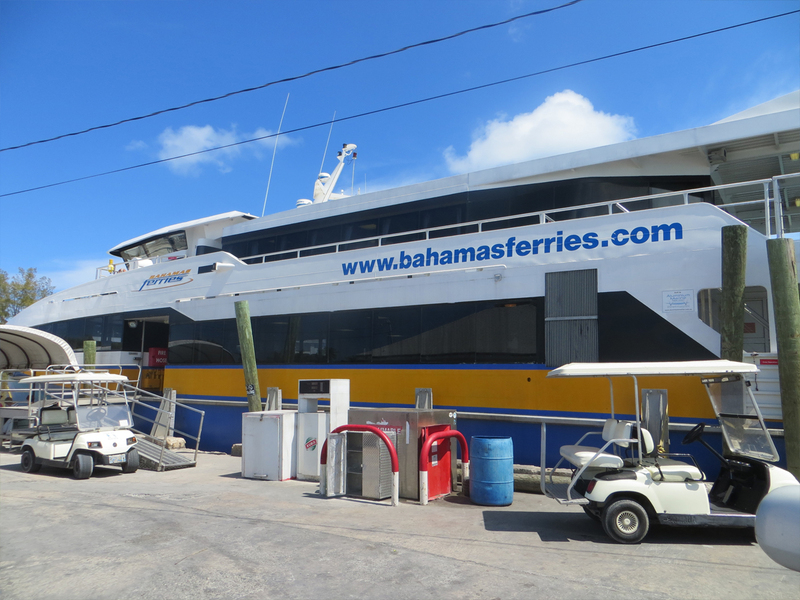 After five days of enjoying the civilized pleasures of George Town, the time has come to begin the next leg of our journey…cruising the Exuma chain. Settled weather in the forecast appears conducive for a Friday morning departure from Elizabeth Harbor. 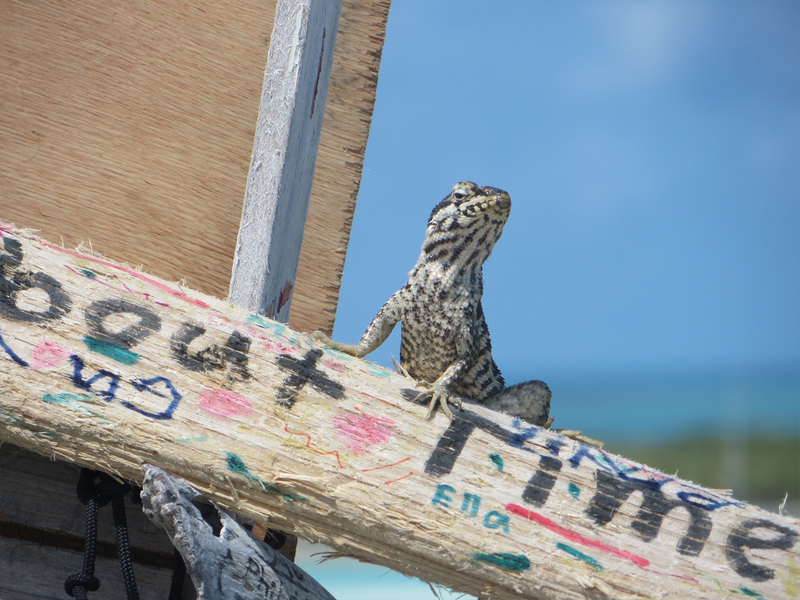 Following the passage of a weekend cold front, improving weather on Monday, March 30th sets the stage for the next leg of our journey…a visit to the Jumentos Cays. 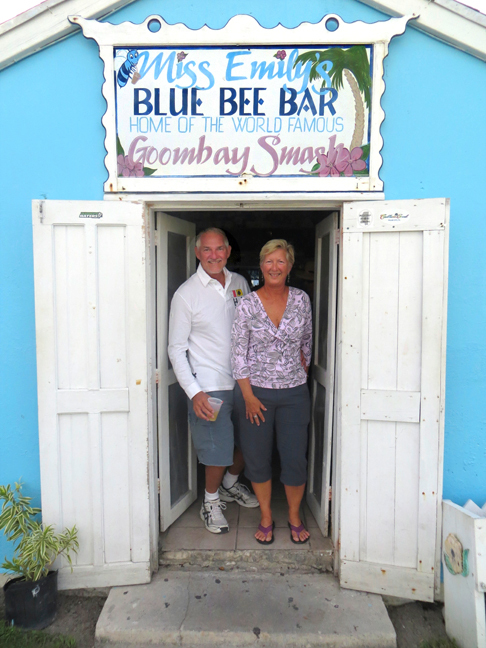 The plan is to spend several days cruising the Jumentos Cays before reaching George Town in the Southern Exumas. 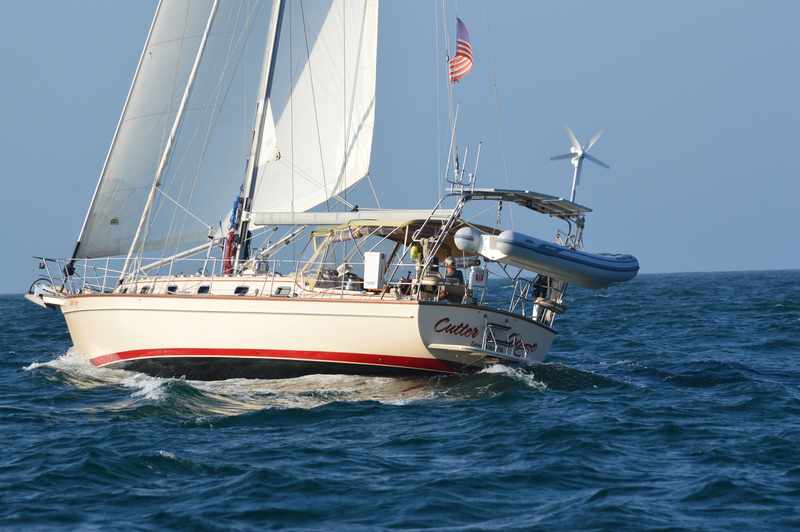 After three days at anchor in Clarence Town harbor, Cutter Loose is underway at noon on Monday for a 30-mile sail along the eastern coast of Long Island to South Point. The skies remain overcast, the wind remains gusty and the seas remain lumpy in the aftermath of the cold front, which has now moved on to our south. The front may have passed, but its aftereffects are still very much in evidence today here in the waters off of Long Island. 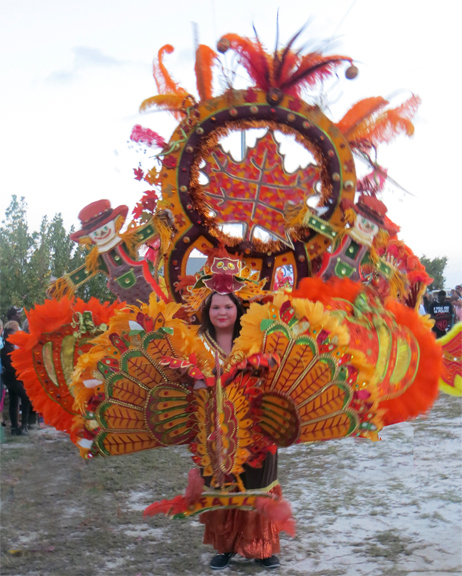 With unrelenting 20-knot winds and light, intermittent rain, a light rain jacket is needed to keep us warm and dry. Strong northeasterly winds over the weekend have pushed water in the Crooked Island Passage onto the eastern shore of Long Island. Although the wind is abating somewhat today, the seas are still choppy and confused. At the southern tip of Long Island, northeasterly winds clash with a southwesterly current. Wind against current…always a deterrent. At 5 PM, the anchorage at South Point is a welcome sight. Also known as Gordon’s Anchorage, our home for the night is a delightful spot in the lee of a sandy beach. An invisible underwater wrap-around reef curls from the southern tip of the island to the northwest in a graceful arc, providing good protection from northeasterly, easterly and southeasterly winds. At the time of our arrival, the anchorage is empty and calm. The icing on the cake is a soft sand bottom…excellent material for securely setting the anchor. Tonight, there is no moon or stars. Nor is there any concern whatsoever about wind, wave or unsettled conditions in our little peaceful corner of the world. Tuesday, March 31st brings improved weather to the neighborhood. Under sunny skies, the anchor is up at 7:30 AM at South Point. Moderate, northeasterly winds at 15 to 20 knots send Cutter Loose on a broad reach to the Jumentos Cays…a 60-mile string of tiny islands and cays that form the boundary between the shallow waters of the Great Bahama Bank to the west and the deeper water of the Atlantic Ocean to the east. Only a few islands in the Jumentos are inhabited. This is a pristine area with few visitors other than fishermen and the occasional cruising yacht. Our point of entry to the Jumentos Cays is Man of War Channel…a cut in the island chain between Man of War Cay to the north and Jamaica Cay to the south. Today’s 60-mile journey from South Point, Long Island is delightful, downwind sailing. Five miles to the east of the cut, several extremely low-lying islands come into view. Land ho! Once through the cut, Cutter Loose enters the shallow waters of the Great Bahama Bank. 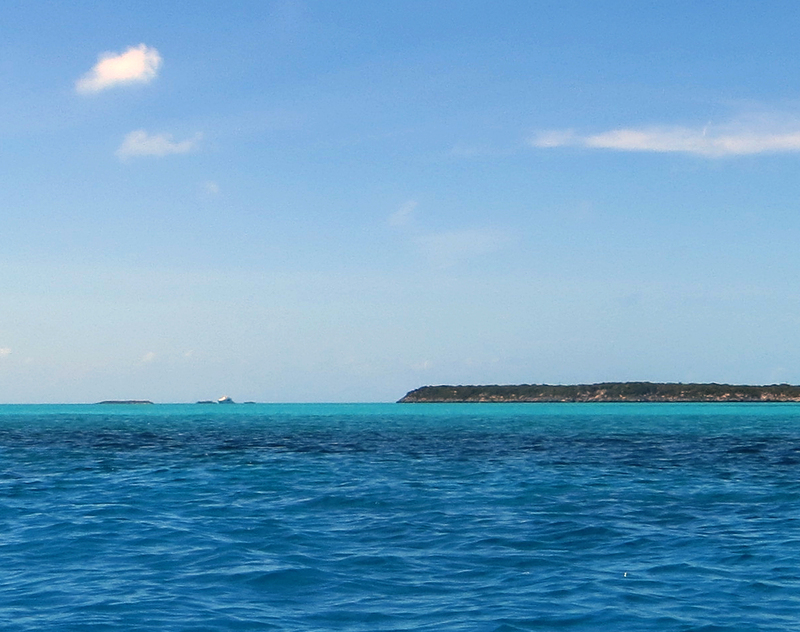 Turning northeast into the wind, it is another ten miles beyond Man of War Cay to our destination at Flamingo Cay. The friendly wind that has given us such a pleasurable sail from South Point today has shed its sheep’s clothing. This wolf of a wind is now kicking up a nasty chop on the Bank with steep 2 to 3 foot waves spaced only a few seconds apart. Soon, Cutter Loose is taking waves on the foredeck as she pounds her way towards our destination. After two hours of rodeo action, the anchorage at Flamingo Cay is within sight. It is a calm and protected lee anchorage with no other boats in sight, other than a fishing boat in the cove to the north. Anchorages in the Jumentos Cays have a reputation for being windy and impacted by surge, due to the numerous cuts between all of the tiny islands in the chain. Fortunately, there is a complete absence of swell in our anchorage tonight. The weather on Wednesday, April 1st is quite settled, as forecasted. 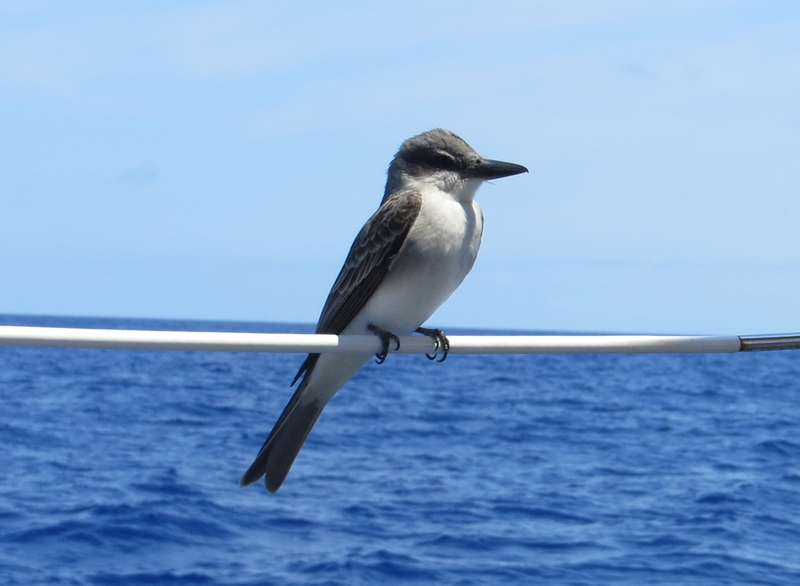 The overall exposure and isolation in the Jumentos Cays compels the prudent sailor to think in defensive terms. We are not enthusiastic about a replay of yesterday’s bouncy slog to windward. 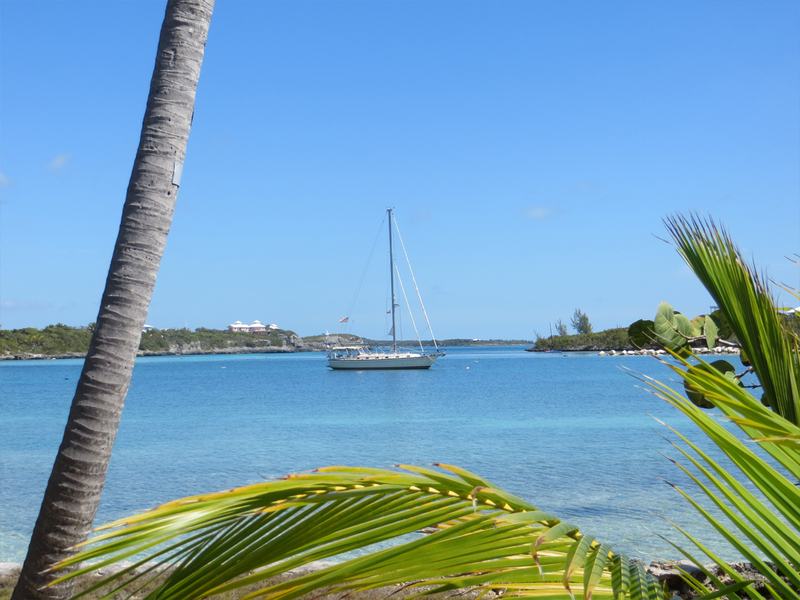 Taking advantage of the calm weather and in light of the fact that the next few days are expected to bring winds in the 20 to 25 knot range, the anchor is up at Flamingo Cay for the short 15-mile run northeast to Water Cay. Passing to starboard along the way are a series of tiny cays, including Torzon, Lanzadera, Melita as well as several unnamed large rocks that lie between the larger cays. 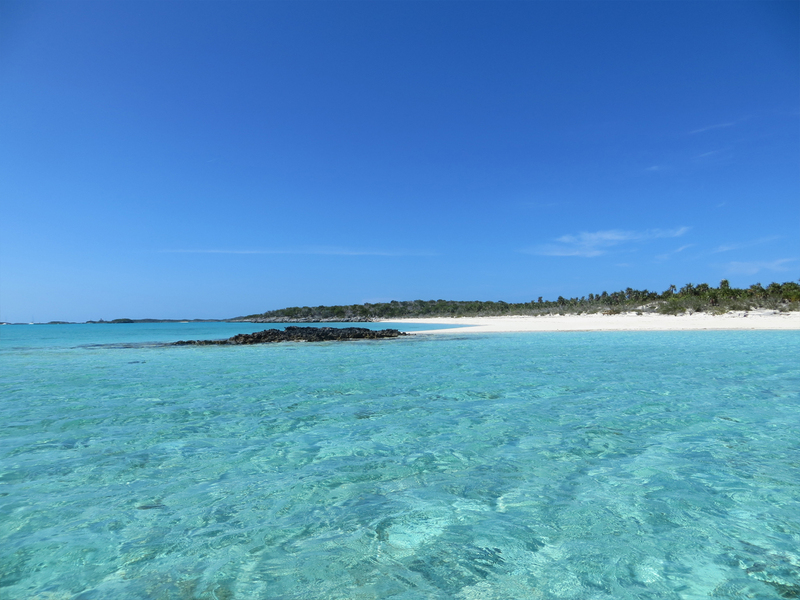 At 2 PM, Cutter Loose is anchored in sand in the lee of Water Cay. This is an awe-inspiring place to be…evoking a feeling of remoteness and being one with nature similar to that imparted by the Tobago Cays except without the crowd. An outstanding view of the beach and nearby rock formations frames the view to the east, while impressive sunsets provide early evening entertainment to the west. Waves pounding the Atlantic side of this low-lying Cay produce explosive plumes of water reaching skyward in dramatic bursts. 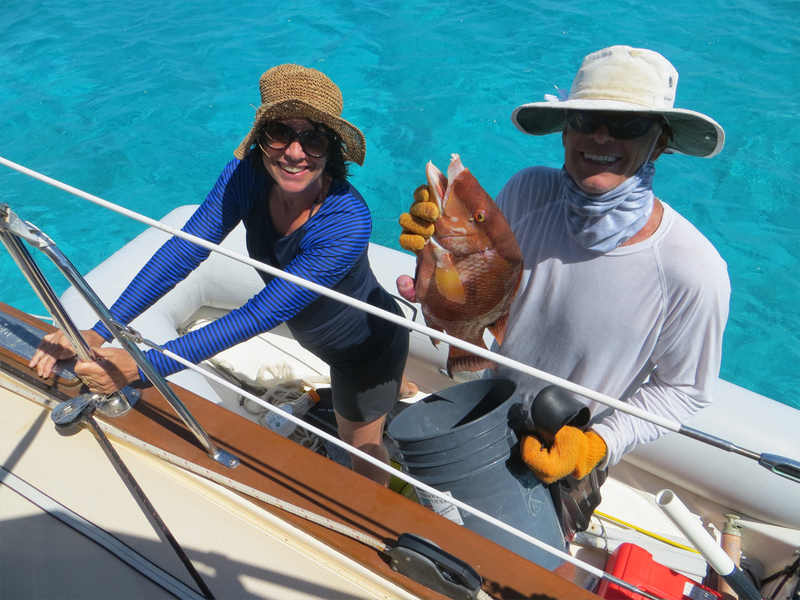 A Floridian cruising couple from the catamaran anchored a half mile to the north stops by at Cutter Loose to say hello and to show us their freshly speared hogfish, caught on the reef just minutes earlier. As the saying goes, no man with a big fish walks home through the alley. Given the windy weather forecast for the next few days, life settles into “slow down mode” aboard Cutter Loose. We will remain at anchor here until the wind subsides, presumably on Saturday. Until then, our days are filled with visits to the beach, boat chores, reading, recorded music, board games, gazing at the scenery, listening to shorebirds and watching attentively for the “green flash” at sunset. 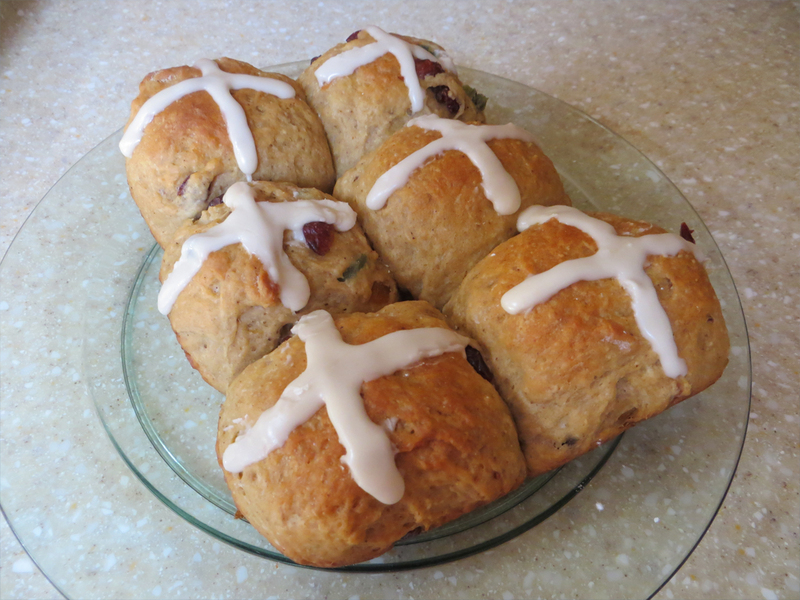 Since Easter weekend is rapidly approaching, Pat fine tunes her baking skills, creating a sextet of delicious hot cross buns. After the dinner dishes are washed and dried, the evening entertainment frequently consists of a movie. It never ceases to amaze how these days at anchor disappear so rapidly. Another interesting and important task while at anchor in the Jumentos involves researching the charts and cruising guides in anticipation of the next leg of our journey to and through the Exuma chain. 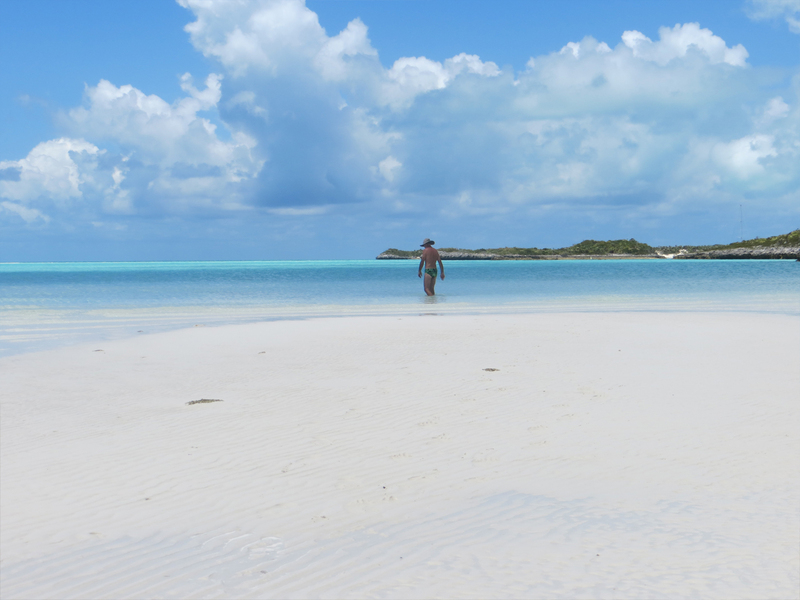 Although George Town in the Exumas is a scant 40 miles from Water Cay as the crow flies, the route to our next destination is through shallow water and therefore requires thoughtful planning. Since the waters of the Bank are shallow, the path from the Jumentos follows a highly prescribed route that requires us to play the tides in order to pass through particularly shallow areas. 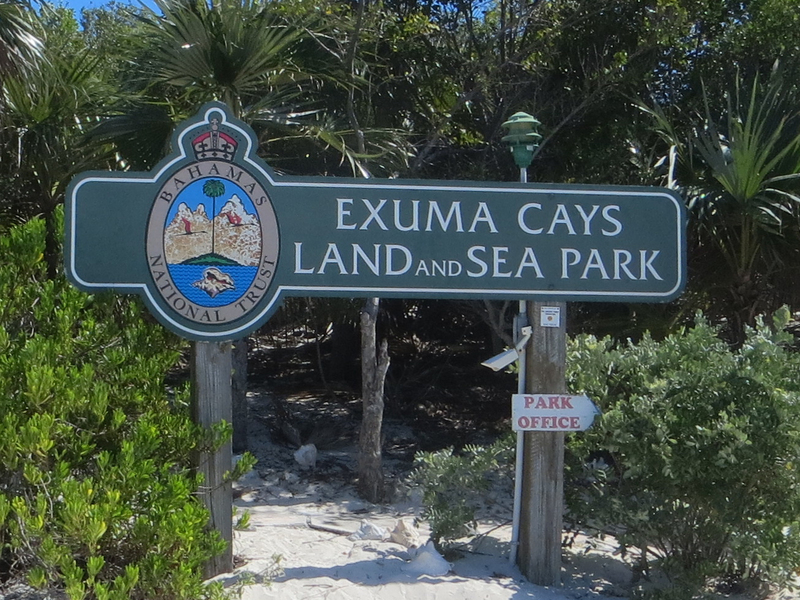 The most direct route between the Jumentos and George Town is via Hog Cay Cut that separates Little Exuma Island from Hog Cay. This is a narrow cut with a hard bottom and just a little over 5 feet of depth at high tide. Given her draft of 5 feet, there would be a scant 3 or 4 inches of water under the keel of Cutter Loose if we timed our passage through this “short cut” at precisely high tide. 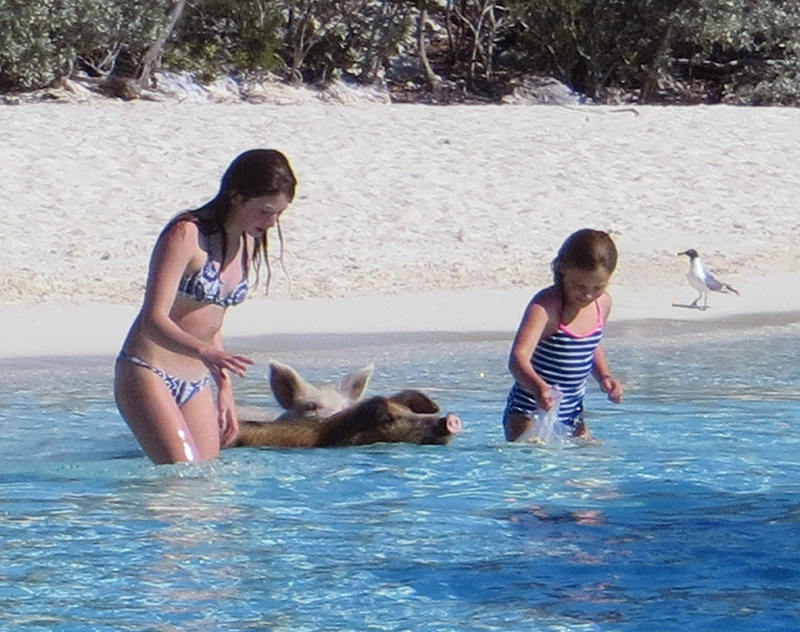 Hog Cay Cut imposes a considerable amount of risk in exchange for the paltry reward of saving a few hours’ time. The lower risk alternative is to follow Comer Channel, located about 20 miles to the north of Water Cay and 10 miles west of the northern neck of Long Island. Comer is not a dredged channel, nor is it marked in any way with aids to navigation. Rather, it is a marginally deeper east/west path across an 11-mile section of the Bank that is used primarily by fishermen traveling between Long Island and the Jumentos Cays. Depths in the Channel are reportedly 6 feet at mid tide. The weather forecast for Saturday calls for moderation in wind and sea…an excellent one-day window to transit the Comer Channel before the wind increases again on Easter Sunday. Missing this one day weather window could easily translate to spending another week or more here in the Jumentos. Such is the nature of the Jumentos Cays. It is an isolated and beautiful place. One can be comfortable here in prevailing easterlies. But it is unforgiving during the passage of a cold front. Bailout options are few and far between. Being unable to predict the weather for more than a few days, cruisers must be prepared for an extended stay when visiting this area. 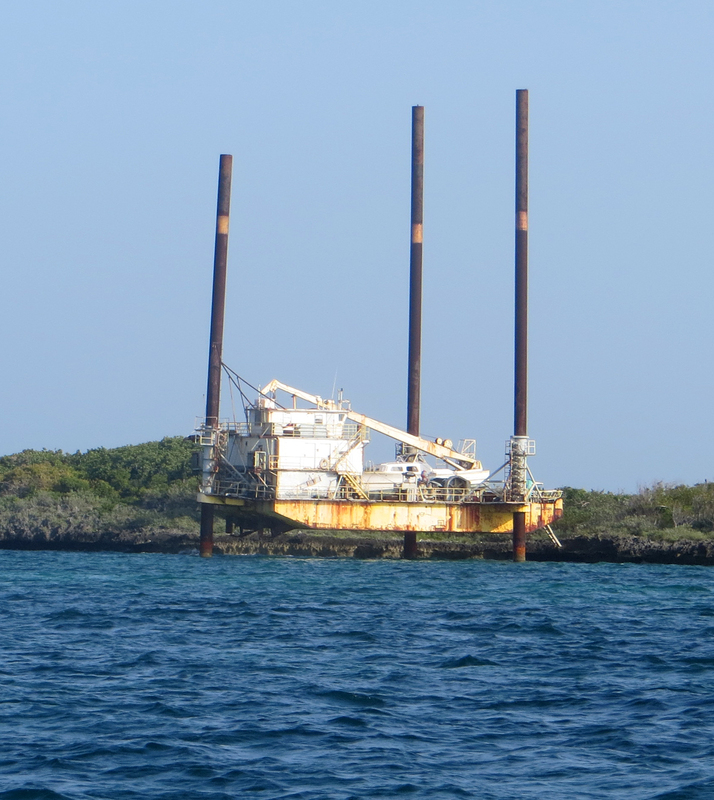 On Saturday, April 4th, the anchor is up at Water Cay at 4 AM. The full moon is a welcome companion this morning. Not only does it illuminate the water, but it also creates an abnormally high tide, providing an extra margin of comfort for today’s assignment. Our early morning departure is timed to position Cutter Loose at Comer West around 8 AM at mid tide rising. From here, we will ride the rising tide, exiting the Channel at Comer East around high tide. Fortunately, today’s float plan comes together quite nicely. 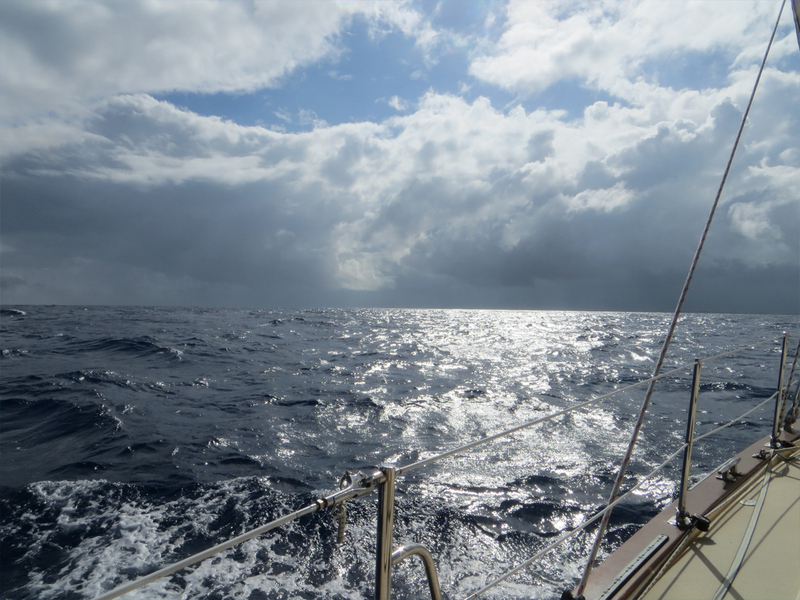 Turning east into the Channel, the wind subsides to 10 knots, calming the water and increasing our speed over ground. By 10:45 AM, it is high tide and our transit of Comer Channel is complete. Not once during today’s transit of the Channel did we experience water depths of less than 8 feet. From Comer East, it is another 30 miles to George Town. 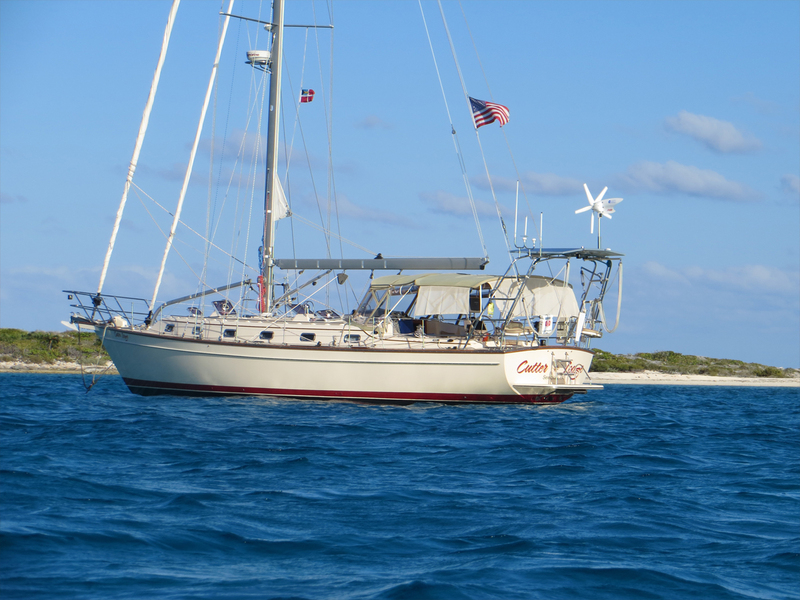 Our course takes us north around White Cay Bank then west along the north coast of Hog Cay to North Channel Rocks, the entrance to Elizabeth Harbor. 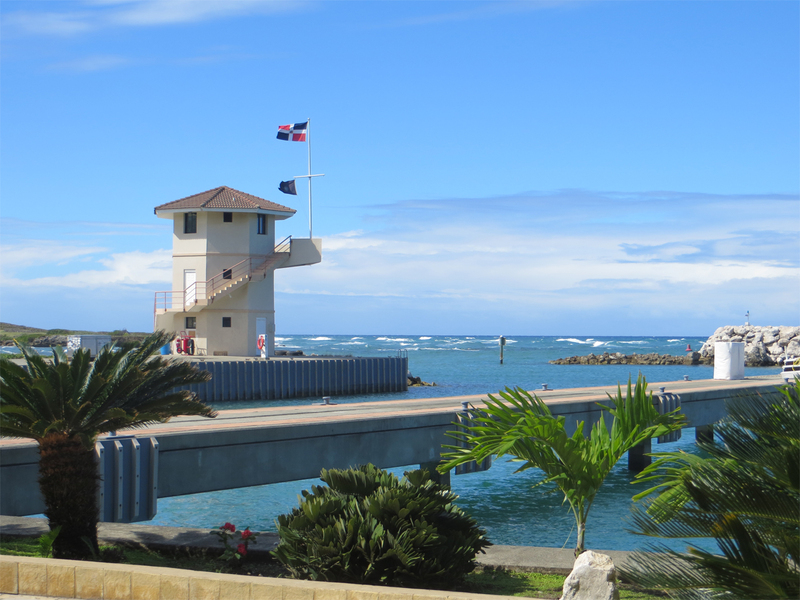 At 3 PM, the anchor is down in the lee of Stocking Island, not far from Volleyball Beach…the focal point of cruiser activity in George Town. 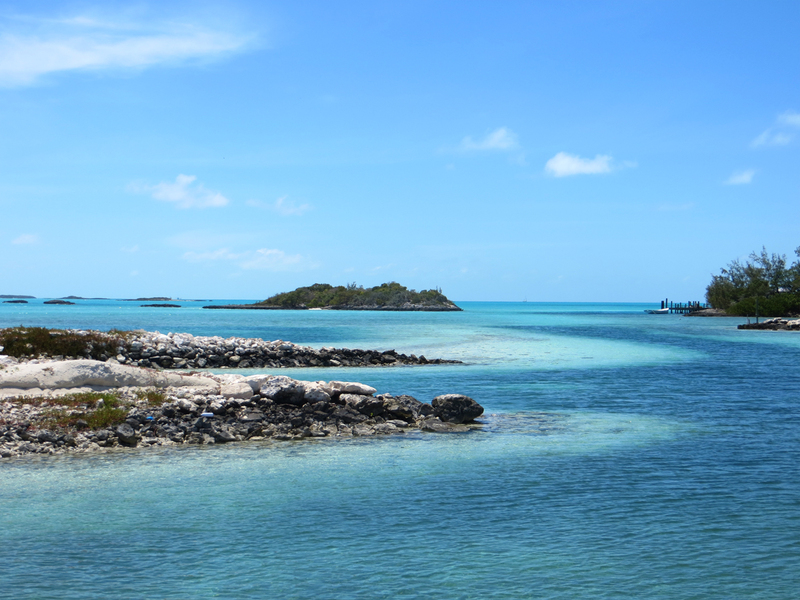 With the completion of today’s 69-mile journey, we bid farewell to the out islands of the southern Bahamas and enter the Exuma chain in the central Bahamas. In the process, we are transported to another world. There are hundreds of boats at anchor here in George Town. A steady stream of dinghies and water taxis ply the waters of Elizabeth Harbor between town and Chat ‘n Chill, a popular eating and drinking establishment on Volleyball Beach. Goodbye pristine isolation…hello civilization. There is yet another milestone that has been reached during today’s journey. 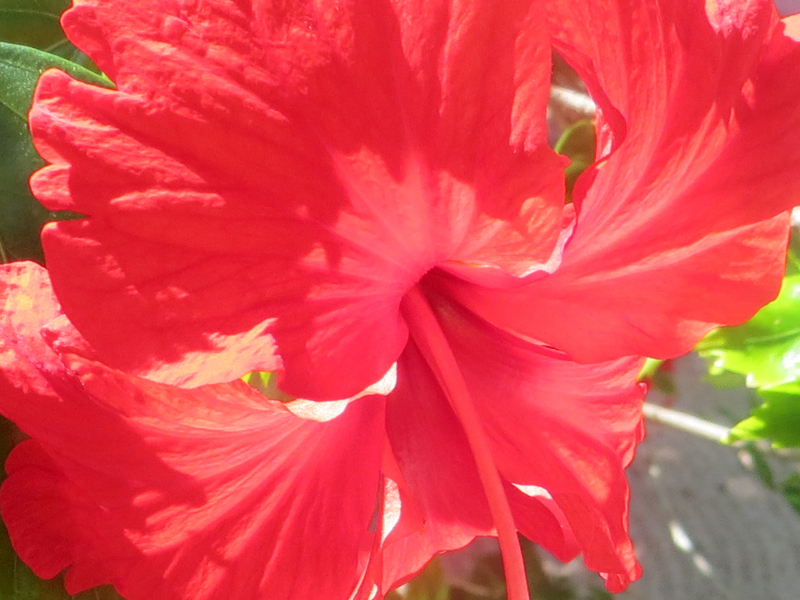 One hundred twenty two days ago, our winter cruise began at 12 degrees north latitude on the south coast of Grenada. Today, Cutter Loose crossed an imaginary line at 23 degrees, 27 minutes north latitude known as the Tropic of Cancer. Each year on June 21st, the sun is directly overhead at this latitude. 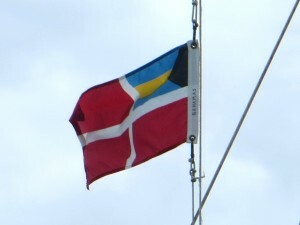 For the first time in over three years, Cutter Loose is no longer sailing in tropical waters. Tomorrow we will begin our exploration of this vibrant community. This afternoon, however, it is time to contemplate our progress and savor today’s dramatic transition. 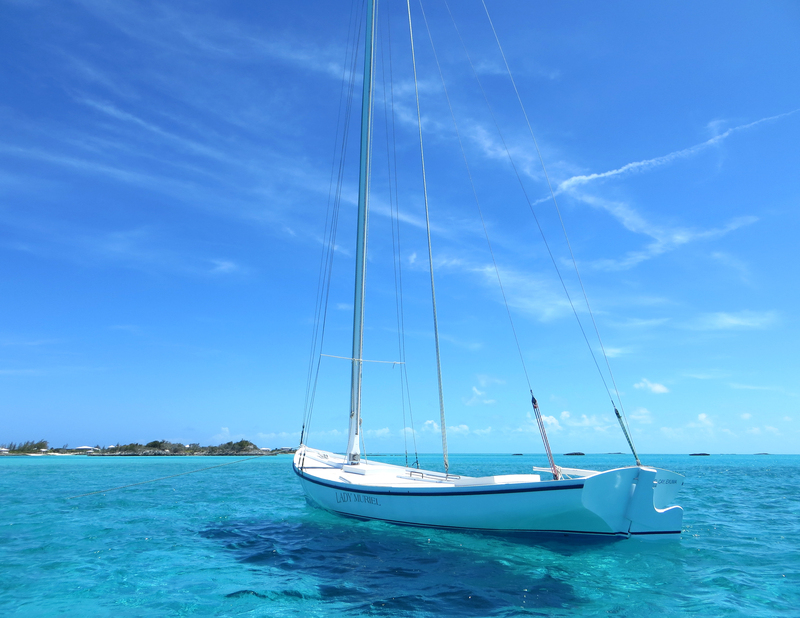 At 8:30 AM on Sunday, March 22nd, the anchor is up in Sapodilla Bay, Providenciales for today’s 55-mile run across the Caicos Passage to Southeast Point on the island of Mayaguana. The initial nine-mile leg of this trip follows the Sandbore Channel, due west across a shallow bank, to the much deeper water of the Atlantic Ocean. From here, a course of 330 degrees takes us to the island of Mayaguana, the eastern gateway to the Bahamas for vessels arriving from the Caribbean. In light, northeasterly winds, the sailing angle to Southeast Point is a beam reach. Not only is this a preferable point of sail, it is the shortest distance between the Turks and Caicos Islands and the island of Mayaguana. At 5:40 PM, the anchor is down in 15 feet of perfectly clear water off of a white-sand beach. A reef to the east provides a protective lee for tonight’s anchorage. 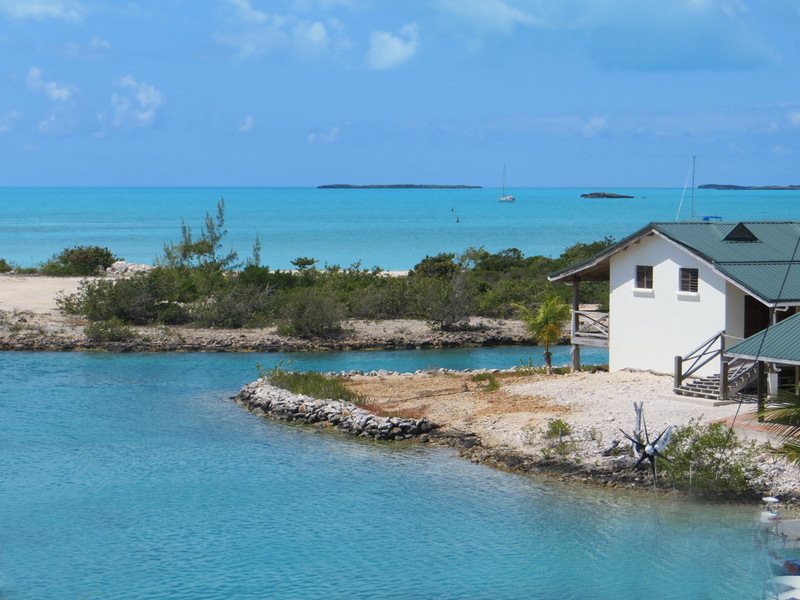 There are 700 islands in the Bahamas, only 30 of which are inhabited. In addition, there are 2,400 smaller uninhabited islands called “cays”. 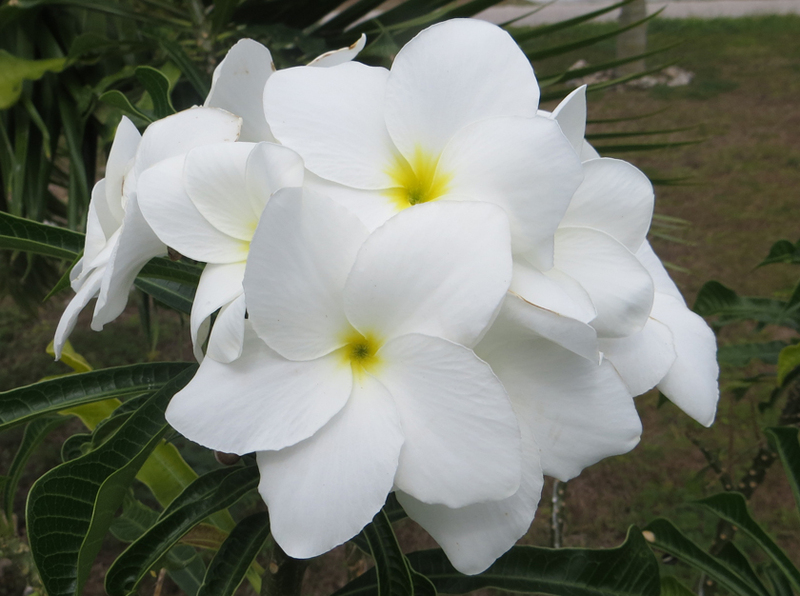 The island of Mayaguana is the easternmost of all of the islands and cays in the Bahamas. 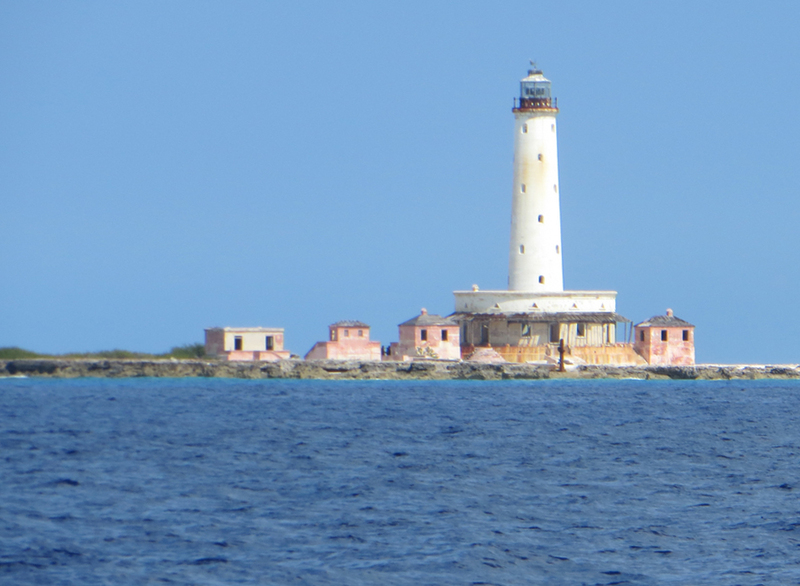 At Southeast Point, Cutter Loose is anchored in the easternmost point on the easternmost island in the Bahamas. In the out islands of the Bahamas, this is as “far out” as it gets. Southeast Point is an isolated place. There has not been another vessel within eyesight since departing Provo this morning. Because the weather is quite settled tonight, the sky is clear, illuminated by a smiling moon in the eastern sky with Venus positioned conveniently nearby. Wavelets lap rhythmically on the beach. There is merely a hint of surge in the anchorage…just enough of a subtle roll to rock us gently asleep after a long day’s sail. On Monday, dawn paints a pastel sunrise at our Southeast Point anchorage. 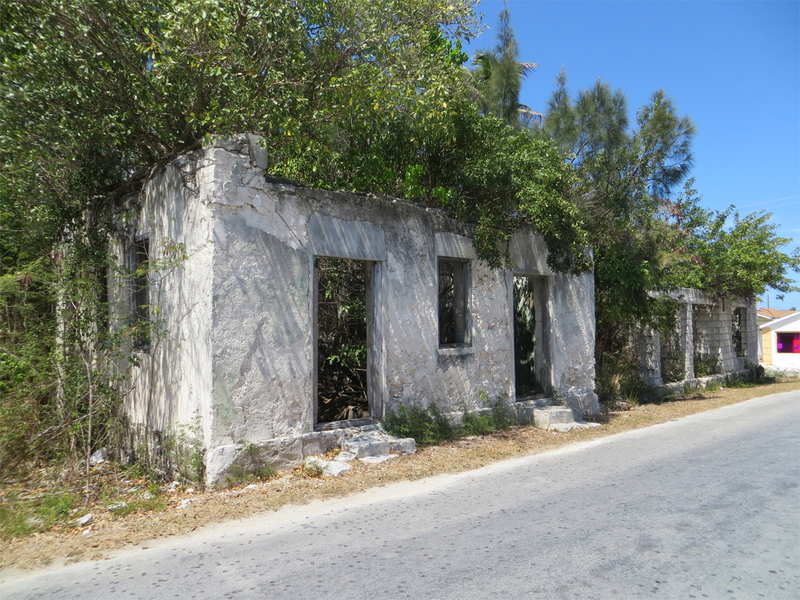 Today’s objective is to clear Bahamian Customs at Abraham’s Bay Settlement, some 15 miles to the northwest. Departing our anchorage at 8 AM places us at the wider, deeper, western entrance to Abraham’s Bay at 11 AM. Abraham’s Bay is a huge body of shallow water. 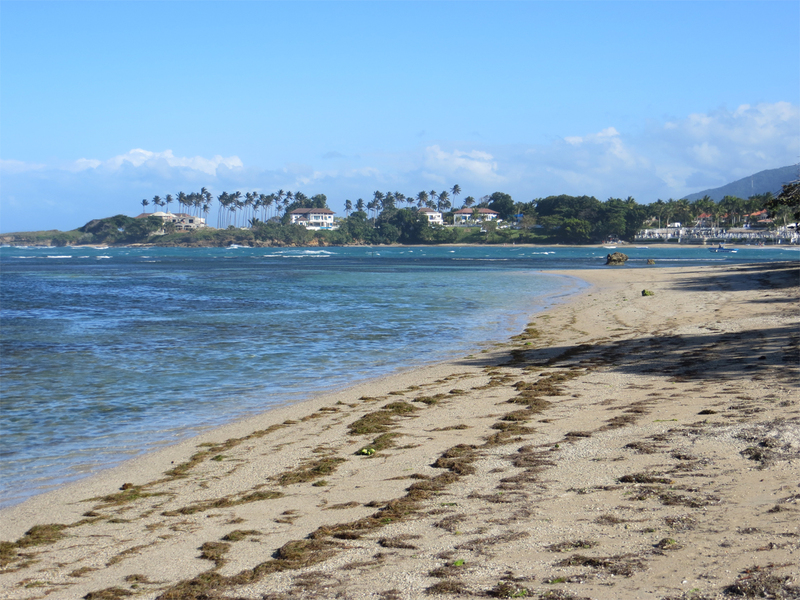 The northern coast of the Bay is formed by a beach on Mayaguana’s south shore. A four-mile reef forms the southern boundary of the Bay, marked clearly by breaking waves. With the sun now directly overhead, it is an easy task to steer around the scattered coral heads while motoring to an anchorage near the Settlement some 4 miles to the east. Given the ultra-shallow water near the Settlement, it is a one-mile dinghy ride from our anchorage to the town dock. The dinghy channel is defined by two range markers and a white path in the sandy bottom scoured by outboard motors. 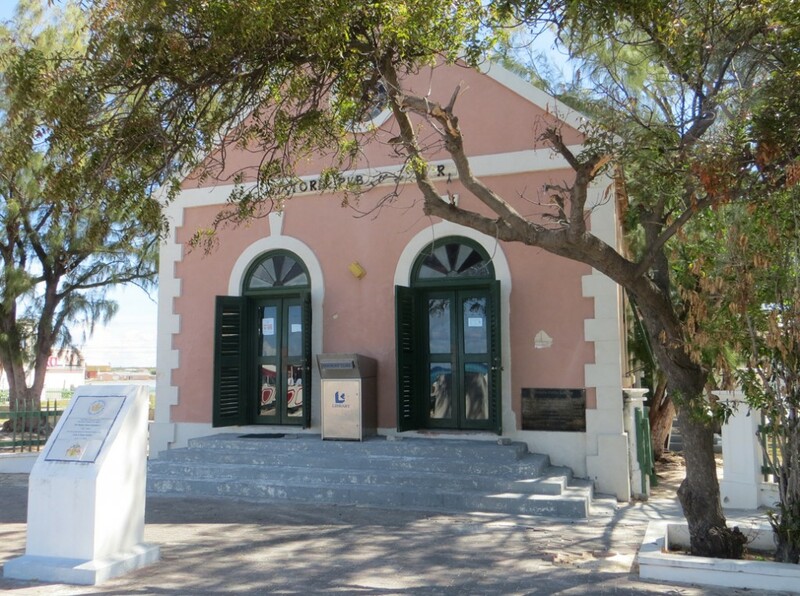 From the dinghy dock, it is a short walk to the BATELCO telephone tower and the compact “standing room only” government office. When clearing in, newly arriving visitors are asked to sign a receipt for a cruising permit. The previous entry in the receipt book was dated March 1, 2015…23 days ago. From this, it can be deduced, that few cruising boats clear Customs at Mayaguana. Waiting patiently outside the government office, Pat strikes up a conversation with a friendly gentleman known as “Skully” Cartwright, a local bone fishing guide. 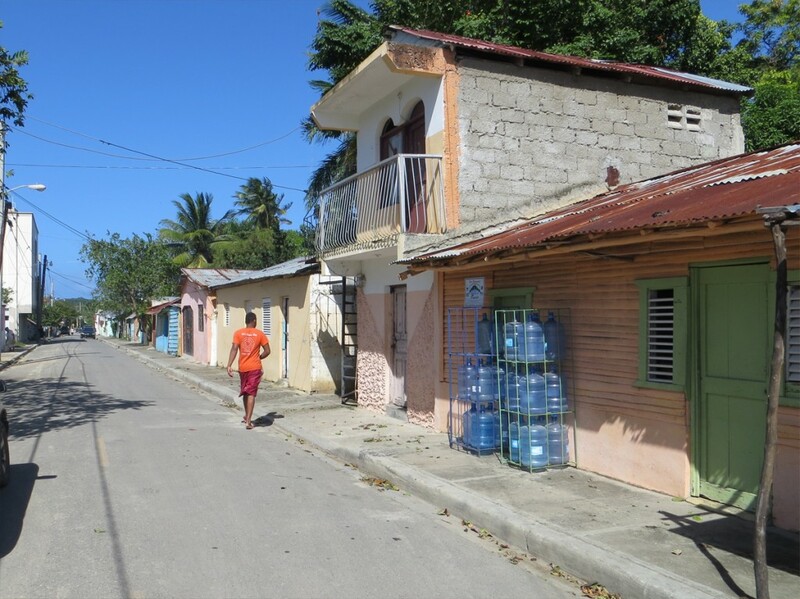 Skully tells us that a total of 300 people live on the island of Mayaguana. There are three villages or “settlements”. Naturally, everyone on the island knows one another by name. Abraham’s Bay Settlement is a hot and dusty place. In addition to the government office and the BATELCO tower, there is one bar, a few shops and not more than a dozen homes. Back aboard Cutter Loose with Bahamas cruising permit in hand, the Bahamian courtesy flag is raised to the spreaders. Since the sun is still overhead, the anchor is up for the short run across the Bay, retracing our track from this morning. 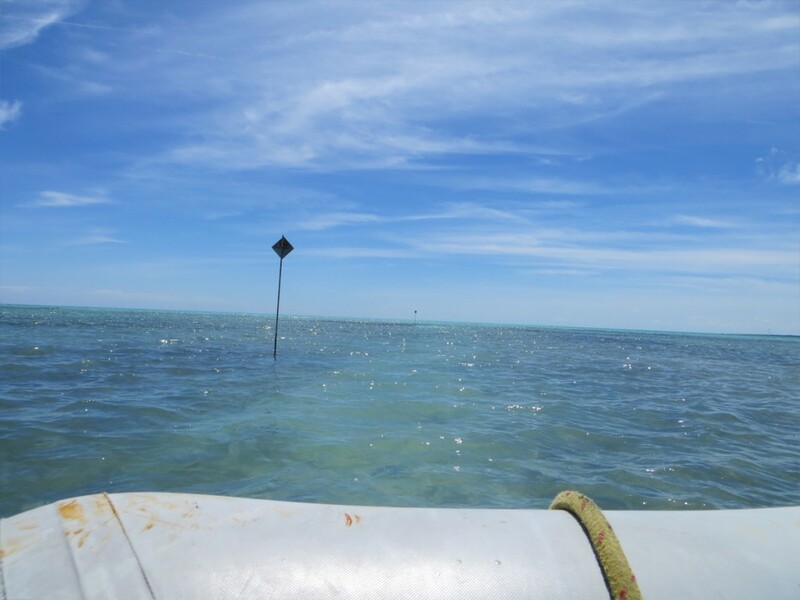 At 3:45 PM, the anchor is down in the deeper water near the western entrance of the Bay. This will facilitate an early departure in the morning without the need to dodge coral heads. 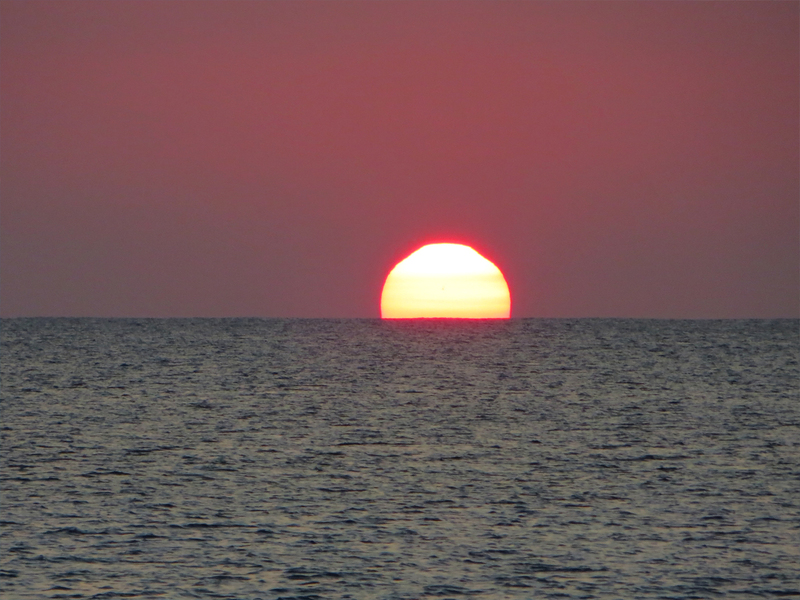 Our reward is a fiery crimson sunset. At 8:30 AM on Tuesday, March 24th, the anchor is up in Abraham’s Bay. Our destination today is Acklins Island, about 60 miles to the northwest. It is another day of downwind sailing in light air, augmented from time to time with an assist from the diesel auxiliary. Along the way, a feathered visitor stops to visit. After using Cutter Loose as a rest room stop, he is on his way. 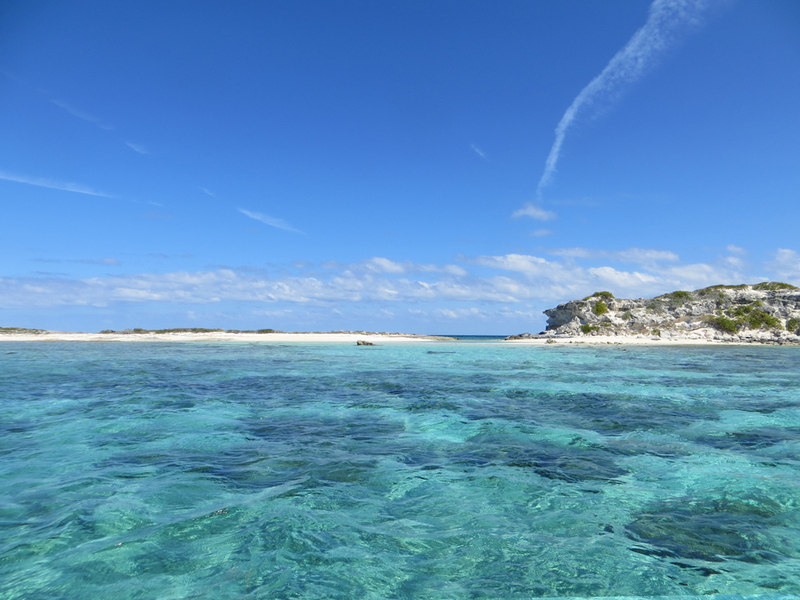 Our course today takes us past the west coast of West Plana Cay, a small uninhabited island with a gorgeous white sand beach. It is tempting to call it quits for the day, dropping the hook off this beach. 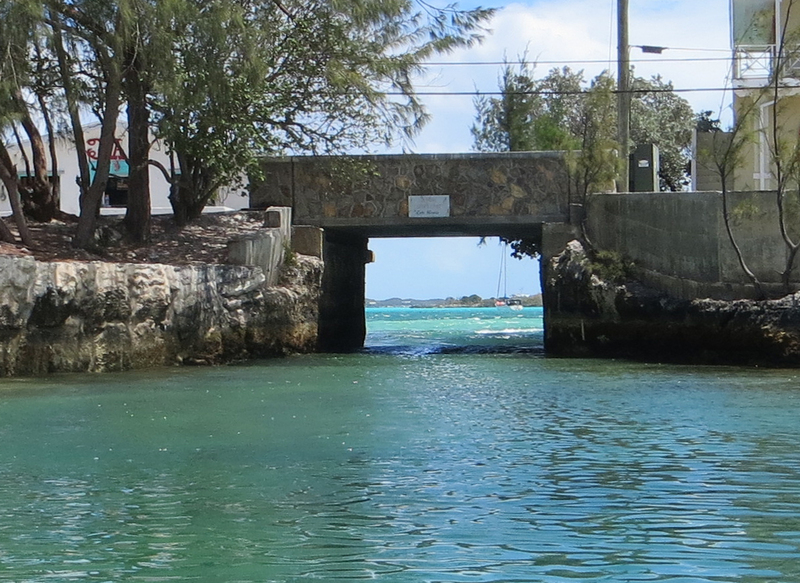 Instead, we press on to Attwood Harbor…a hidden harbor on the north coast of Acklins. Once through the cut in the reef, cantilevered Umbrella Rock stands at attention like a protective sentinel, guarding the entrance to Attwood Harbor. Inside the harbor is our home for the night…an isolated circular bay. There is no town, no buildings and no signs of civilization…just a white beach. The weather remains settled during our stay, making for a pleasant overnight anchorage. On Wednesday, March 25th, the anchor is up in Attwood Harbor for a 36-mile run paralleling the northern coasts of Acklins Island and Crooked Island. From the water, it is difficult to discern where Acklins ends and Crooked begins. Nearing the end of our journey, the Bird Island lighthouse comes into view. This 70-foot structure warns mariners to stay clear of the shallows at the northwest tip of Crooked Island. The tiny community of Pitts Town along with its small airstrip is located nearby. Clearing the reef at Pitts Town Point, the anchor is down at 4 PM in the crystal- clear water off of Pitts Town Beach. 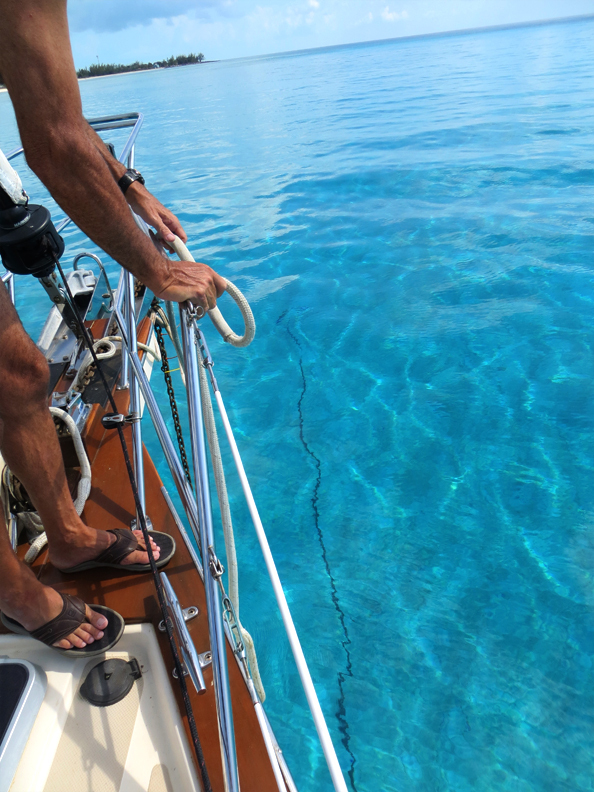 The water is so clear that our anchor chain lying in the sand below remains clearly visible from the foredeck. Following a late afternoon swim, a pod of whales are spotted nearby. Unfortunately, they do not pause to visit. 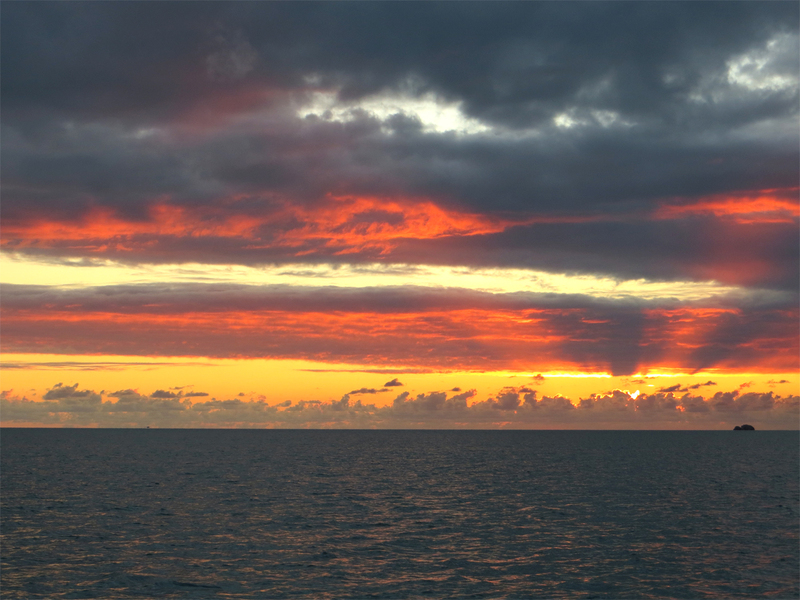 The weather remains settled, providing another calm night at anchor. On Thursday, March 26th, the anchor is up at Pitts Town Point for the 44-mile transit of the Crooked Island Passage to Clarence Town Harbor on the east coast of Long Island. The weather today is partly cloudy with 15 knots of wind dead astern, making for a slow, rolly downwind sail. Approaching Clarence Town, our course takes us north of Booby Rock, then south into this massive harbor leaving the ominous-looking reef at Conch Spit to port. 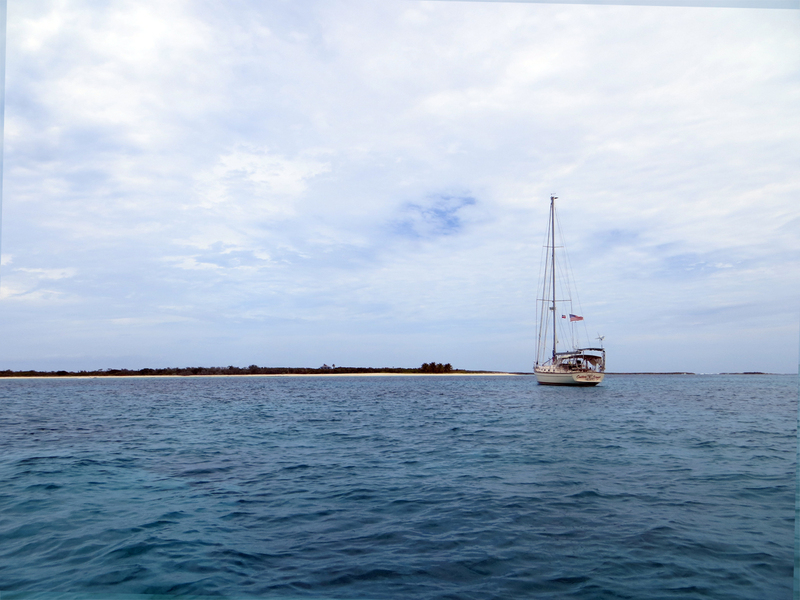 Under increasing cloud cover, the anchor is down just south of the beautiful white sandy beach on Strachan Cay. The settled weather pattern that we have been enjoying for nearly two weeks is coming to an end. A strong cold front is expected to pass through these waters this weekend. The selection of Clarence Town as a destination is decidedly defensive in nature. Over the next few days, it will serve as a harbor of refuge. 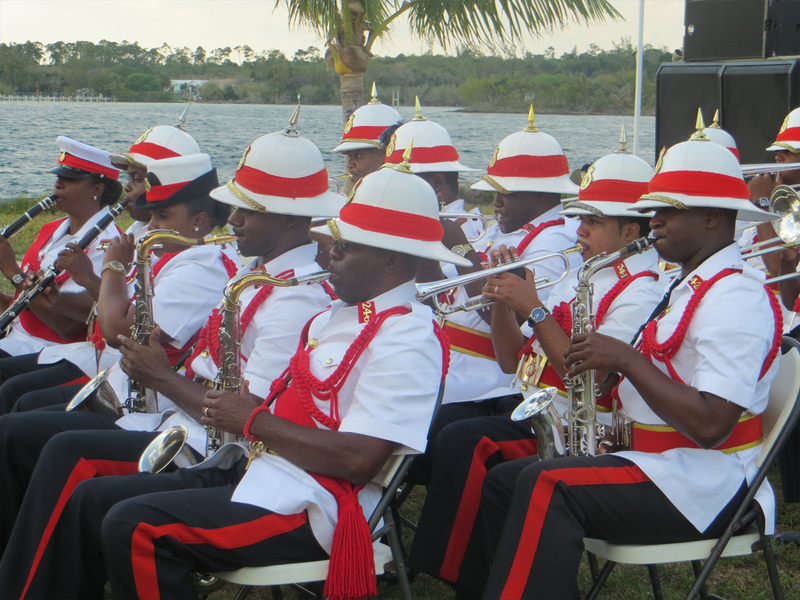 It has been several years since we endured the passage of cold fronts in the northern Bahamas. Our memories of these weather events are still quite vivid. As a result of this experience, we have the highest degree of respect for the powerful punch these storms can deliver. Returning to the Bahamas after a three-year hiatus in the Eastern Caribbean, requires an adjustment in our manner of seeking protection from stronger winds and squalls. Cold fronts originating in the North Atlantic rarely reach the Eastern Caribbean. Wind direction in the Windward and Leeward Islands is nearly always from the east. The tactic for protection from robust easterly winds is simply to anchor in a harbor that provides a protective lee. There are plenty of harbors in the Eastern Caribbean that match this description. Consistent, twenty-five knot, easterly winds are entirely manageable in the lee of a large volcanic island. Cold fronts exiting the U.S. east coast and passing through the shallow waters and low-lying islands of the Bahamas are much different. They bring winds from all directions. As the storm approaches, the wind builds gradually as it clocks from the south to the west to the northwest. As the front passes, the wind peaks in velocity as it clocks to the north and northeast. Eventually, the prevailing easterlies resume. This normally signals a return to settled weather. Completing this cycle, the boat will have swung a full 360 degrees around its anchoring point. The most significant threat stemming from the rotation of wind is that the anchor may become dislodged from the seabed as the boat spins around in a circle on the surface. A dragging anchor is always a concern when the wind shifts significantly in direction, as in the passage of a cold front. Thankfully, cruising sailors have an asset in the person of marine weatherman extraordinaire, Chris Parker, whose daily forecasts provide information on approaching cold fronts four or five days before their arrival. 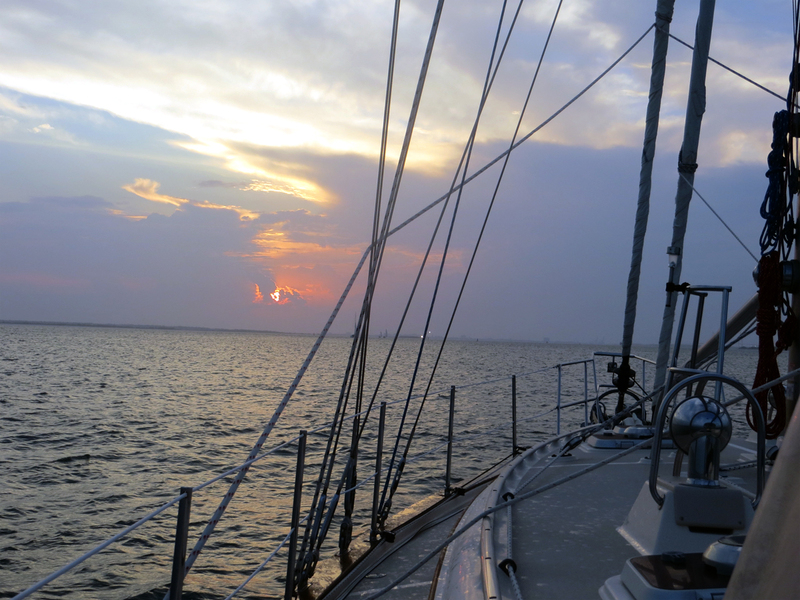 Each day aboard Cutter Loose begins in the same manner. 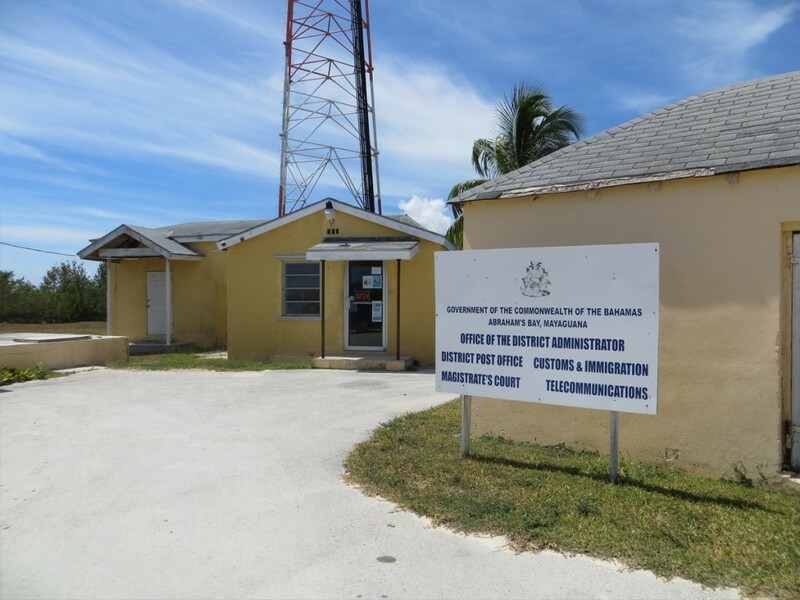 At 6:30 AM, the high- frequency, single-side band transceiver is tuned to Chris Parker’s broadcast of the marine weather forecast for the Bahamas. This is one of the highlights of our day, as weather dictates our every move. Since there is a limited number of protected (360 degree) harbors in the Bahamas in which to seek shelter, the prudent sailor must begin to consider alternative, bail-out destinations when Chris Parker first mentions the possibility of a frontal passage in his forecast. 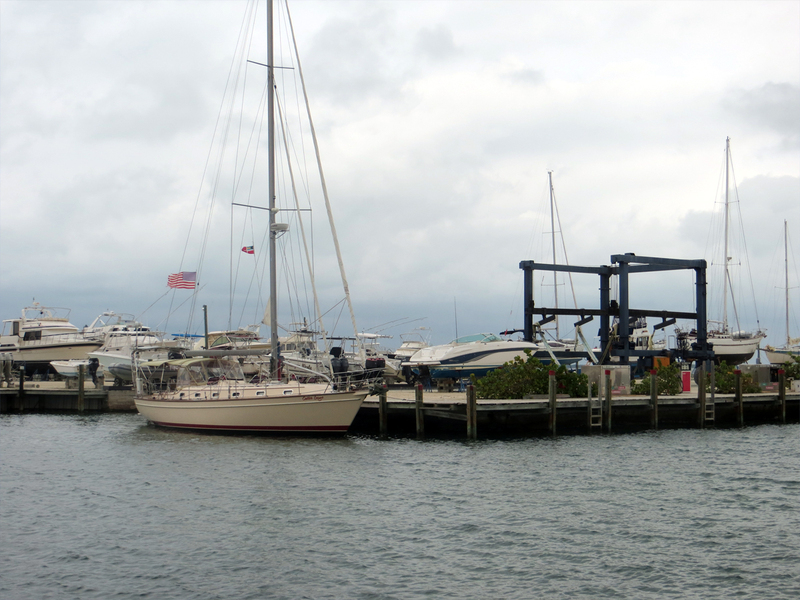 When a storm is approaching, well-protected harbors fill rapidly with cruising boats. It is preferable to arrive a few days ahead of a frontal passage to insure an optimum anchorage spot in the harbor and to allow the anchor to settle into the seabed. Since we have been making steady progress to the northwest every day since leaving Provo, a multi-day pause in the action is most welcome. Already, signs of an impending change in the weather have become obvious. Friday is sunny but blustery with southerly winds. With lighter winds clocking west, Saturday is devoted to exploration of Clarence Town on foot. Our first stop is at the True Value grocery store to buy bread and eggs while visiting with 81 year old proprietor, philosopher and local historian, Mr. Ancel Pratt. Clarence Town is the capital of Long Island and is home to 350 residents. 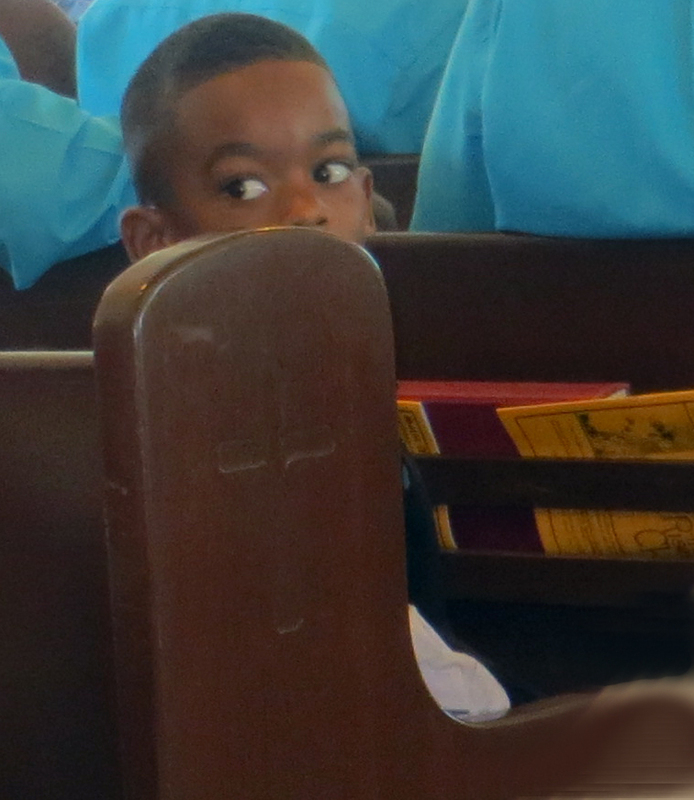 There are two churches in this town…one Anglican/Episcopal and the other Roman Catholic. 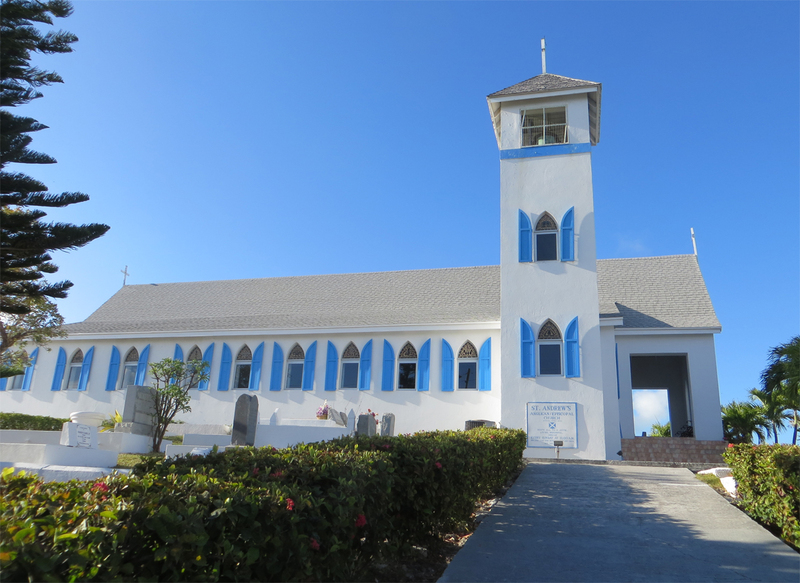 Both churches were designed by John Cecil Hawes, better known as Father Jerome, an architect-turned-priest who dedicated his life to building and re-building churches and convents in the Bahamas. Father Jerome initially designed and built the Anglican Church in Clarence Town. After an extended absence from the Bahamas, he returned here as a Catholic priest to build the Saint Peter and Paul Cathedral. 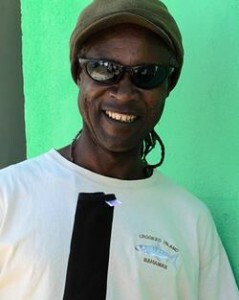 His influence is felt primarily in Nassau, Cat Island and Long Island. Now deceased, Father Jerome is remembered fondly by Bahamian people everywhere. Providing a well-deserved break for the food service director aboard Cutter Loose, our lunch stop today is at the Flying Fish Marina. This freshly painted, 18-slip marina caters primarily to sport fishing enthusiasts. 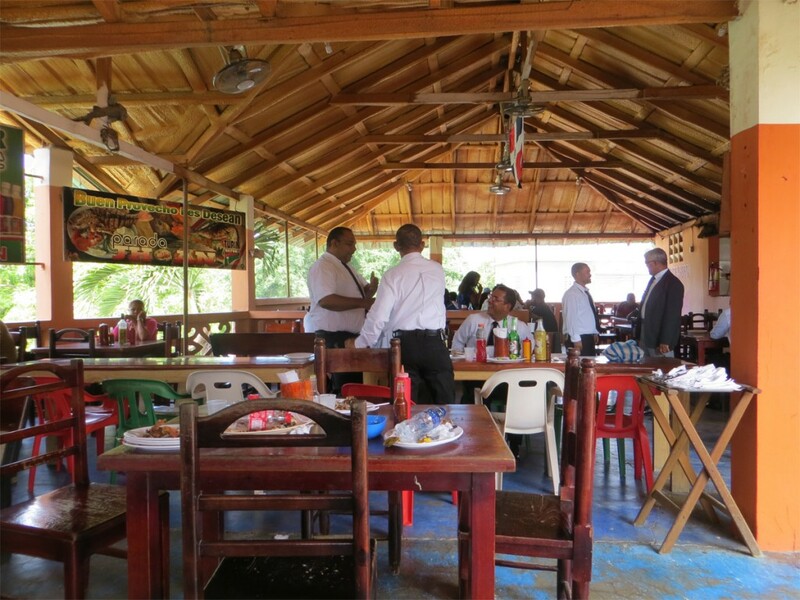 The new owners of Flying Fish have made a sizeable capital investment in the facility. 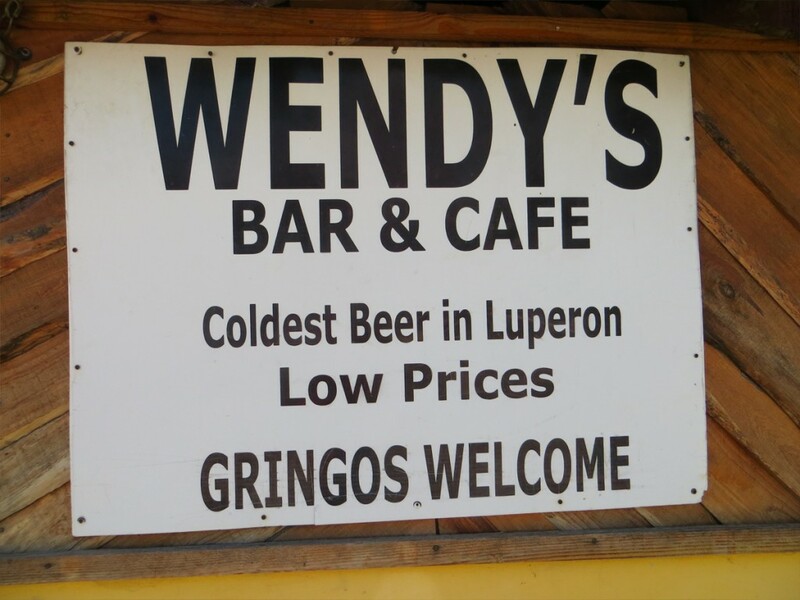 They promote their marina as the last stop for fuel before entering the Caribbean. By late afternoon on Saturday, the wind has increased to 15 knots out of the northwest as darker clouds descend upon Clarence Town. Cutter Loose cannot decide whether she prefers to lie to wind or to the tidal current which enters and exits the harbor through several cuts in the reef to the east. As the wind clocks north and increases in intensity, surge wraps around Strachan Cay creating an uncomfortable roll in the anchorage. Throughout the early morning hours, we are awake frequently, checking wind speed, wind direction and our relative position in the harbor. All is well. There is no cause for concern. Just before dawn on Sunday morning, the cold front finally passes, as evidenced by a wind shift to the northeast. Peak sustained winds from this storm are in the 20-knot range with gusts to 25. 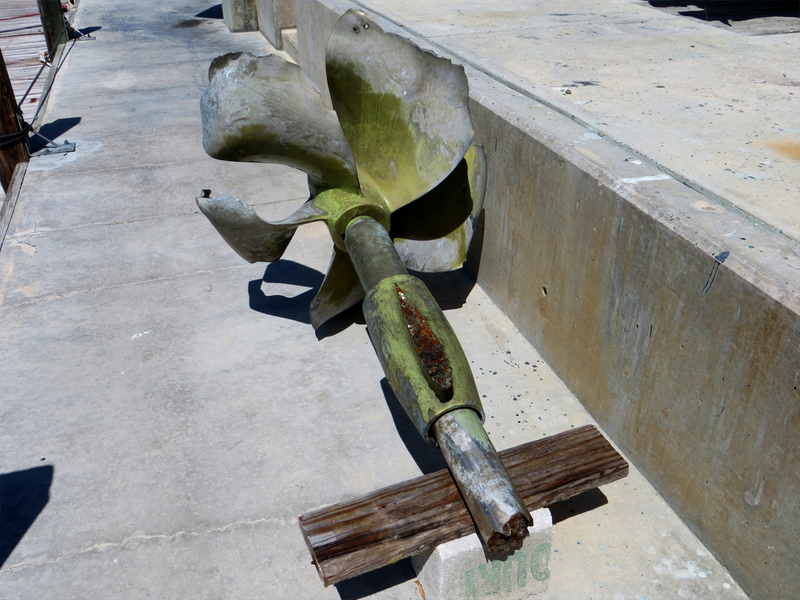 Despite the 300-degree rotation, our anchor remains securely planted due to the excellent holding afforded by the sandy seabed. On Sunday, the sky remains filled with threatening, grey clouds and the northeast breeze remains fresh at 20 knots. The temperature and humidity have dropped considerably as cooler, dryer air settles in behind the front. Although the thermometer in the cabin reads 74 degrees, it feels downright chilly aboard Cutter Loose. Since it is too cool to lounge in the cockpit, we remain huddled below in the cabin with the hatches and ports closed. What a marked change in weather from the Eastern Caribbean! Our personal thermostats are not quite ready for the northern climate. Despite the fact that it has been rollier than we would have preferred, this harbor has served a useful purpose. First and foremost, we are safe and refreshed. The harbor offers excellent holding. 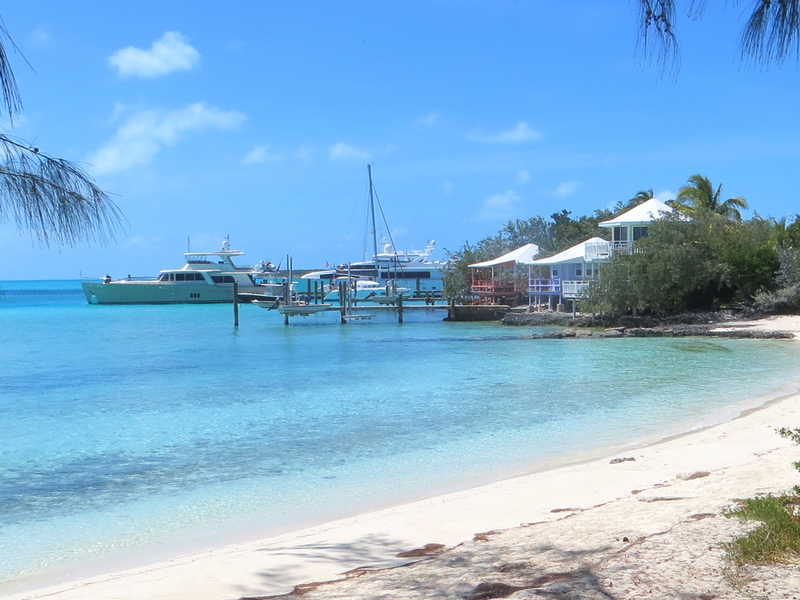 Strachan Cay blocks the full brunt of northerly and northeasterly winds in a blow. Clarence Town, albeit small, provides an opportunity for exercise, dining and other shore-side diversions. Despite the unsettled weather, we have enjoyed our relaxing visit to Clarence Town. On Monday, Cutter Loose is bound for South Point anchorage at the southern tip of Long Island. South Point will serve as a staging area for our visit to the Jumentos Cays. The timing of our departure from Ocean World Marina is a complicated decision. Saturday’s forecast calls for moderate winds with 8 foot seas. On Sunday, the seas are expected to settle down considerably, but there may be insufficient breeze to sail to the Turks and Caicos. Beyond Sunday, an extended period of moderation in the weather will shut off the supply of wind completely. 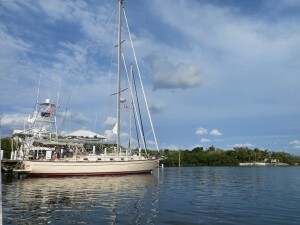 Not wishing to motor 100 miles to Great Sand Cay, the decision is reached to depart Ocean World at 8 AM on Saturday morning. Ocean World Marina is similar to the saga of Hotel California. Getting into the marina is relatively easy. Departing Ocean World Marina is yet another story. Under normal circumstances, it would have been our preference to depart on a journey of this magnitude at 4 PM, arriving in Grand Turk just after sunrise. However, the weather pattern on the north coast of the DR precludes a late afternoon departure from Ocean World. The entrance channel to the marina is exposed to the northeast and the prevailing wind direction is ENE. In order to avoid powering through huge waves on the bow, it is critical to depart before 9 AM when the wind is still relatively calm. By mid-morning, the wind typically reaches 20 knots. In late afternoon squalls, wind speeds are even higher. At precisely 8 AM on Saturday, we are in the marina office to settle our account and to clear Customs and Immigration. Today, the Customs officer arrives 90 minutes late. 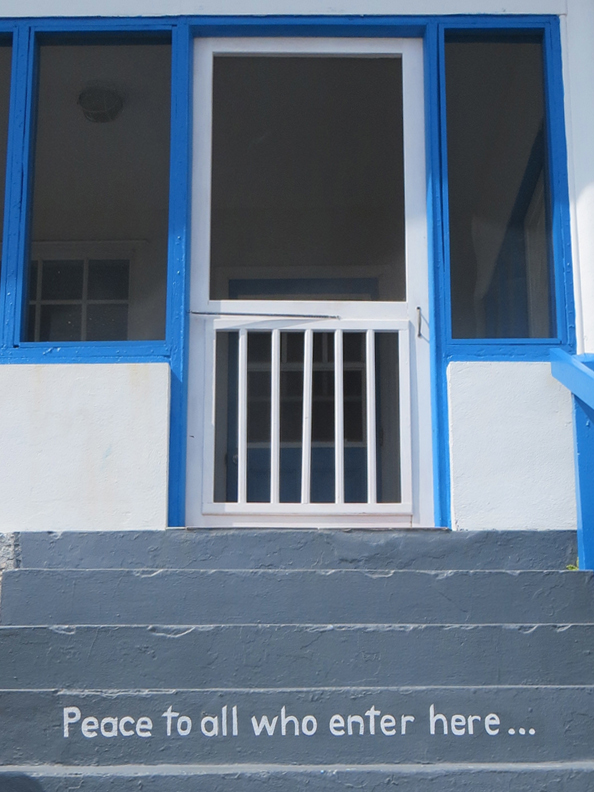 Since he has forgotten the key to his office, “Navy” (our new friend and resident naval officer) is recruited to jimmy a sliding window in order to gain access to the office. After clearing Customs, Navy accompanies us to the dock where the final Despacho document is signed and delivered. Part of Navy’s official duties is to observe the departure of our vessel from the marina. At 10 AM, the dock lines are cast off as we bid a final adios to Navy. Cutter Loose is finally underway…hobby-horsing her way under full power into 6- foot waves in the channel. After 15 minutes of rocking and rolling, the sails are set for a rollicking beam reach to Big Sand Cay in the Turks and Caicos. 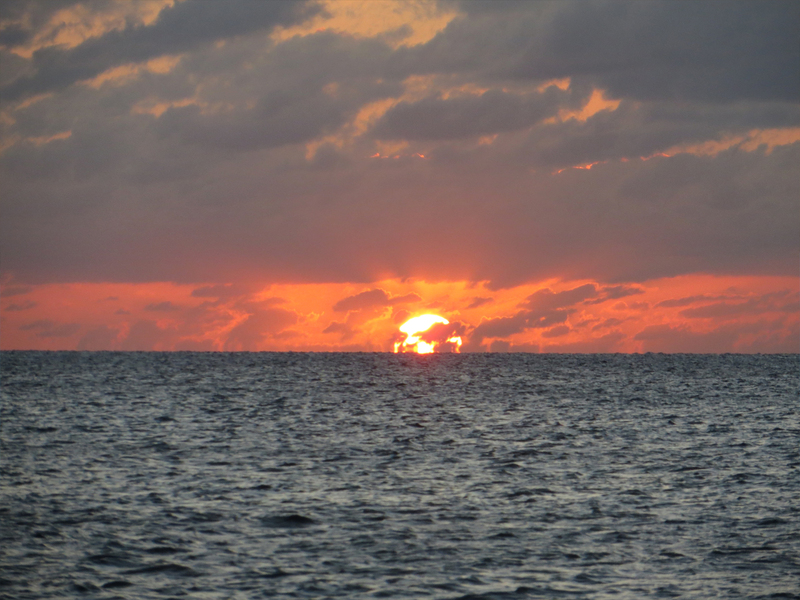 A few miles offshore of DR, the wind freshens to 23 knots with gusts to 28 knots while the waves increase to 8 feet. Under a deeply reefed mainsail and genoa, Cutter Loose is sailing smartly at 8+ knots, spreading a shower of salt over everything in sight as she surges through the northeast swell. Each time the wind subsides to 18 knots, we are certain that this signals the moderation promised in the forecast. But this hope proved to be wishful thinking. At 11:30 PM, Cutter Loose passes Endymion Rock to port on final approach to Big Sand Cay. Since this is the site of numerous shipwrecks, caution and concentration are the watchwords of the evening. 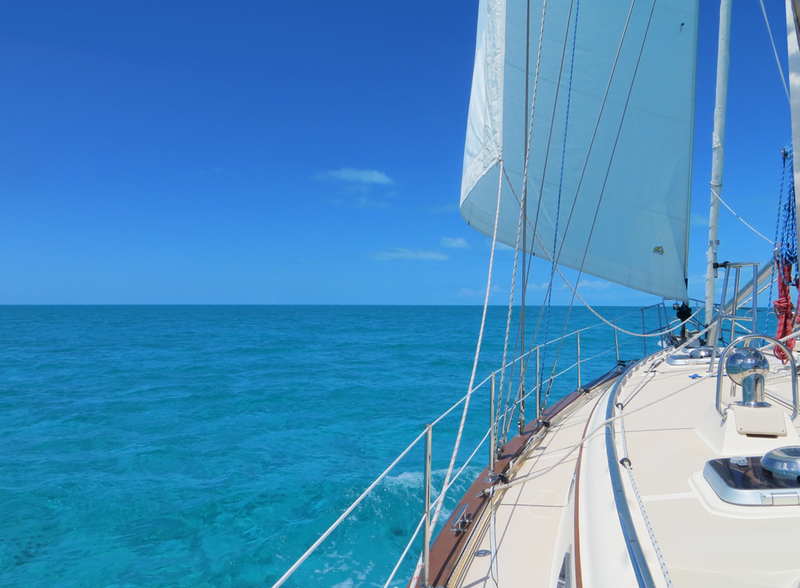 Falling into the lee of Sand Cay, the sails are doused as we thread the needle into the anchorage. Suddenly the waves subside but the wind continues to howl over this low-lying, sandy spit of an island. Using radar and chart plotter, we ease our way through the darkness, gradually moving closer to the beach while allowing sufficient distance from an anchored boat to starboard. Entering an unfamiliar anchorage at night is stressful under any circumstances, let alone after pounding through eight foot waves for 14 hours. Fortunately, the hook sets instantly in 15 feet of water over a sand bottom. There is a rolly surge in the anchorage. The wind is whistling through the rigging. But, there is no motion or noise that can deter us from falling instantly and deeply asleep. At 8 AM on Sunday, the relentless cries of shore birds slowly penetrate our consciousness. Still groggy from a deep sleep, we are afforded a view of our surroundings that was obscured by the black of night just eight hours earlier. It is as if we are children on Christmas morning. A magnificent gift awaits our awakening. Just beyond the bow of Cutter Loose is a pristine white sand beach. 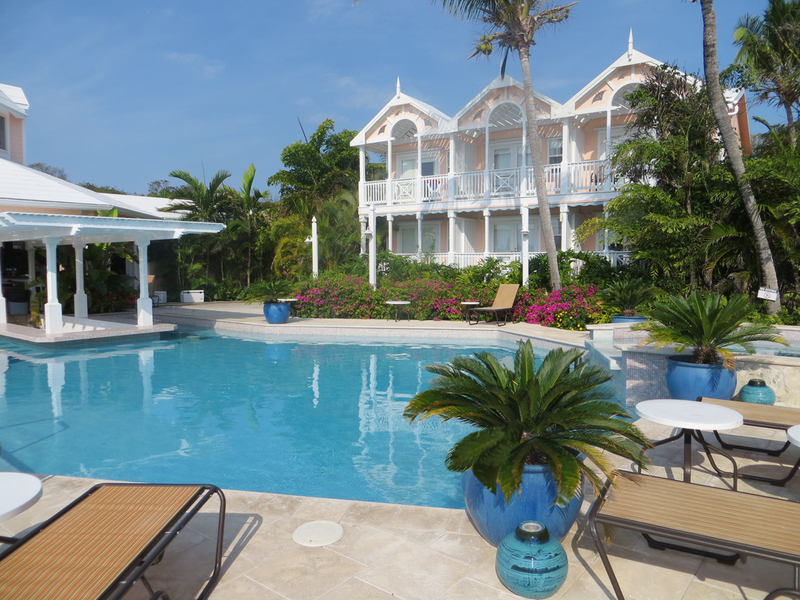 We are surrounded by electric aquamarine water made brilliant by the morning sun. There is a gentle hint of a breeze from the east. The moderation in the weather we had hoped for the night before has finally arrived. 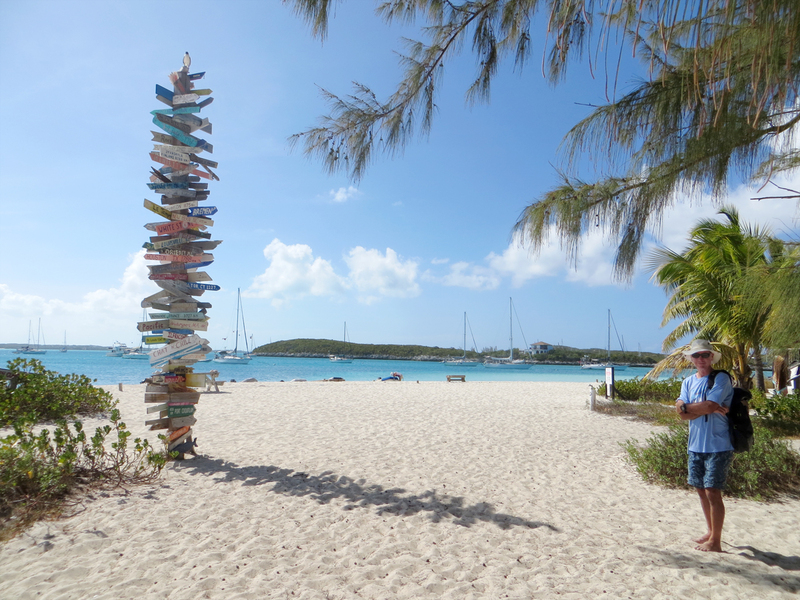 Sand Cay makes for an outstanding welcome to the Turks and Caicos Islands. We already feel at home in this remote place. After lingering at Great Sand Cay until noon, the anchor is up and Cutter Loose is bound for Grand Turk, about 18 miles to the north. In 12 knots of breeze on the beam, today’s sail is a leisurely event with 4 to 5 knots of boat speed. Salt Cay passes slowly to starboard. The unmistakable boxy outline of a cruise boat on the horizon serves as a convenient steering target. The southeastern tip of Grand Turk is a cruise boat destination, inasmuch as it is the sole deep water port in the Turks and Caicos. Accordingly, the Turk economy is largely oriented to the cruise boat trade. The designated anchorage area just off the beach near the cruise boat dock is filled with local excursion boats on moorings, but we manage to drop the hook in a small opening on the periphery of the anchorage area near the concrete cargo ship pier. Our mission this afternoon is to clear Customs. Customs officials everywhere are notoriously feisty with cruisers about clearing in as soon as possible upon arrival. After landing the dinghy and scaling the walls of the massive pier, we learn from Port Authority employees that Customs officials have departed for the day and cannot be reached by telephone. Therefore, clearance must wait until Monday morning. Once today’s cruise boat departs at 6 PM, the loud music disappears as the beach chair vendors pack away their umbrellas for a few hours of relaxation before a new wave of cruise boats arrive at dawn. At 9 AM on Monday, we re-scale the massive concrete pier and enter the Customs office with a warm greeting. After a brief explanation of our efforts to clear in on Sunday afternoon, the Customs officer explains that we will be charged a $15 “overtime surcharge” for arriving during the weekend. The fact that no Customs officer was on duty at the time of our arrival is irrelevant. The fact that our actual clearance took place on Monday morning is also irrelevant. According to Customs officials, it is the day of arrival, not the day of actual clearance that triggers the overtime fee. Although it seems like a technicality, we smile and go along with this verdict. It is simply not prudent for visitors to question a $15 Customs overtime fee. Likewise, it is not the time or place to suggest the novel notion that “overtime surcharges” be contributed to a fund for the construction of a decent dinghy dock. 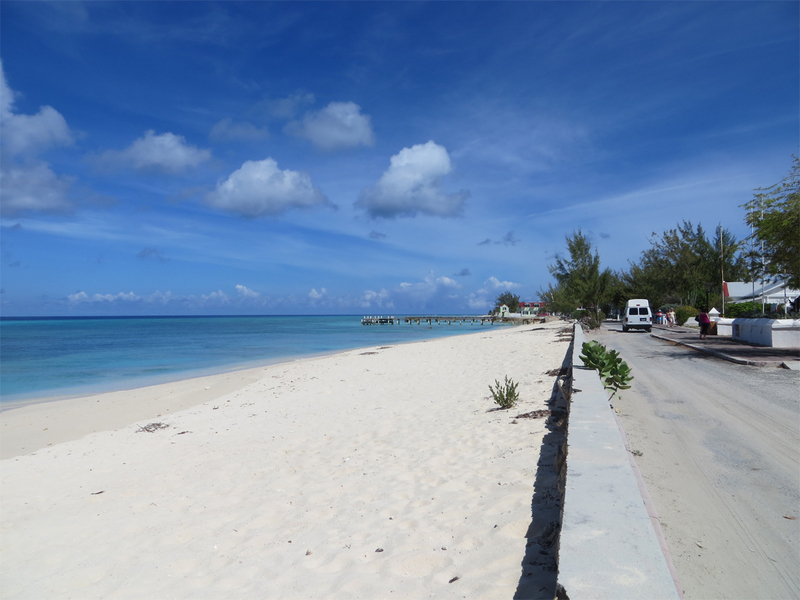 Since it is off the beaten path, relatively few cruising boats clear in or out at Grand Turk. Besides, these employees don’t make the rules…they simply enforce the law of the land. Without exception, we are treated warmly and politely by these public servants. 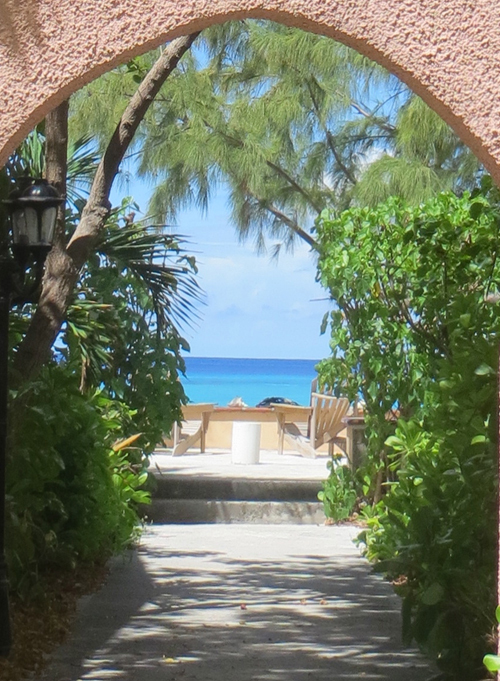 Once Immigration officials arrive to stamp our passports, we are free to cruise the Turks and Caicos for seven days. A longer stay will require a more expensive cruising permit. 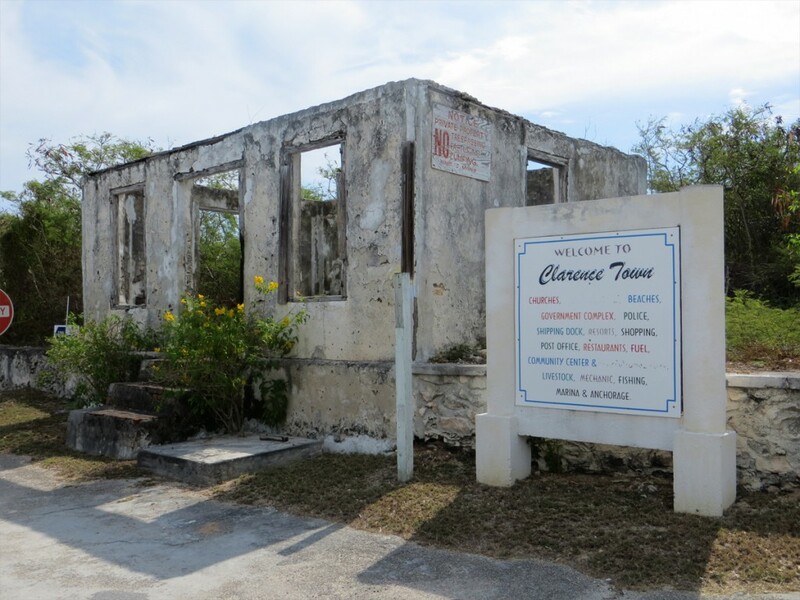 With clearance documents in hand, it is a long, two-mile hike past the airport to Cockburn Town, the Capital of the Turks and Caicos. Shuttle buses are already delivering cruise boat passengers to the Front Street historic district. 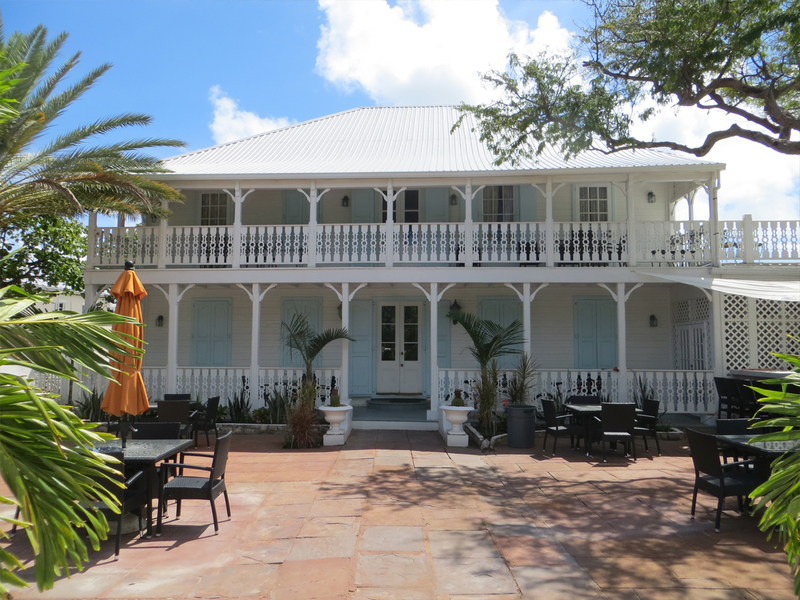 There are a handful of historic buildings, small restaurants, guest houses and boutique hotels that line the waterfront. Merchants are busy hustling their wares to the tourists. But there is no evidence that this sleepy village is the nerve center of a national government. Nor is there any sign whatsoever that this community is an international banking center for clients that wish to stash cash in anonymous accounts. Waiting for a taxi to South Dock where Cutter Loose is anchored, Pat discovers a rumpled $5 bill along the sidewalk. About this time, a gentleman in a pickup truck stops to ask if he may offer us a lift. We crawl into the truck and arrive at South Dock within a few minute’s time, contributing our newly found cash to the cause. The driver initially refuses to accept our contribution, but we insist and he relents. The Turks are genuine and kind. At 1 PM, the anchor is up in Grand Turk. Cutter Loose is bound for Cockburn Harbor on the island of South Caicos, some 25 miles to the west. The wind has disappeared almost entirely by the time of our departure. As the afternoon progresses, cumulus clouds overhead begin to thicken and spill their excess cargo of moisture. This mild squall serves the dual purpose of creating enhanced wind to boost boat speed while rinsing the outermost layer of salt from the decks. By 5 PM, the anchor is down in Cockburn Harbor. Cutter Loose is one of three cruising boats at anchor in the harbor tonight. After a quiet night at anchor and the daily 6:30 AM synopsis and windless forecast from marine weatherman Chris Parker, Cutter Loose is under way again at 7:30 AM on Tuesday. Today’s 60-mile journey takes us south to Fish Cays, then northwest across the shallow Caicos Bank to Providenciales, or “Provo” for short. Water depths on the Bank are in the 10 foot range. The bottom is white sand. Today, the underside of clouds overhead are tinged in a light green…a reflection of the sun’s rays bouncing off of the colorful water below. There is barely sufficient wind today to keep the head sail full. Barring a few small fishing boats, Cutter Loose is the sole vessel transiting the Banks today. It is as if we are sailing in our very own infinity pool. Our primary navigational task today is to recognize and steer around coral heads that appear as black holes in the iridescent blue-green water. 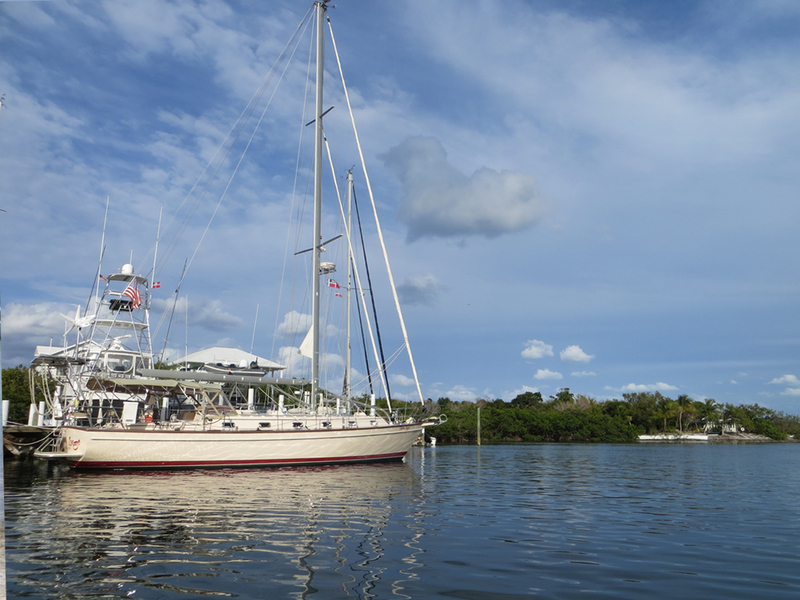 Following a night at anchor in Sapodilla Bay, we arrive at high tide to negotiate the thin entrance channel to Southside Marina. 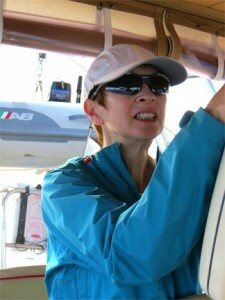 Here we will clean the boat, tend to the laundry and rent a car for provisioning and sightseeing. 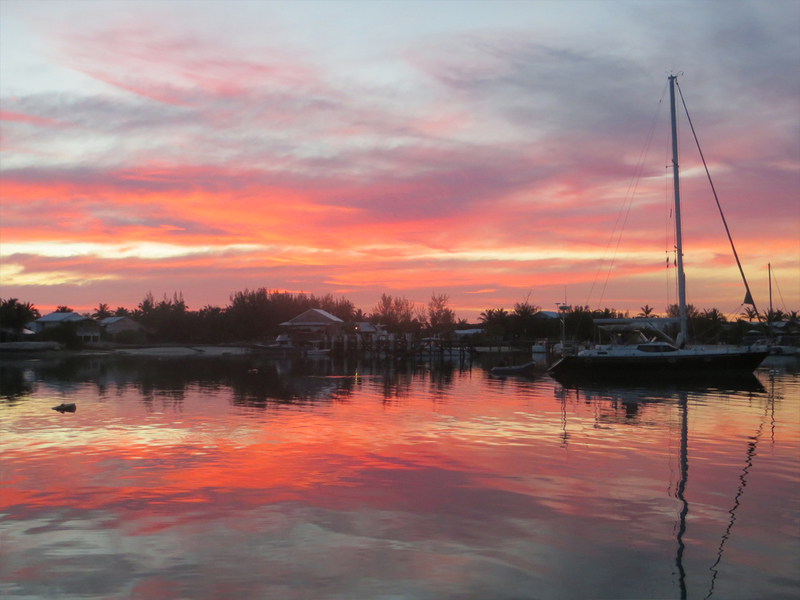 Sapodilla Bay and Southside Marina are the most popular cruiser destinations in the Turks and Caicos. Bob Pratt owns this 22-slip marina and serves as the controller for the 7:30 AM cruiser’s net on VHF 68. Upon our arrival, Bob takes time out of his busy schedule to drive Pat to an appointment with the hairdresser. 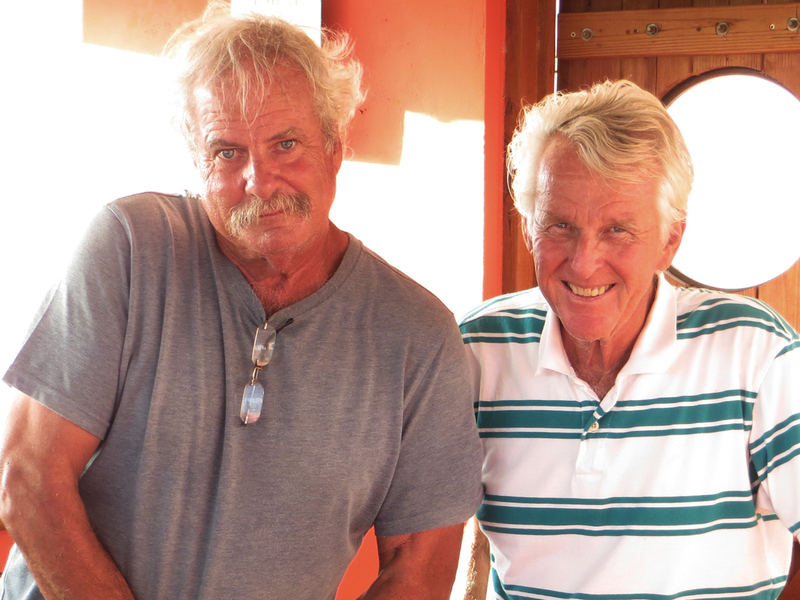 Bob’s childhood chum, Cam (on left) from British Columbia, spends several months here during the high season, lending a helping hand with the operation of the marina. Together, they are a dynamic duo. We have thoroughly enjoyed their hospitality. 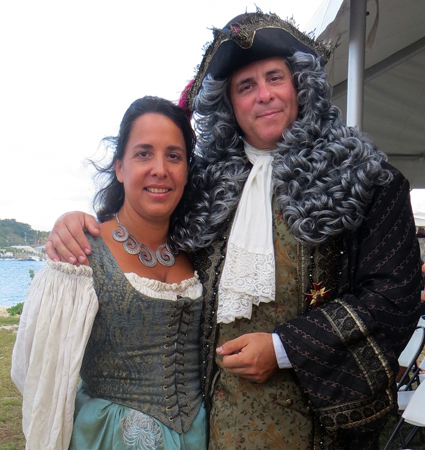 On Wednesday evening, there is a potluck dinner at the marina where we meet several intrepid cruisers that are bound for the Caribbean via the “Thorny Path”. These folks are elated with the weather forecast in light of the fact that the wind is expected to remain light for the foreseeable future. This is good news for eastbound sailors who are accustomed to motoring. For westbound sailors, the lack of sufficient wind to sail is a disappointment. It means that we will be listening to the sound of the engine more than we would have preferred. Feast or famine is the dilemma faced by cruising sailors everywhere. On Thursday, we are off in the rental car to explore the island. Provo is the polar opposite of Grand Turk. There are no cruise ships here because of the absence of a deep water port. The four-lane Leeward Highway is busy with traffic, particularly at the numerous roundabouts in the early morning and late afternoon hours. Provo’s north coast beaches are dotted with high- rise condo towers, perfectly manicured resorts, trendy restaurants and mixed use shopping districts. At times, some of the more upscale neighborhoods here in Provo seem more like West Palm Beach, FL. The cynical view of Provo is that it resembles a suburb in Florida rather than a Caribbean destination. 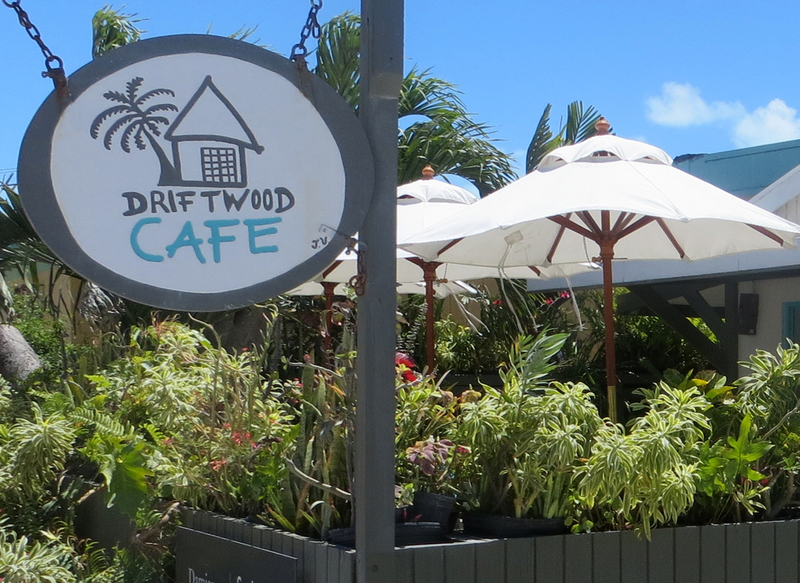 From our perspective, Provo is an excellent place to provision the galley and enjoy a good meal ashore before heading to the remote out islands of the Bahamas. One additional benefit of securing a slip at Southside Marina is that it is an official port of entry. This means that Customs and Immigration officials come here, as needed, to provide clearance services. This eliminates the need to scale the commercial pier at South Dock to obtain outbound clearance. Another $15 “overtime fee” is incurred for a Friday afternoon clearance because our intended departure will occur on the weekend. 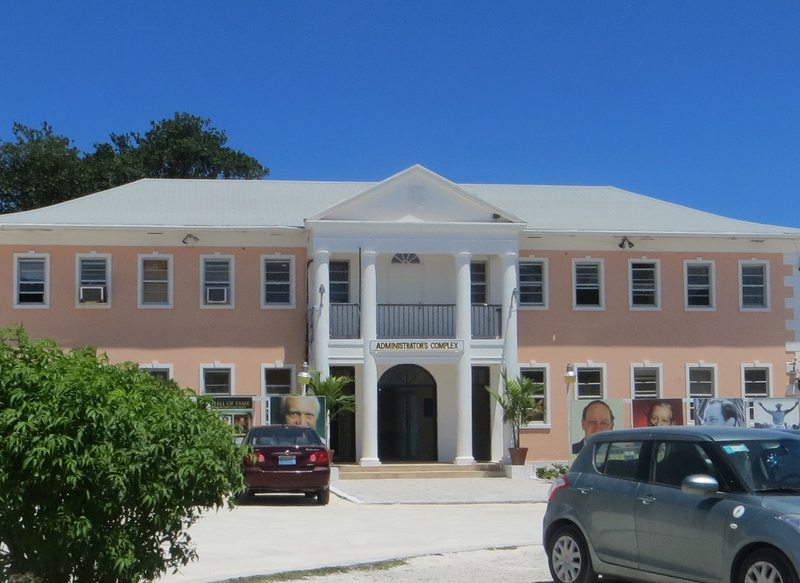 At this stage of our visit to TCI, the issue of overtime fees has become an inexpensive source of entertainment. It is all part of the island experience. Our mission is accomplished in Provo. For us, the Turks and Caicos have always been perceived as a convenient stepping stone rather than a must-see destination unto itself. As such, this visit has exceeded our expectations. 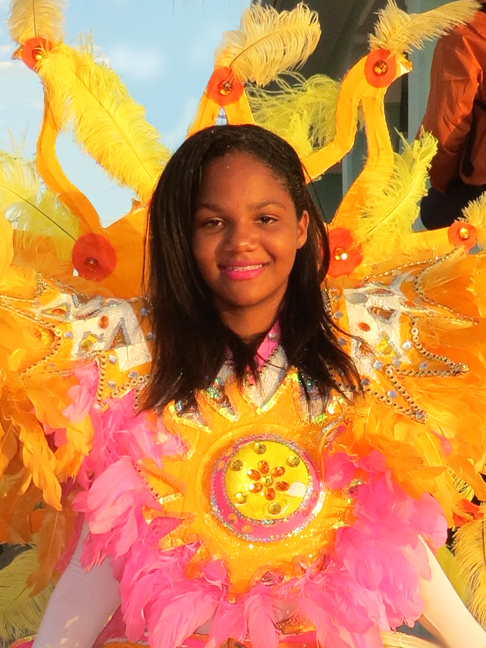 On Sunday, March 22nd, Cutter Loose is bound for the island of Mayaguana in the Bahamas. This is what happens to the underwater running gear when a 100 foot motor vessel traveling at a speed of 25 knots runs aground on an underwater reef. The damaged vessel (not Cutter Loose) was towed to Southside Marina. The Captain was fined $10,000 to cover the cost of repairs to the damaged reef. The insurance company declared the vessel a total loss. One of the reasons we elected to make landfall in the DR at Ocean World Marina involves clearance procedures that are reputed to be less cumbersome and threatening than in other ports of entry into the Dominican Republic. We have heard all manner of stories from other cruisers about bribes blatantly sought by customs officials at the time of entry. No doubt these stories have been exaggerated over time to add interest. Lying alongside the fuel dock on Monday morning, a boarding party of local officials asks for permission to step aboard Cutter Loose. Included in this gathering is Victor, the General Manager of the marina, a Customs official and a Navy officer dressed in a camouflage khaki uniform with highly polished combat boots. Victor also serves as the official translator, since the Customs officer and the Navy official do not speak English. Since the delegation does not wish to go below into the cabin, our brief meeting is conducted in the cockpit. First, Victor introduces the delegation and issues two wrist bands that identify us as marina guests. He explains that security here in the marina is very tight and he urges us to wear the wristbands 24-7 until we depart so that the security personnel and other employees can identify us as guests. After reviewing our passports and ship’s papers, we are asked to complete standard clearance forms before being escorted to the on-site office of the Immigration officer. 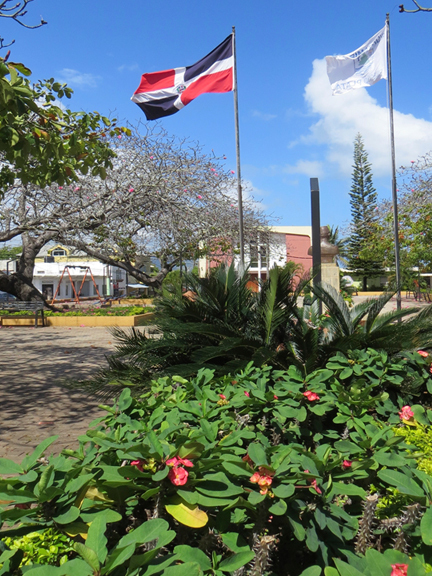 The total entrance fee is $100 USD plus $20 USD for a Dominican Republic bandera (courtesy flag). To our relief, the clearance process could not have been more straightforward. 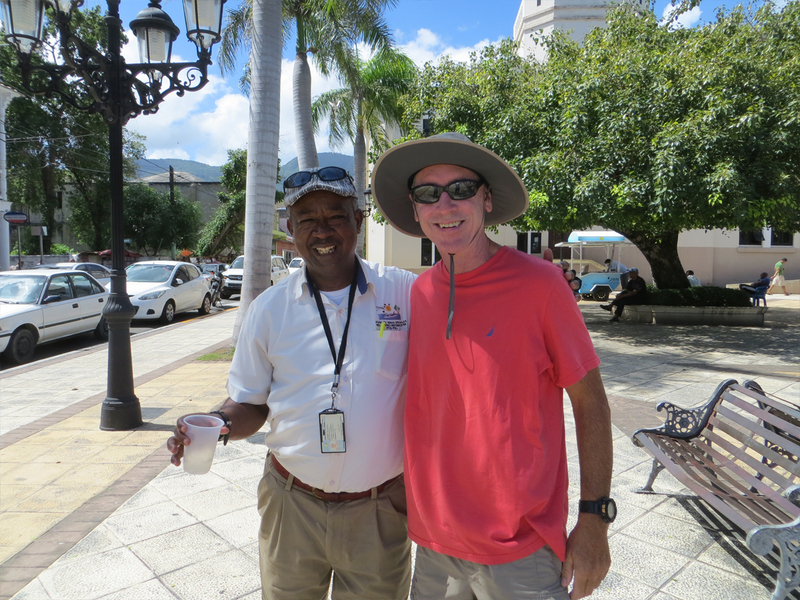 There are smiling faces and handshakes all around welcoming us to the DR. Everyone is very polite and outgoing, including the dock master and his helper who assist us in tying up at our slip. We would later learn that this friendly demeanor is not an act. 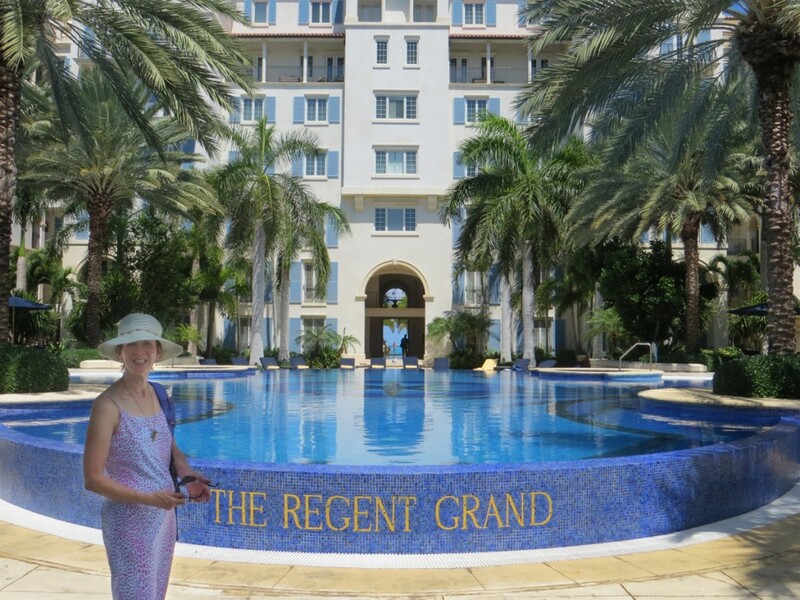 It will hold true not only during our initial check-in, but for the entire duration of our stay at the marina. Each time we pass these cheerful fellows, there are more smiles and handshakes. No sooner are our lines secure than we fall instantaneously asleep for several hours, our bodies and minds craving rest. Later in the afternoon, Cutter Loose receives a thorough and well-deserved wash down from stem to stern. The easterlies howl here on the north coast of the DR. Mornings are usually calm. By mid-afternoon, wind speeds in the marina are in the 20 to 25 knot range with gusts to 30 knots in frequent squalls that roll down to the ocean from the Septentrional mountain range to the southeast. Our original plan was to pause at Ocean World for a day or two before proceeding on to the Turks and Caicos when wind and seas permit. Weather being what it is, it now appears that we will remain here until the weekend when calmer seas are expected. 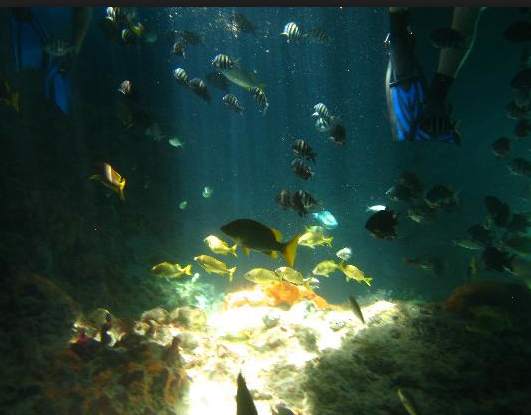 Ocean World is located a few miles west of the town of Puerto Plata, population 286,000. 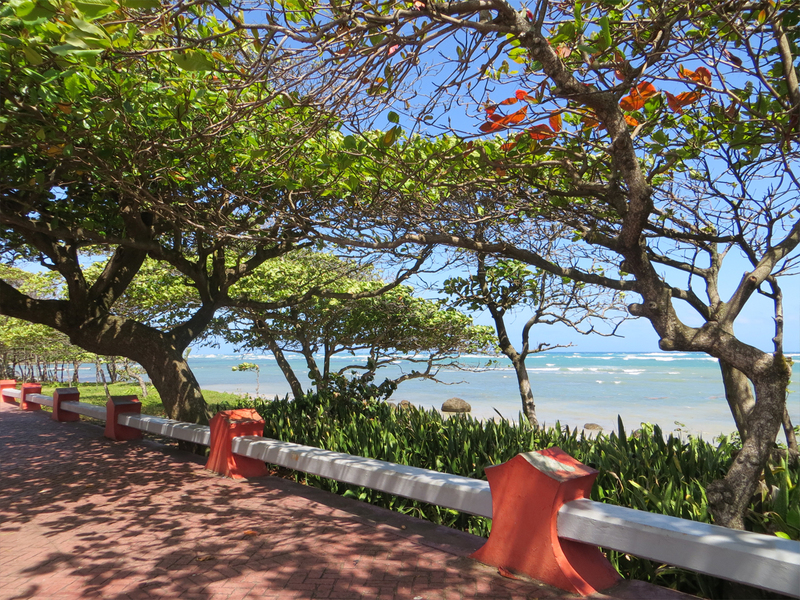 The area west of Puerto Plata has become a popular tourist destination with several all-inclusive resorts having been developed in the past few decades. 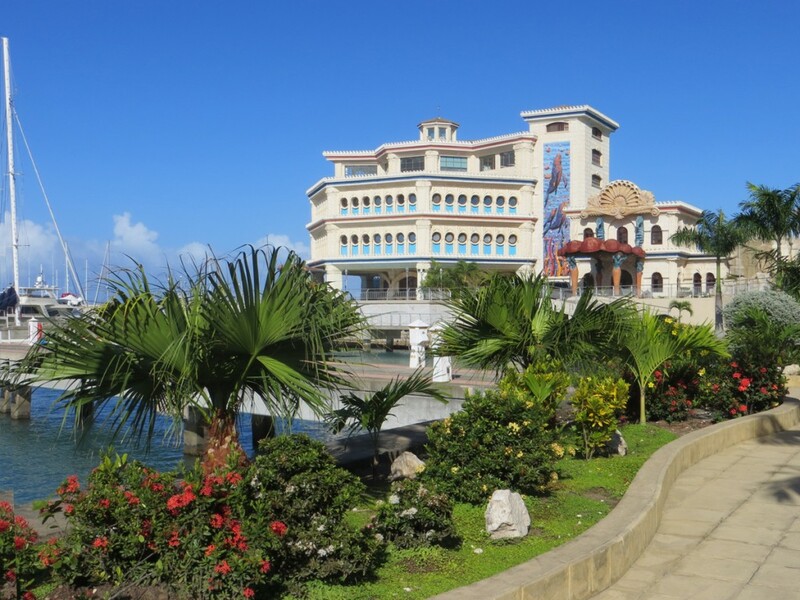 The marina complex includes a casino (presently closed), a nightclub (open on Mondays, Wednesdays and Fridays for a special reserve-in-advance floor show), a restaurant (presently closed), a liquor store/café, guest rooms, and a laundry. 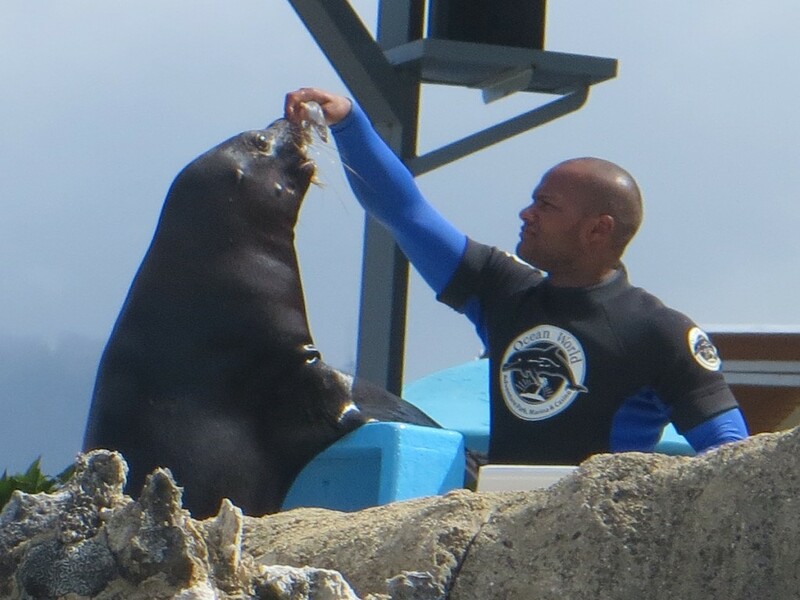 An adventure park is located adjacent to the casino with animal acts (dolphins, sharks, parrots and sea lions) seven times each day. While the view of the show from our slip is limited, we can hear the announcer’s voice, the recorded music that accompanies each act and the enthusiastic response of the audience. By our second day of dockage at Ocean World, we have memorized the antics of the announcer and how the actions of the animals coincide with the recorded music that accompanies the act. Rather than attend the show, it is much more fun to speculate about what is going through the minds of these poor creatures as they are urged by their trainers to perform. It is difficult to place a value on this type of entertainment. Beyond the Ocean World complex is a large resort complex with hundreds of villas, hotel rooms, beaches and several pools. While on a morning walk, we are intercepted by an employee driving a golf cart that volunteers to “show us around the resort”. He drops us at the hotel lobby and hands us off to another resort employee. It all ends badly two hours later when we explain that under no circumstances would we be willing to purchase a membership in their vacation club. 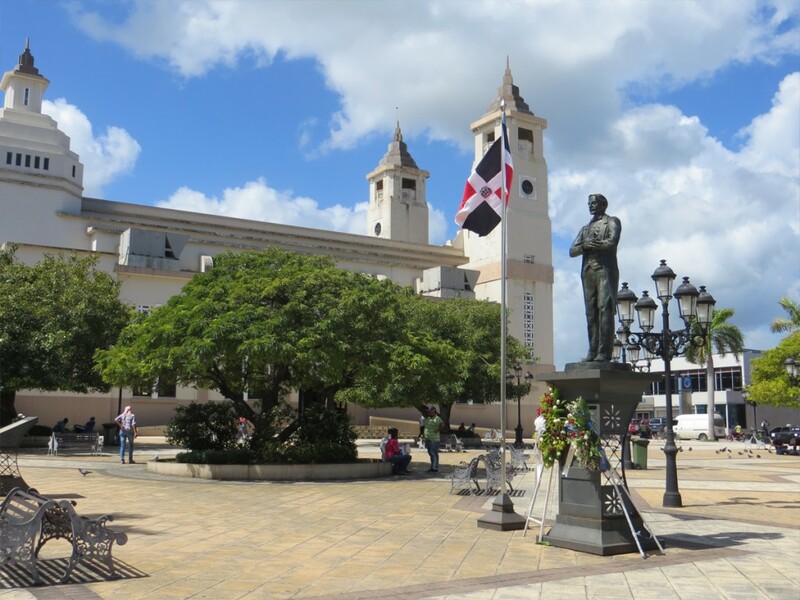 On Wednesday, a rental car takes us on a sightseeing excursion into the town of Puerto Plata. In the town square, we are quickly intercepted by a friendly tour guide. 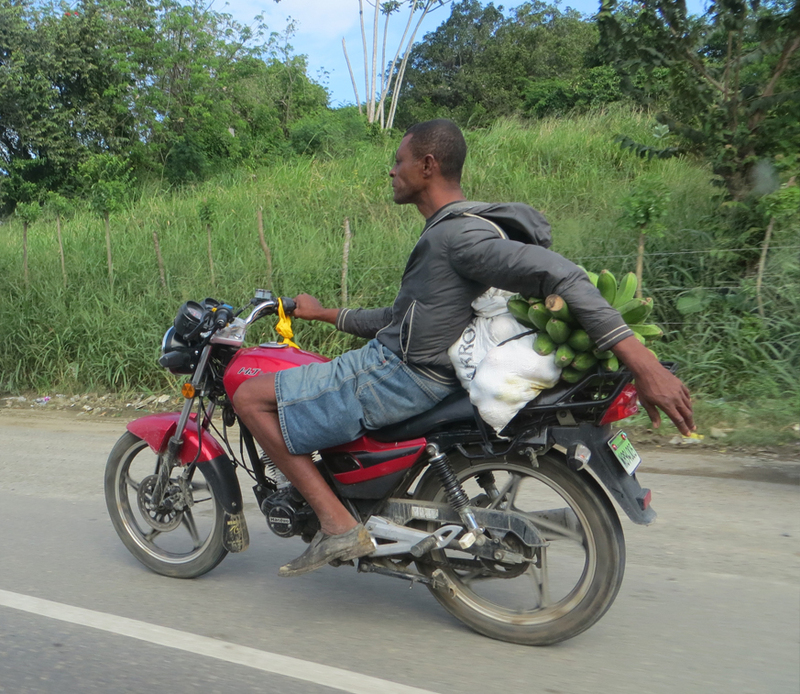 The primary mode of transportation in Puerto Plata is motorbikes. There are literally thousands of them on the city streets. 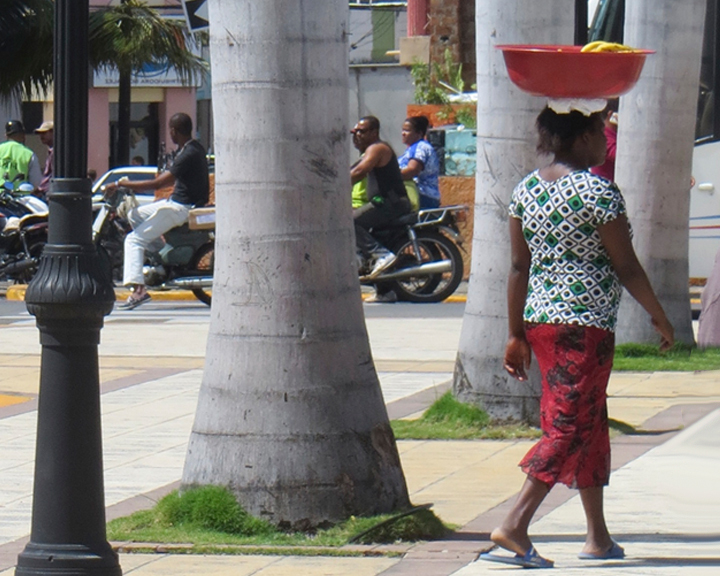 Moto-taxis provide rapid, inexpensive transportation to one’s destination of choice. They rarely ride with the flow of traffic or obey stop signs or traffic signals. 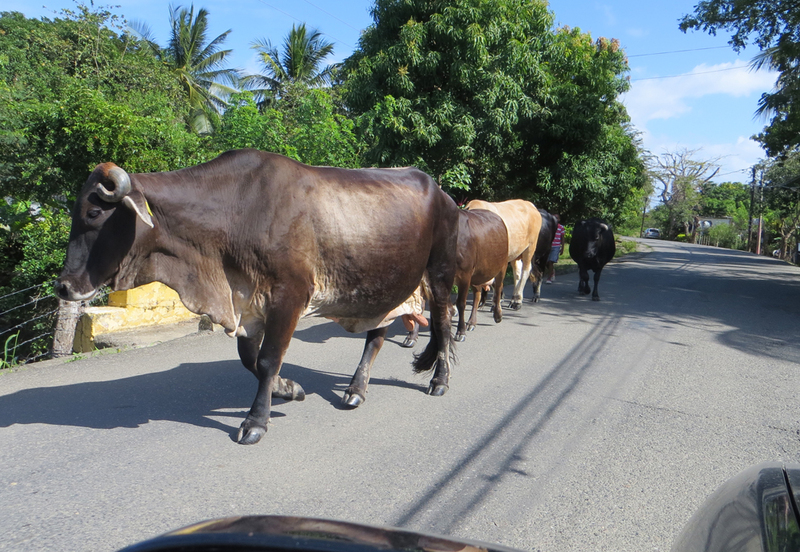 This makes for an interesting driving experience in Puerto Plata. 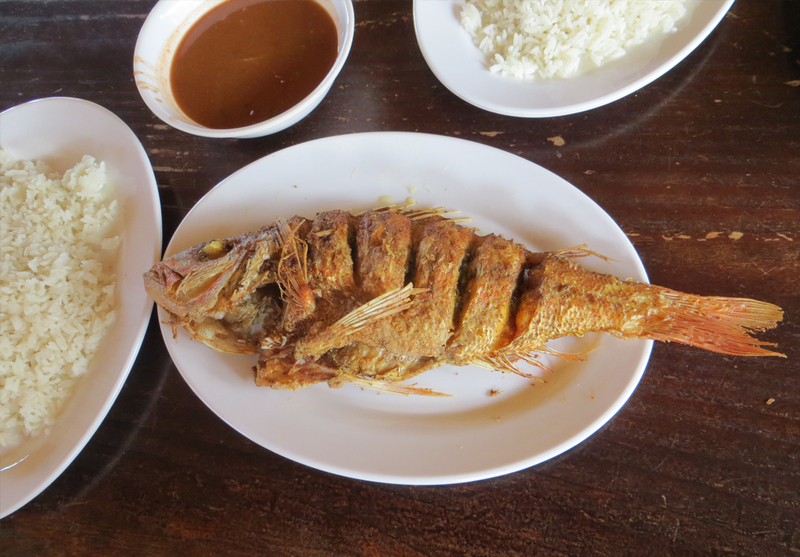 The next stop is Pescaderia Jhoan in the Village of Maimon where we are treated to a fresh seafood lunch consisting of grilled chillo, plantains and red beans with rice. From here, it is on to the tiny seaside village of Luperon, which has become the permanent residence of dozens of cruising sailors who enjoy the authenticity of the town and the affordable lifestyle. Near the waterfront are two bars that offer free WiFi. The anchorage is well-protected, but the water is putrid. This underscores the fact that many cruisers do not require an abundance of amenities in order to feel fulfilled and comfortable. 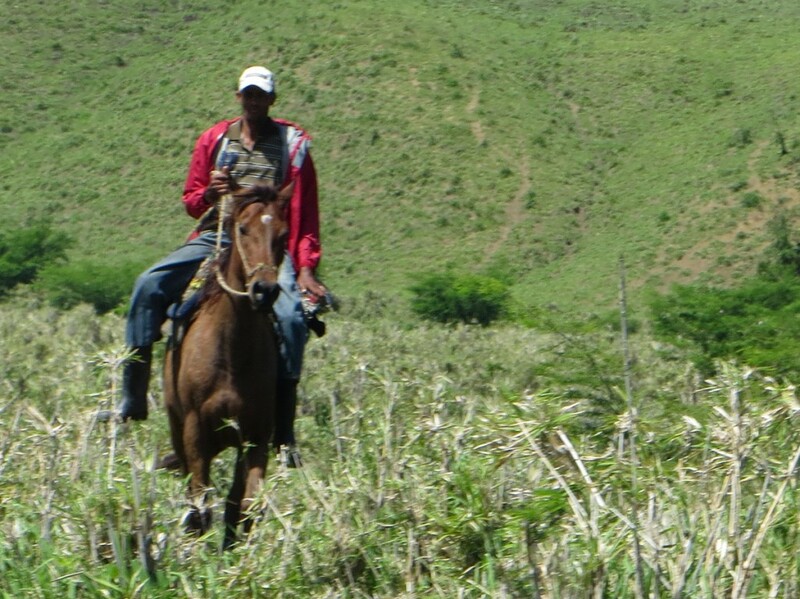 The road to Luperon leads through rural countryside where ranching is a way of life. Along the roadside are gatherings of men and beasts who seem to enjoy one another’s company. Back at Ocean World Marina, we focus on the completion of boat chores in anticipation of a favorable weather pattern this weekend. 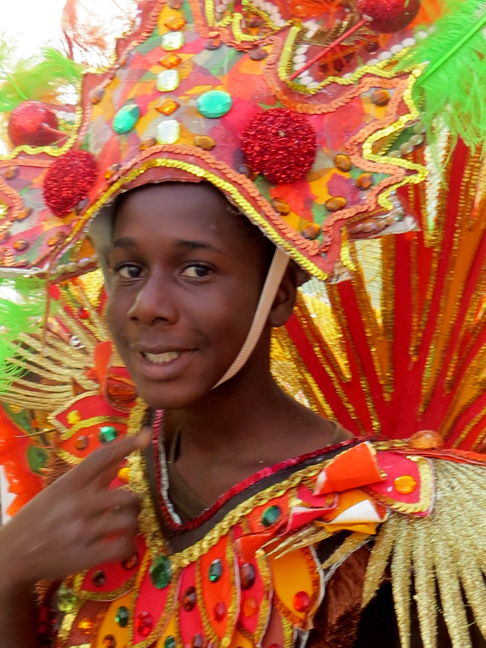 On Saturday, Cutter Loose is bound for Grand Turk.